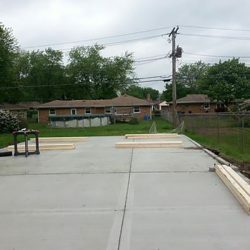 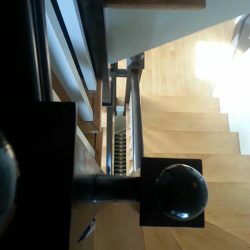 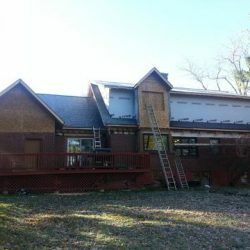 Home and business owners in Orland Park and the Surrounding Areas turn to Scott’s Construction with their most important contracting projects. 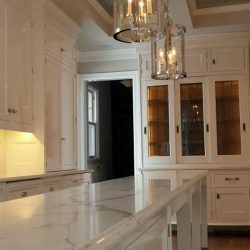 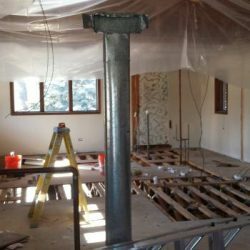 We’re a full-service construction company that provides a wide variety of services for residential and commercial spaces undergoing construction ranging from partial remodeling to a complete renovation. 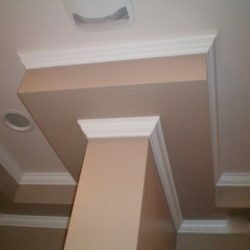 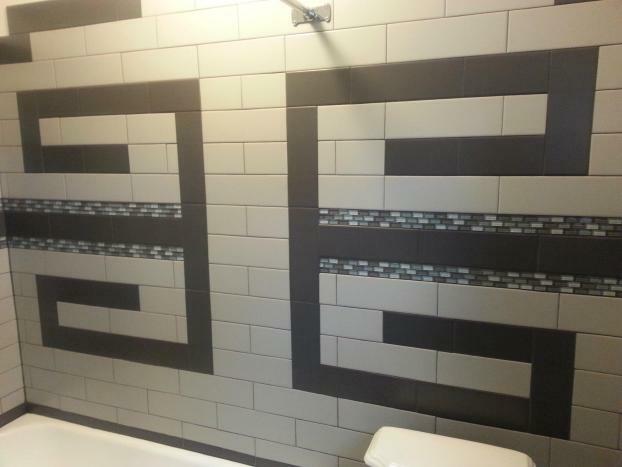 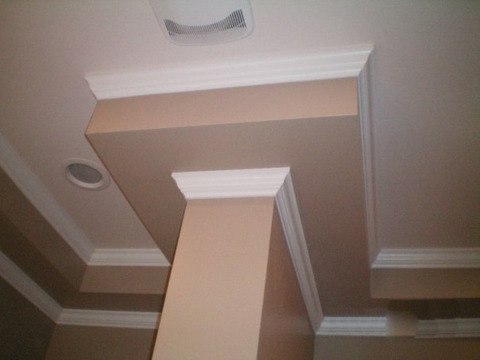 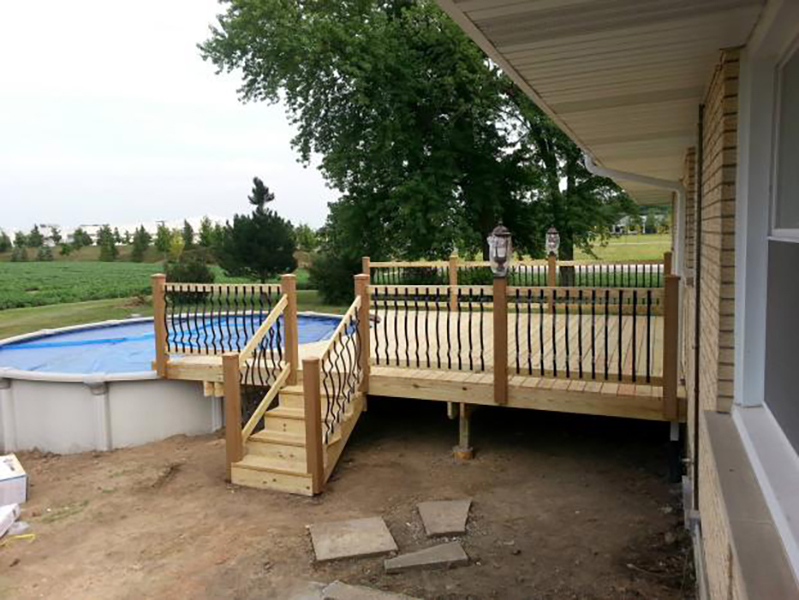 Our contractors pride themselves on outstanding customer service and getting the job done. 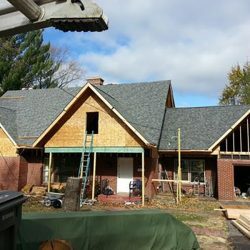 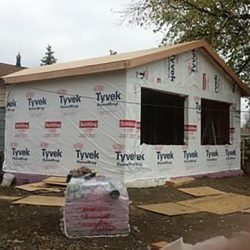 Whether you’re breaking ground on a completely new house or building, or renovating your existing space, Scott’s Construction can help make sure the project is completed precisely to your specifications. 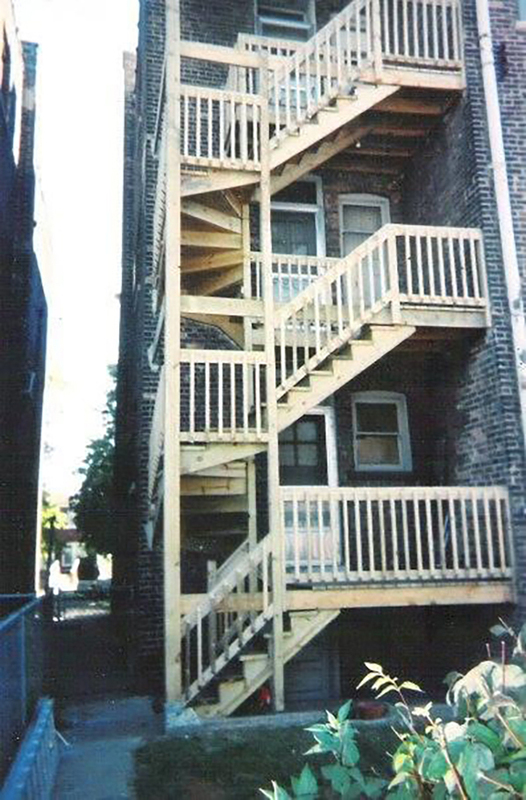 We work with you, the architects, the subcontractors, and anyone else involved to coordinate efforts efficiently. 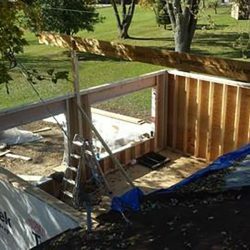 We’ll oversee the management of the construction site to ensure that everything adheres to your vision and is completed in a timely manner. 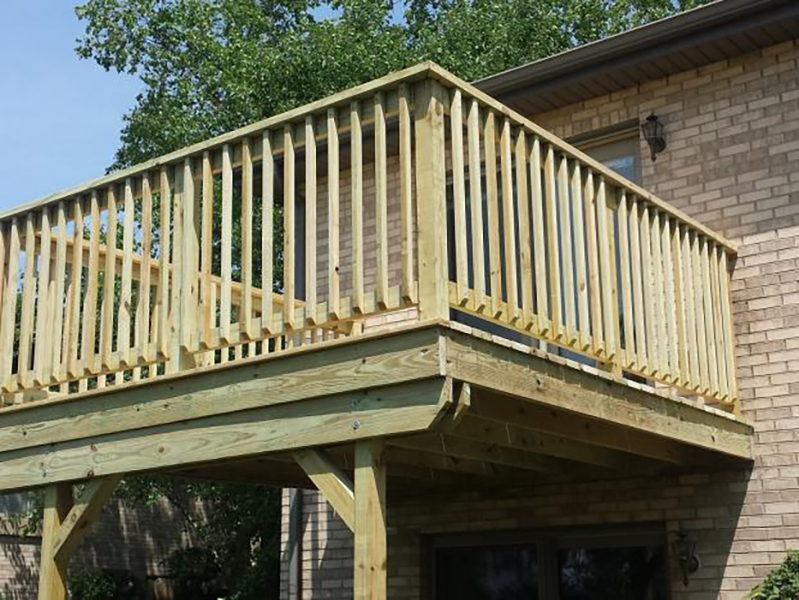 Call Scott’s Construction in Orland Park today to hear more about our services. 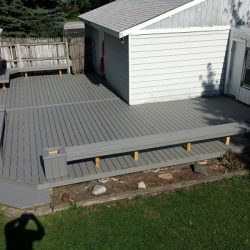 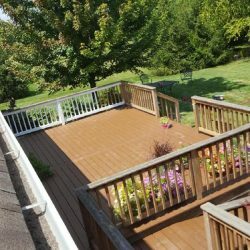 Frankfort Trex Deck: Removed the existing deck boards on the deck, ramp and stairs, and replaced them with Trex low maintenance decking in Saddle. 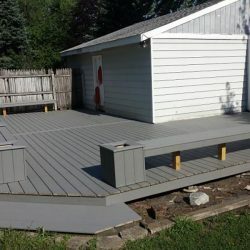 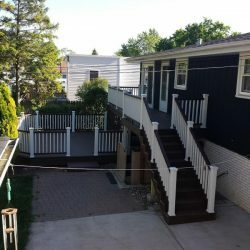 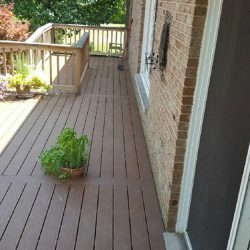 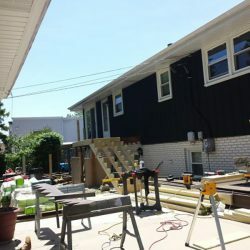 Orland Park Trex Deck: Removed the existing deck boards, benches, flower pots and two stairs and replaced them with Trex low maintenance decking. 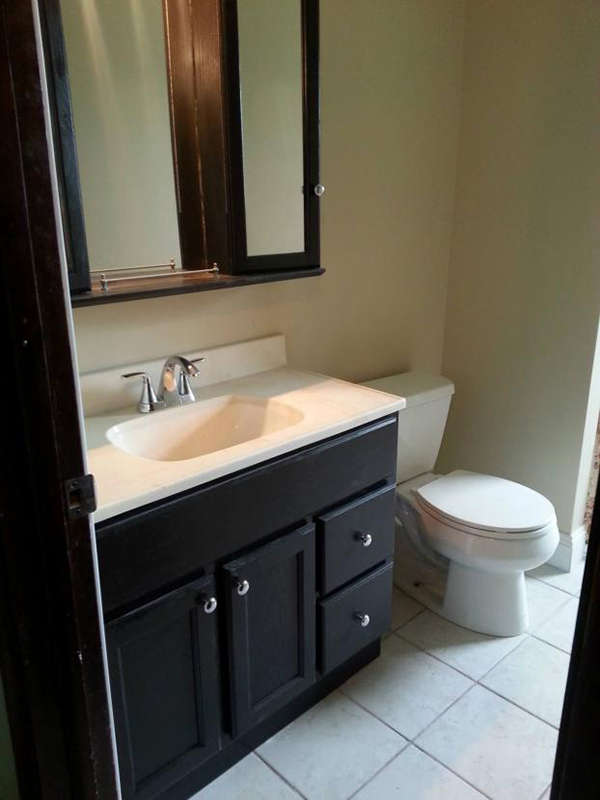 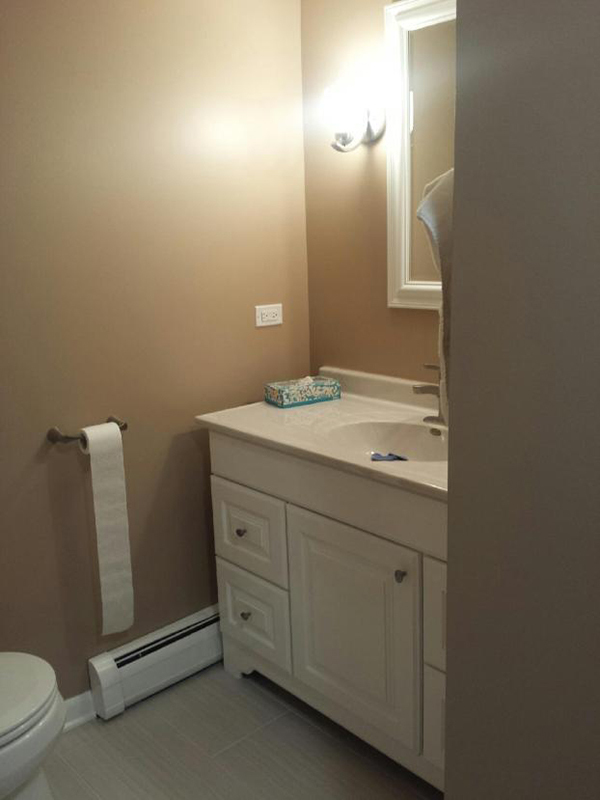 Frankfort Master Bathroom: Completely remodeled the master bathroom, just short of a full gut. 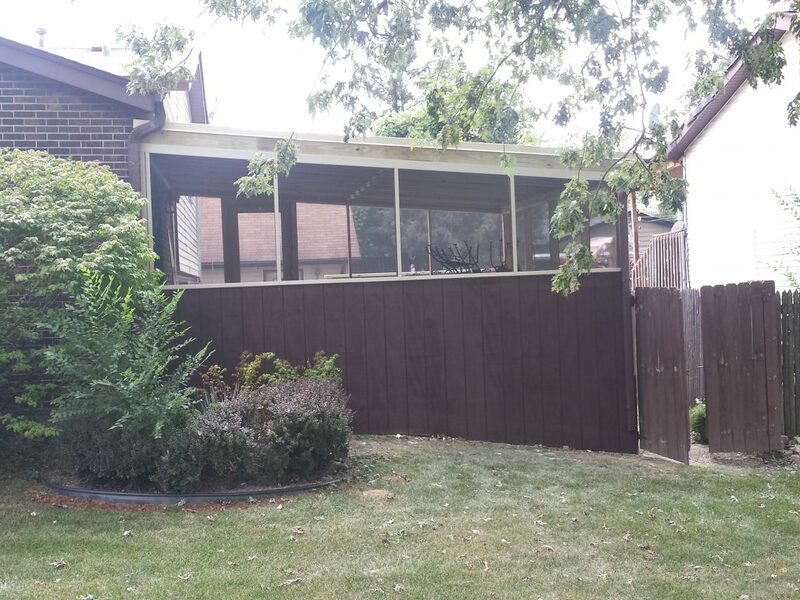 Tinley Park Three Season Room: Adjusted the screen door header, installed a new screen door and installed ship lap siding and sills on the lower portion of all the walls. 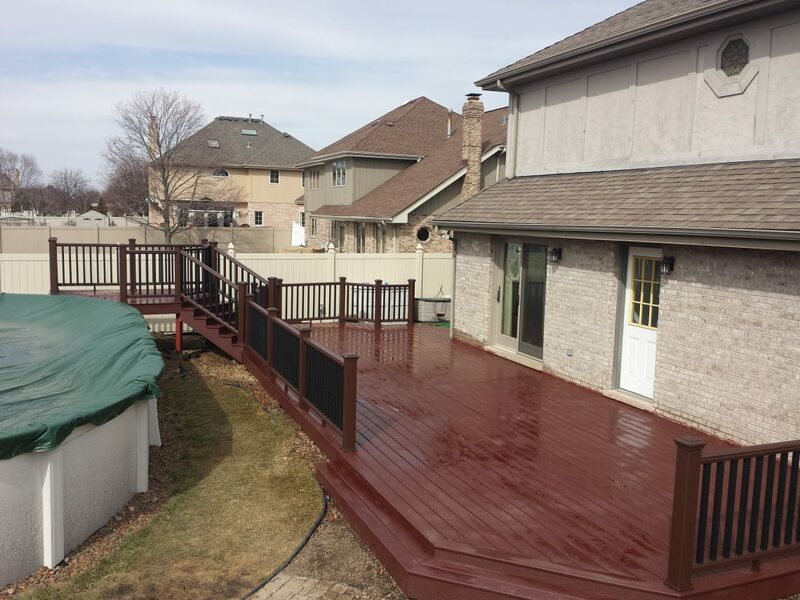 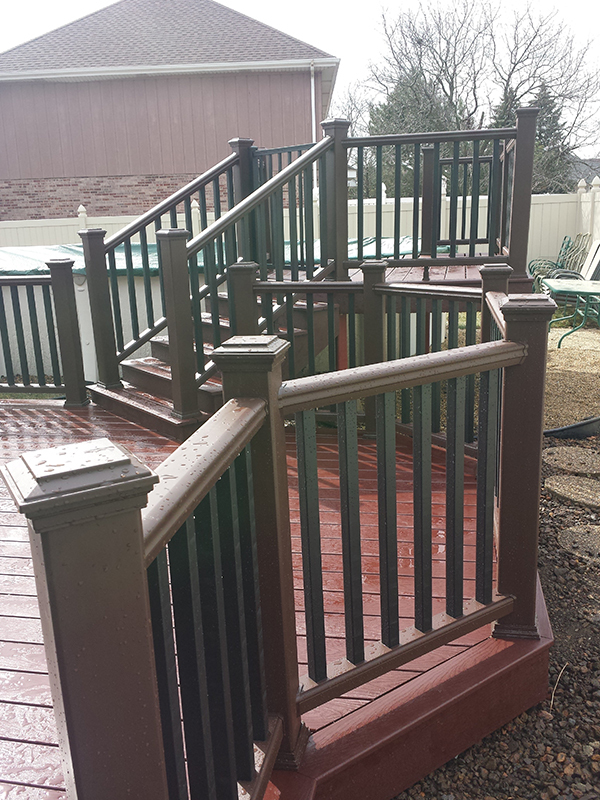 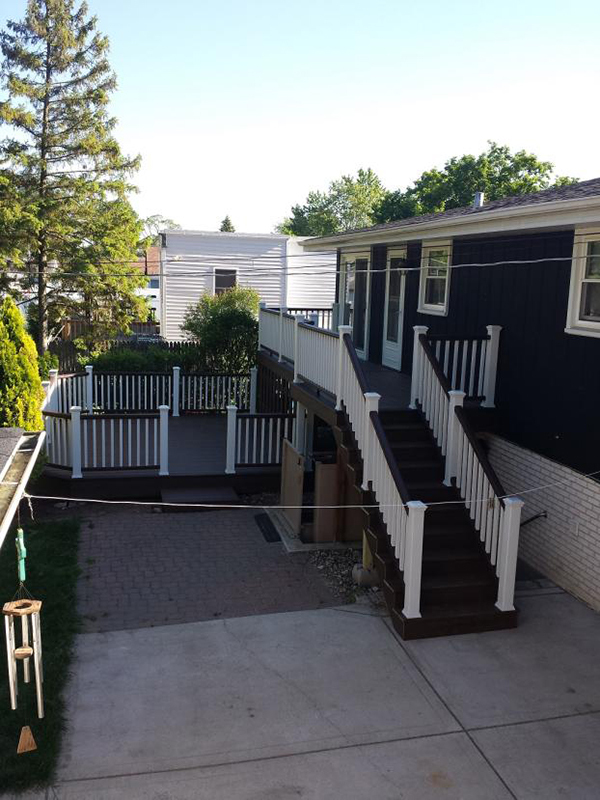 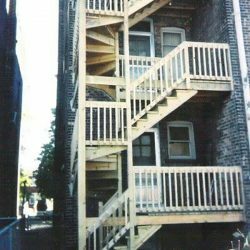 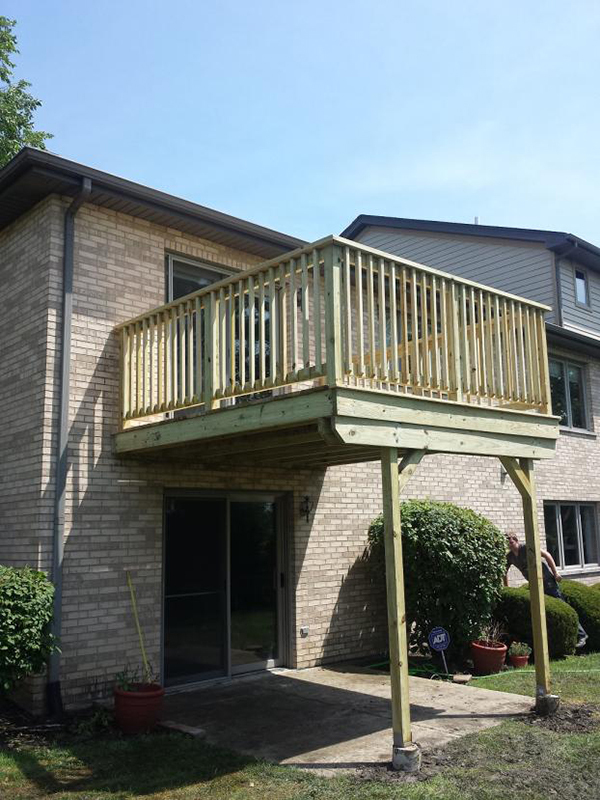 Orland Park Balcony: Removed the existing balcony and replaced it with pressure treated lumber. 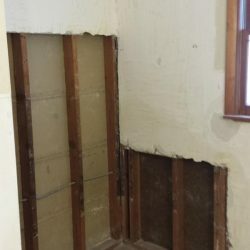 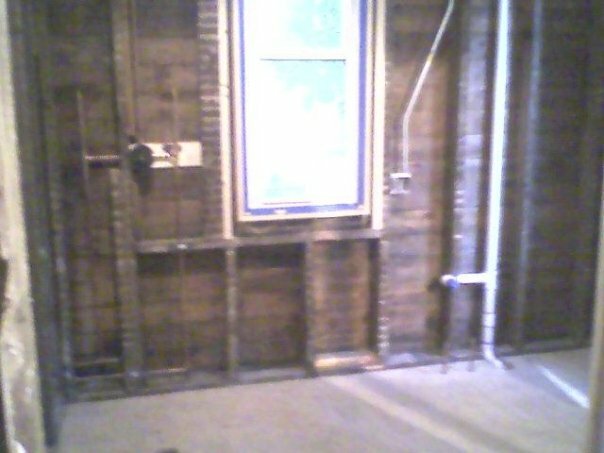 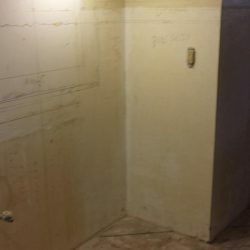 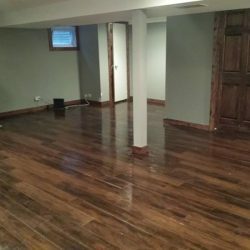 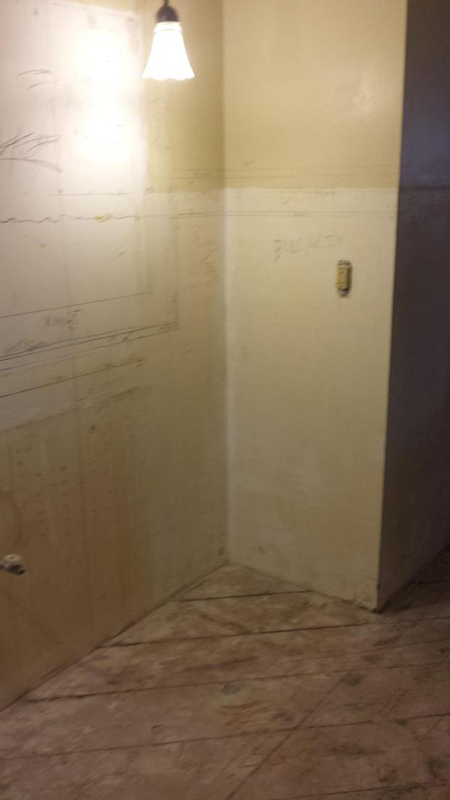 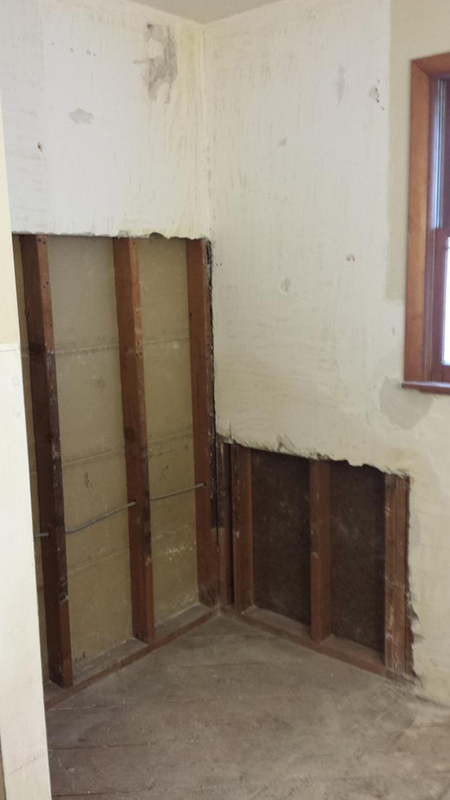 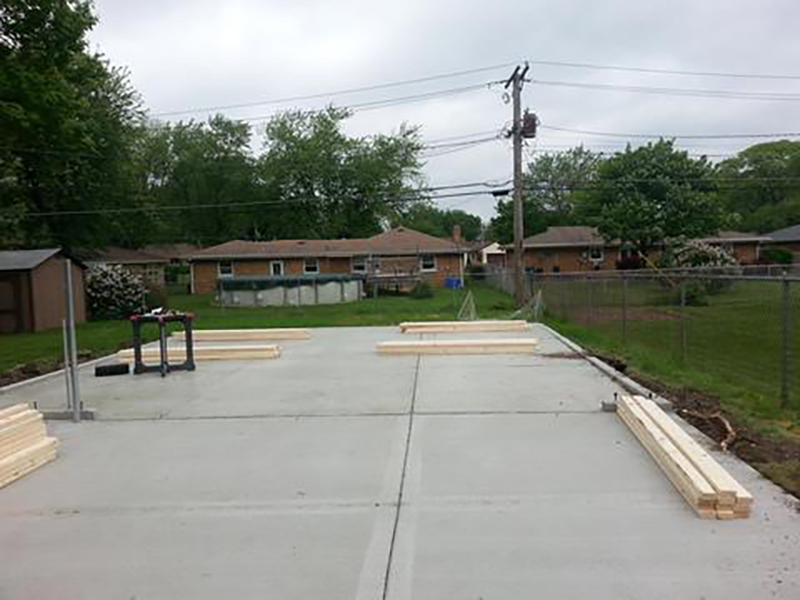 Orland Park Basement: Due to foundation issues, the laundry room and flooring needed to be gutted in the basement. 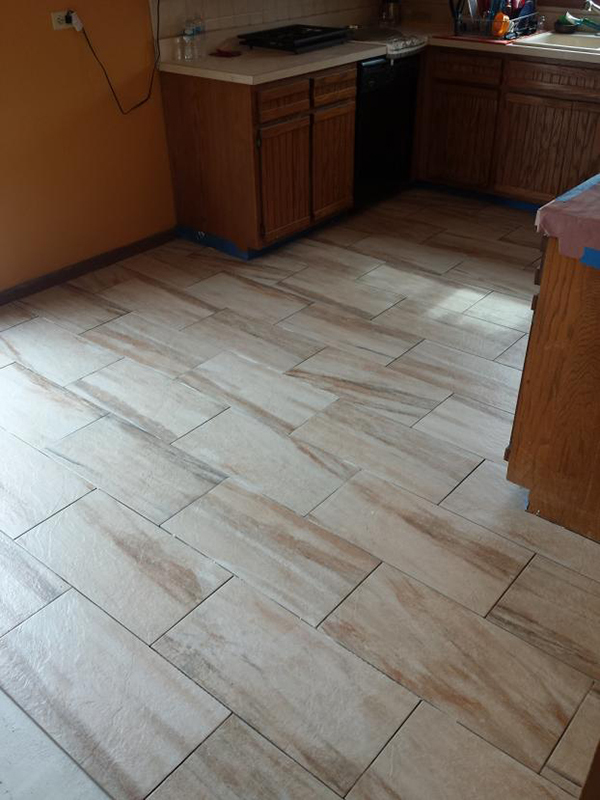 Homer Glen Kitchen Floor: The existing tile was removed and new tile was put down (the grout was not applied yet in this photo). 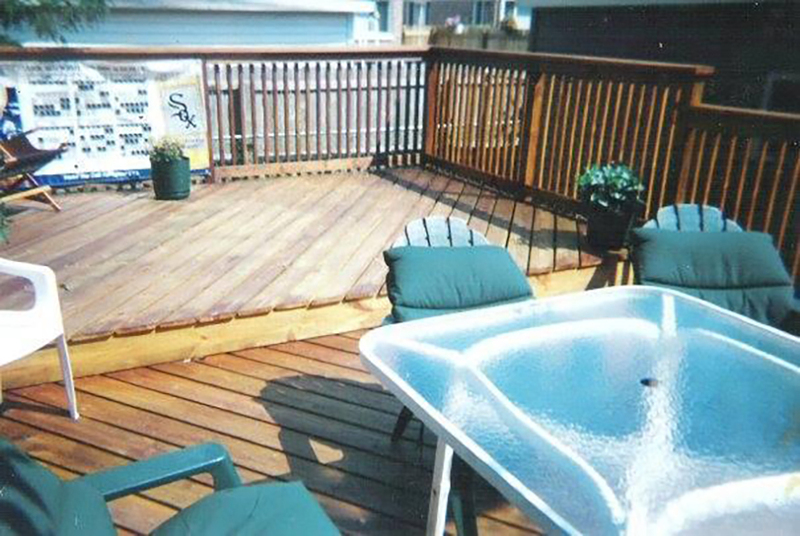 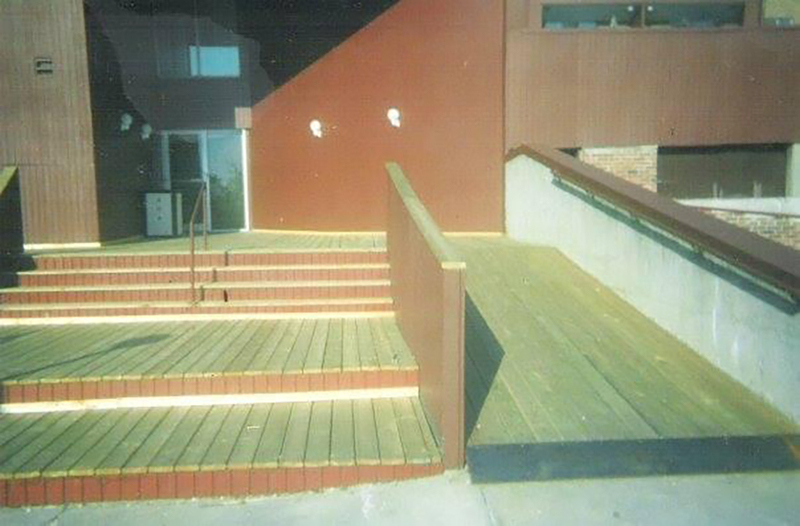 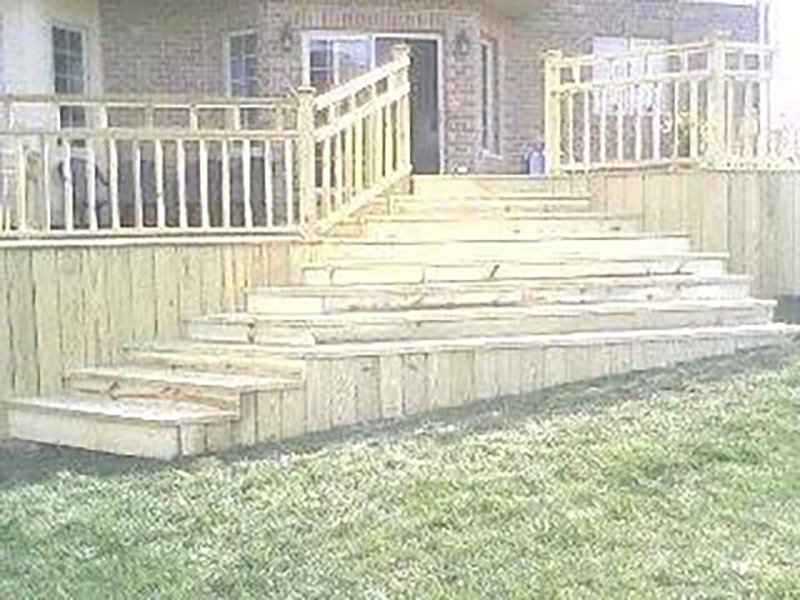 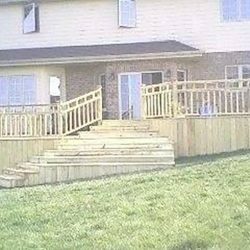 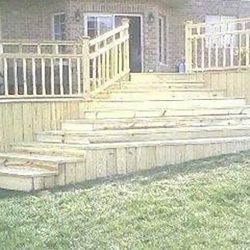 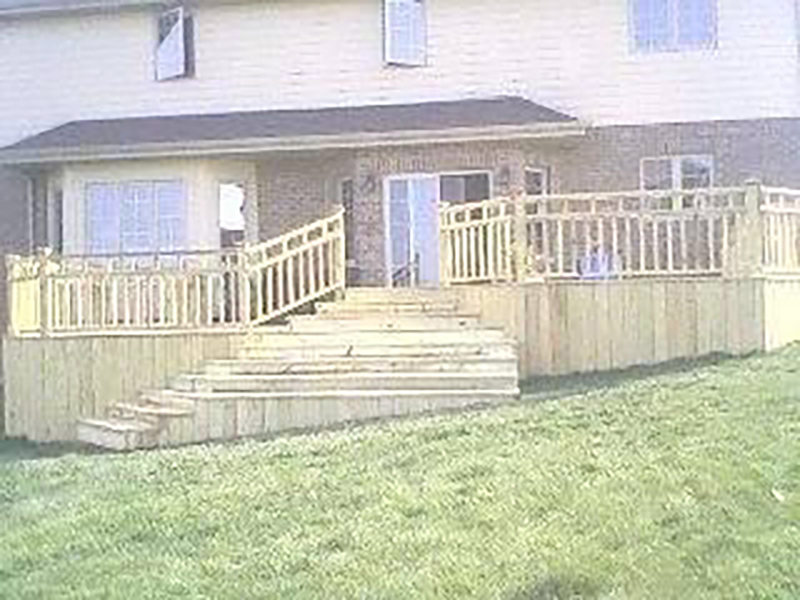 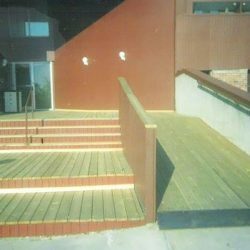 Lemont Deck: Removed the existing deck, seating and stairs and replaced with pressure treated lumber. 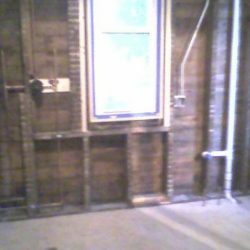 Tinley Park Water Damage: This customer had a line burst on her hot water tank which caused extensive water damage to the flooring above it. 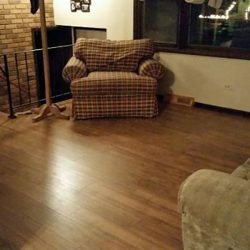 She decided to replace the tile and carpeting on this entire level with a beautiful laminate hardwood floor and is SO in love with it! 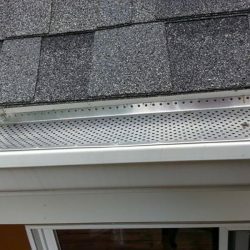 Gutter Guards: Never climb a ladder again to clean your gutters - these gutter guards keep out leaves, sticks, even pine needles! 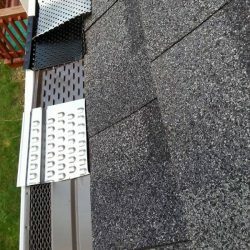 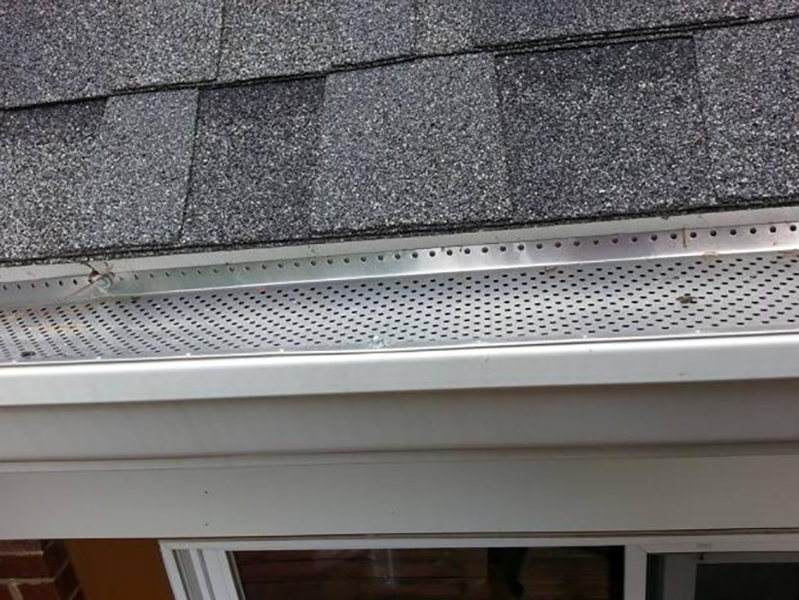 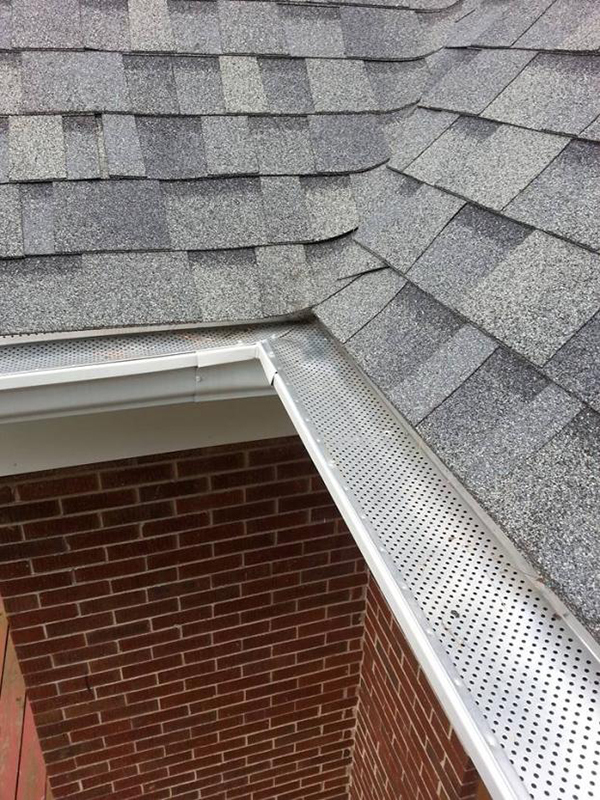 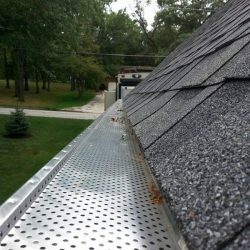 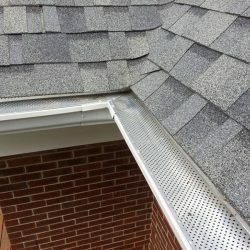 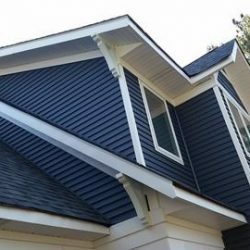 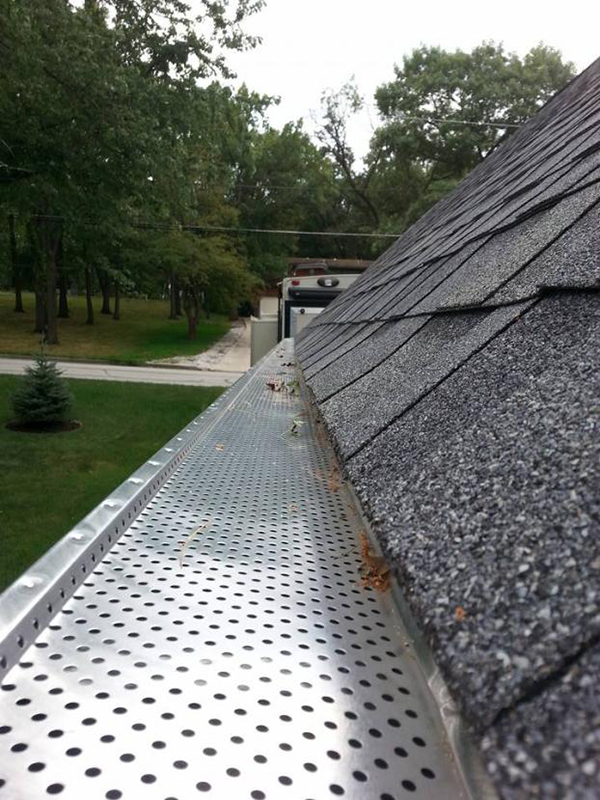 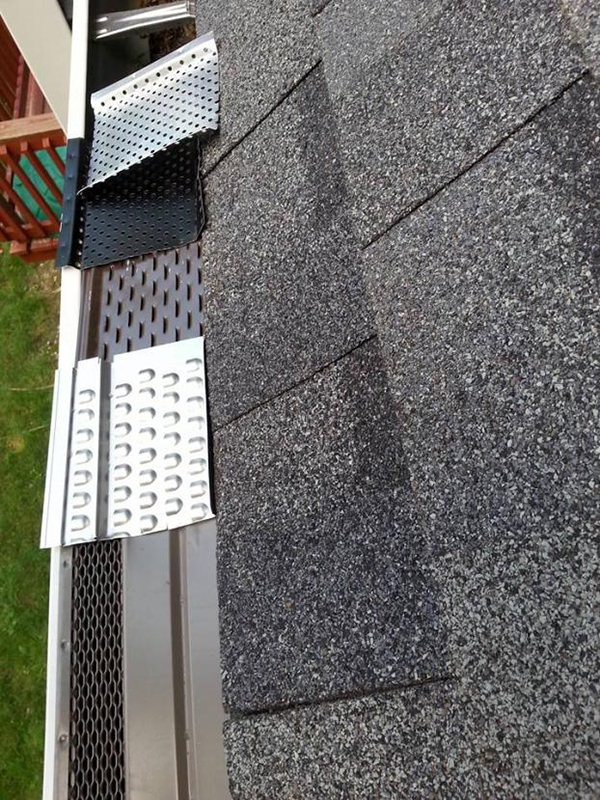 Gutter Guards: Several options available at different price points. 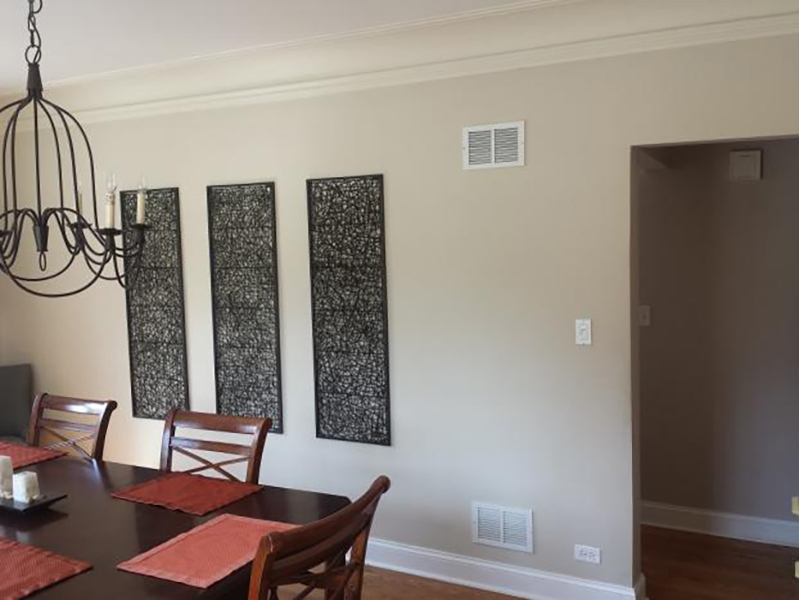 Orland Park Open Floor Plan: Ripped out the load bearing wall separating the living room from the kitchen and dining room and found this gigantic fireplace (only the face was showing before). 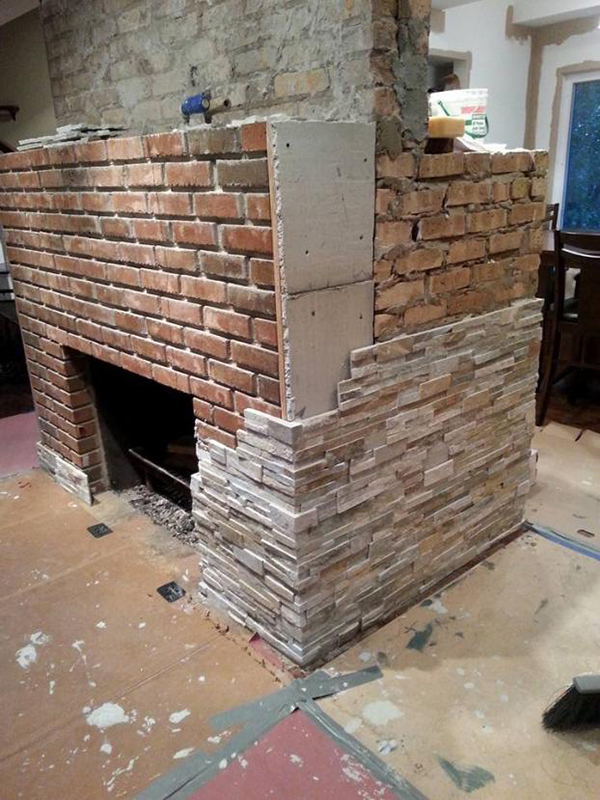 Instead of ripping out the fireplace, the customer came to us to figure out a work around that would fit their tastes. 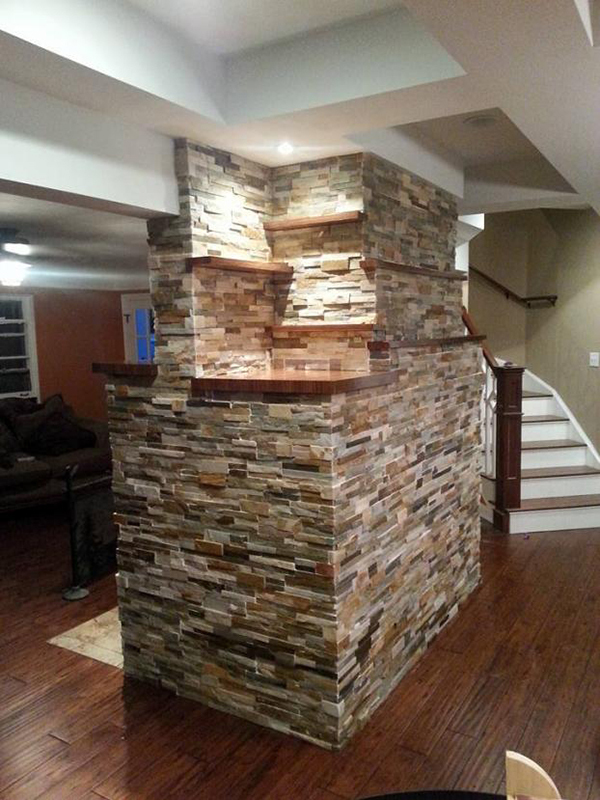 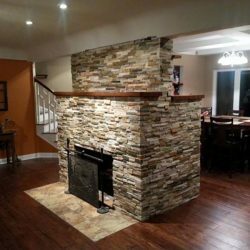 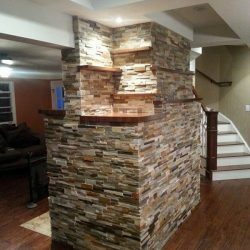 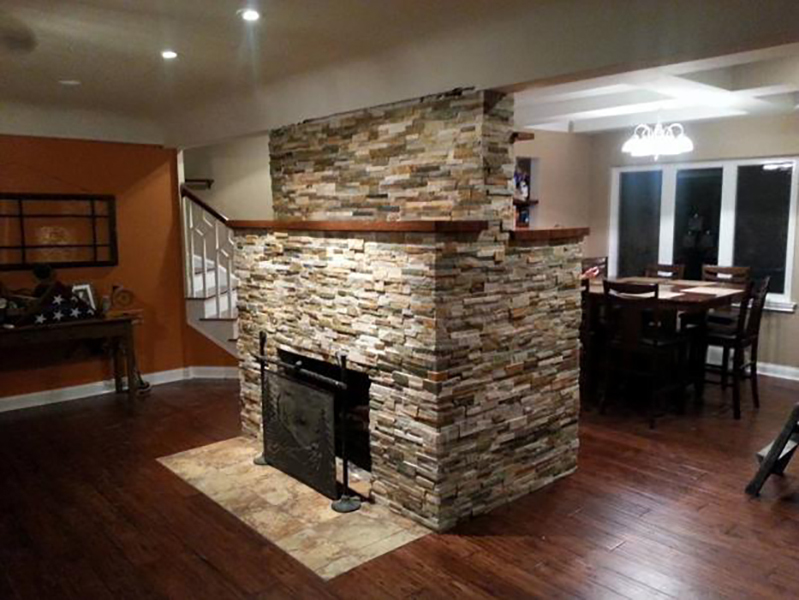 Orland Park Open Floor Plan: This was the end result - stone overlay with zebra wood mantle and shelves on the rear of the fireplace. 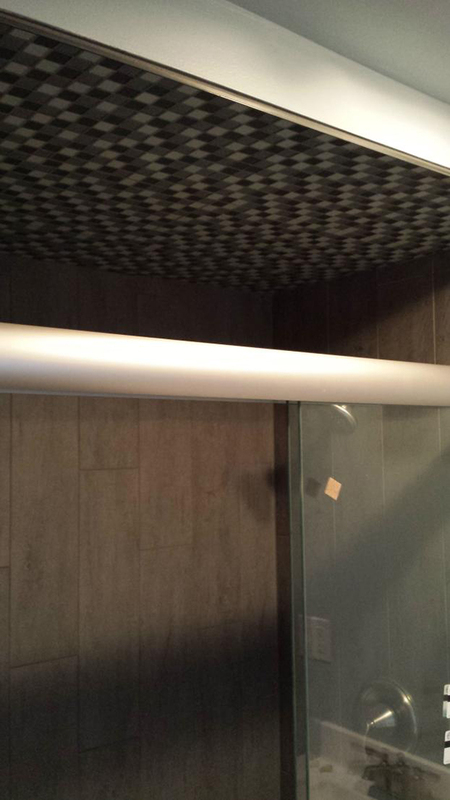 Also installed the ceramic and wood flooring for the customer as well as the new eyeball accent lights in the ceiling. 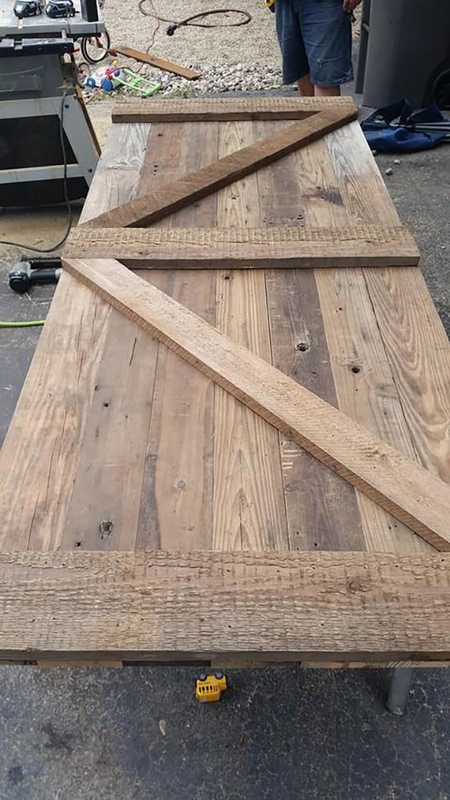 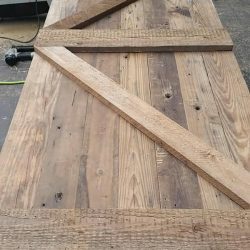 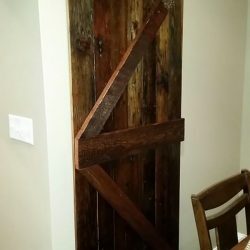 Pantry Barn Door: We created a barn door out of wood from before the 1950's that the customer had, which was original to their house, for their kitchen pantry. 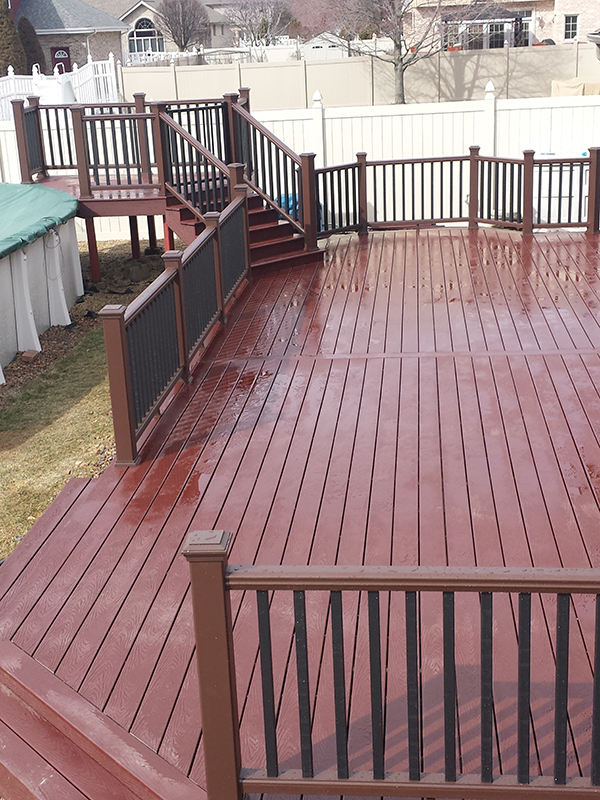 The finished product was polyurethaned to protect the wood. 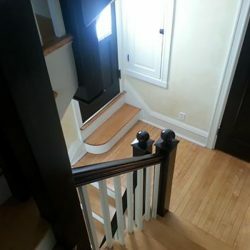 LaGrange Stairwell: Service stairs and doors leading to the 2nd and 3rd floors. 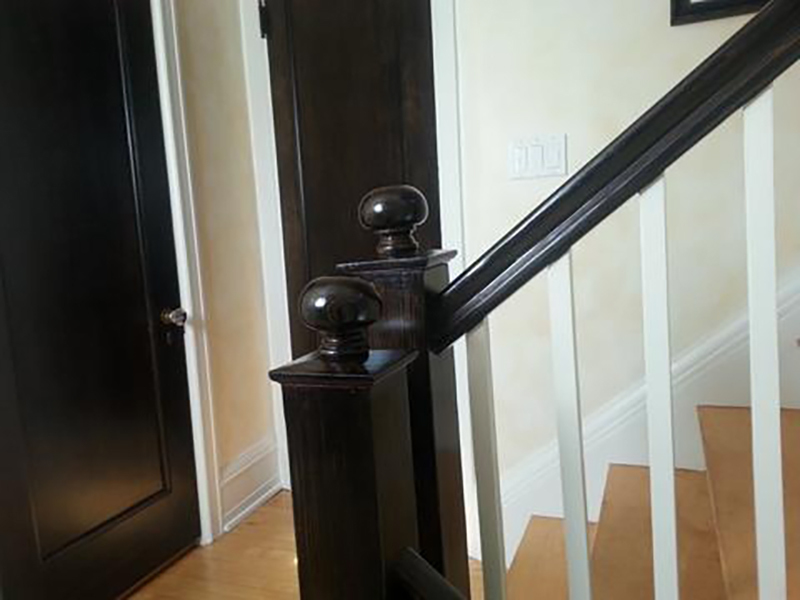 Fully stripped 100+ year old fir and restained in ebony. 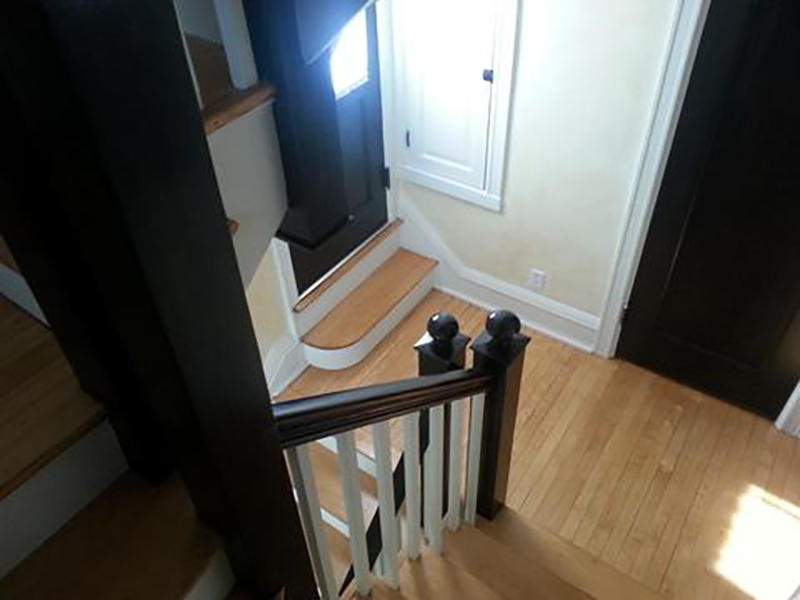 Repainted all balusters in white. 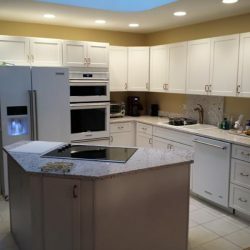 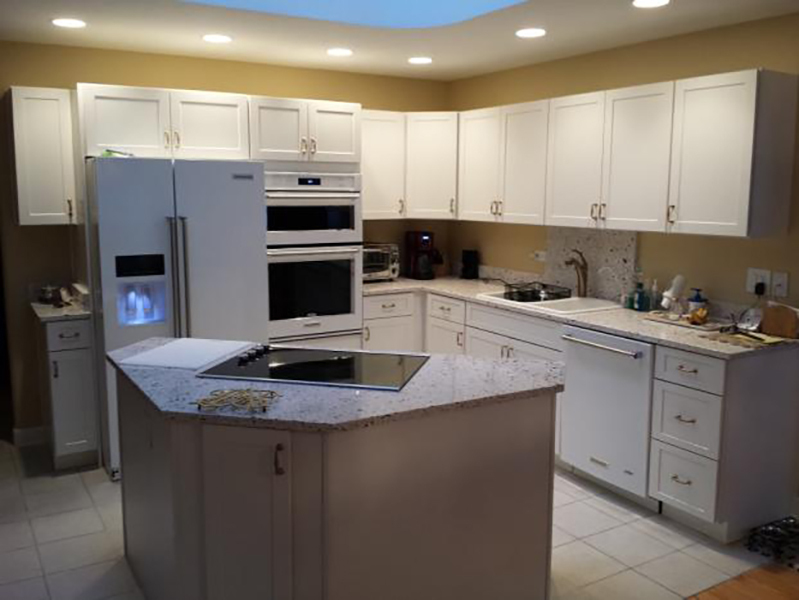 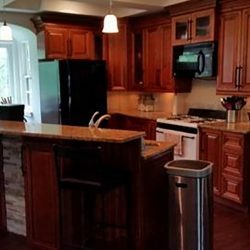 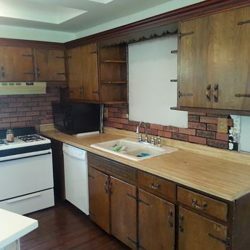 Orland Park Kitchen: This kitchen was extremely outdated and needed new everything! 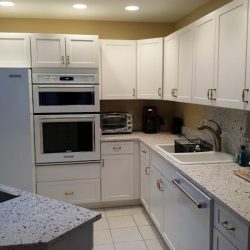 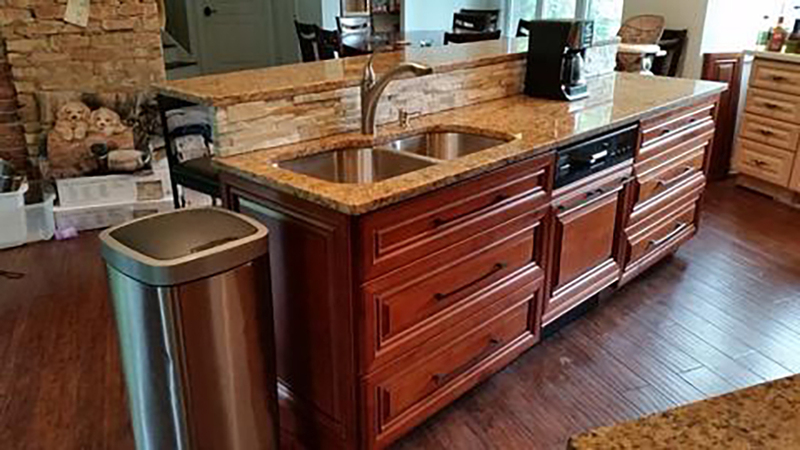 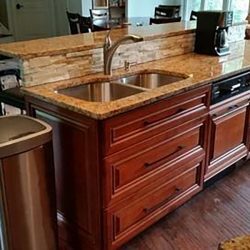 Orland Park Kitchen: All new cabinets, appliances and fixtures were replaced. 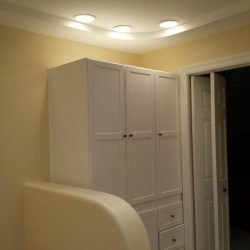 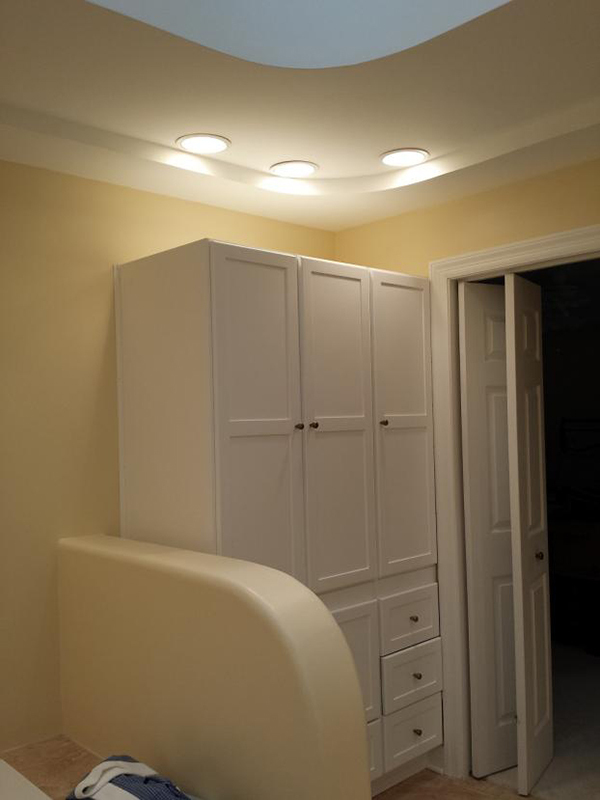 New above and under cabinet lighting was installed. 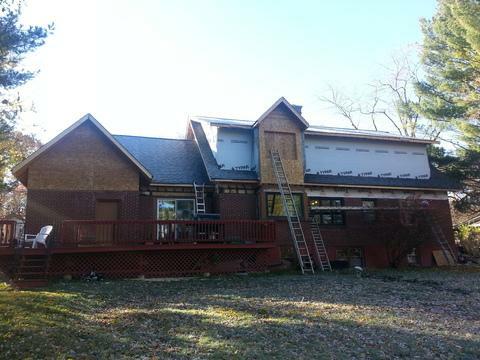 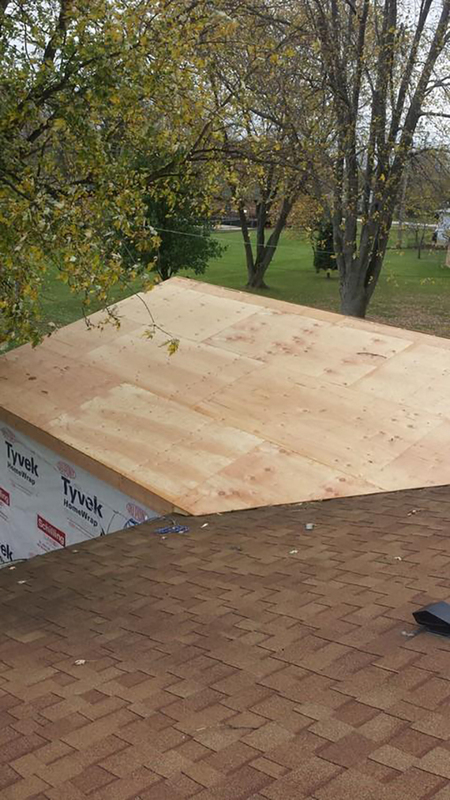 Kankakee River Rehab: Roof tear-off and re-shingle, new copper, new second floor windows, new paint, and a new deck. 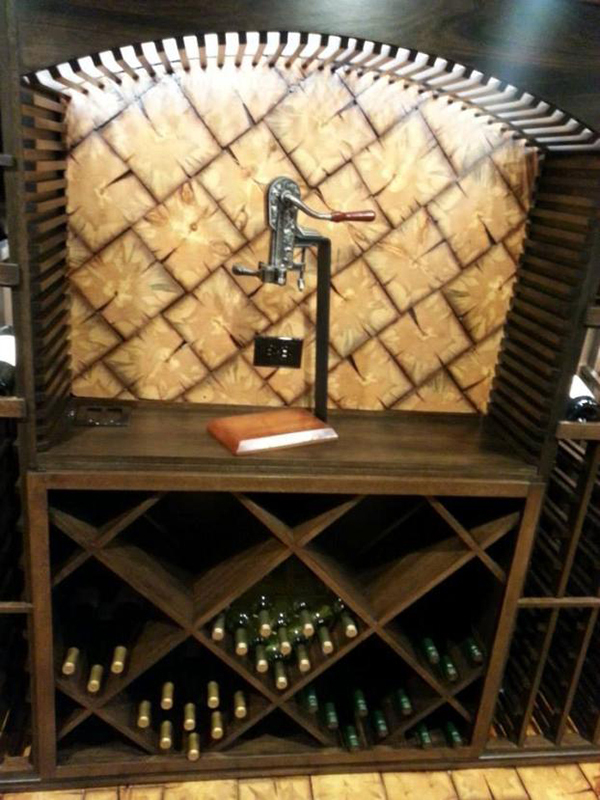 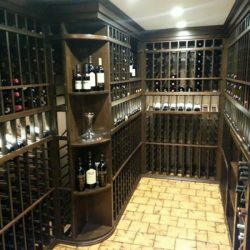 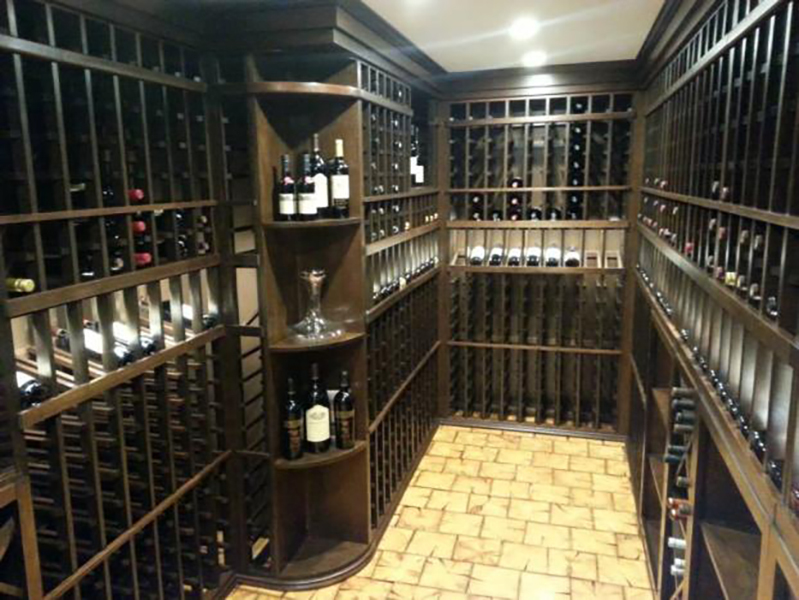 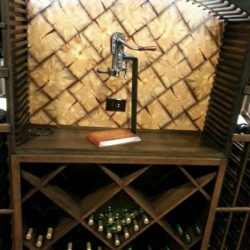 LaGrange Wine Cellar: Completed climate-controlled wine cellar. 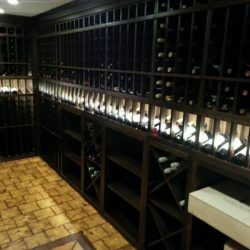 1,400 bottle capacity. 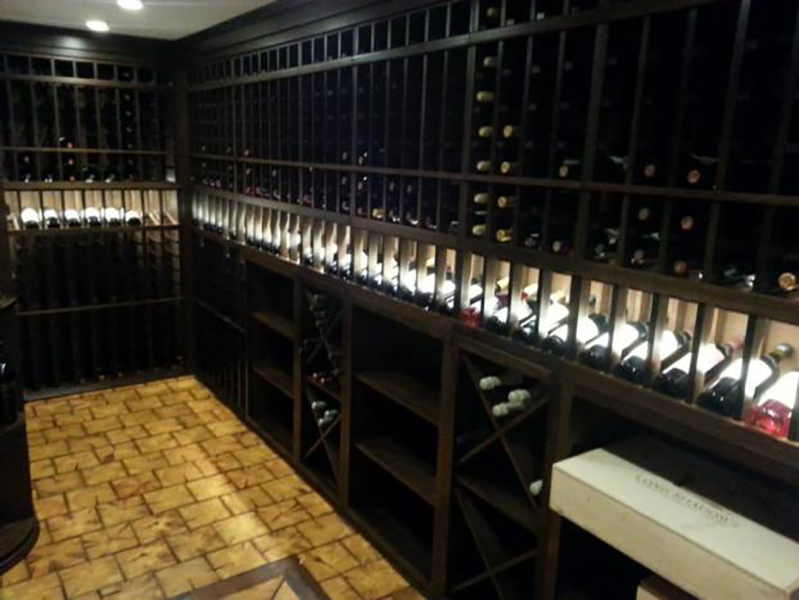 LaGrange Wine Cellar: This room was insulated with closed cell insulation and then encapsulated with an aluminum shield. 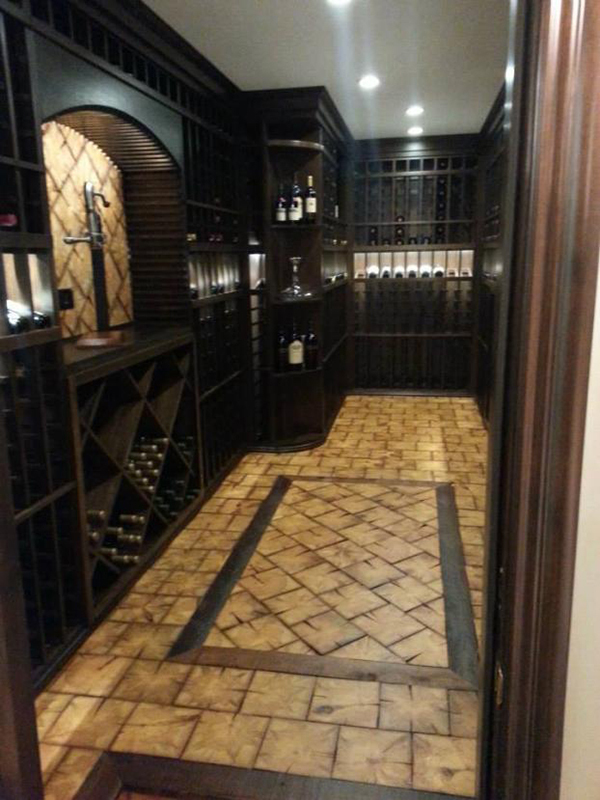 LaGrange Wine Cellar: Floating custom rough cut floor. 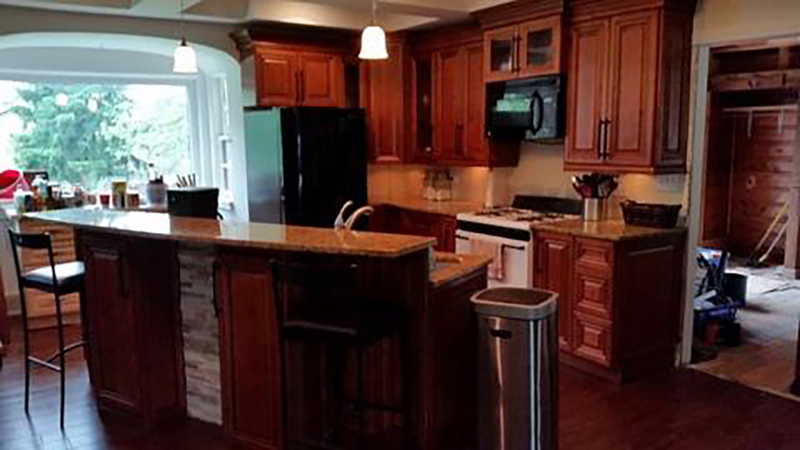 Solid mahogany cabinets. 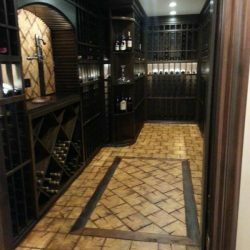 LaGrange Wine Cellar: The floor is comprised of 1" thick 6x6 posts that at one time were used to support the customers home. 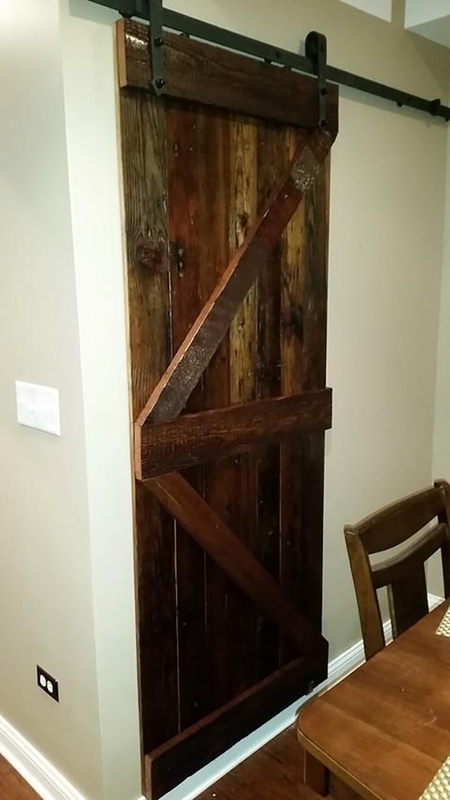 The posts are 100+ years old. 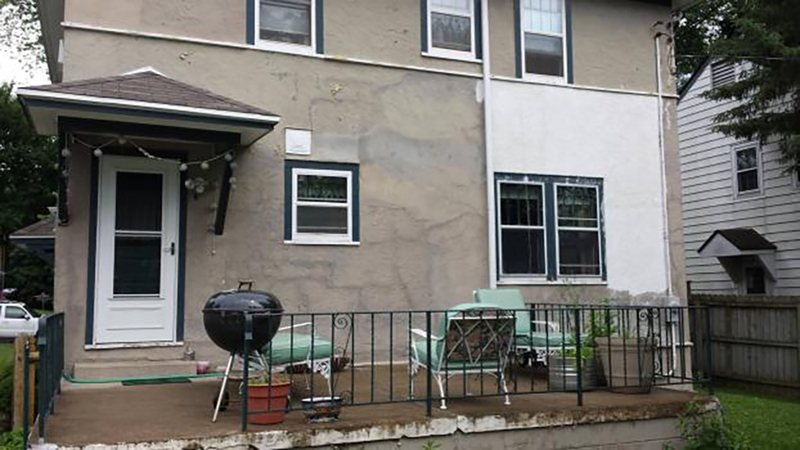 Kankakee Exterior Paint: Before - The entire exterior of the home is stucco, some of which was repaired before the paint was applied. 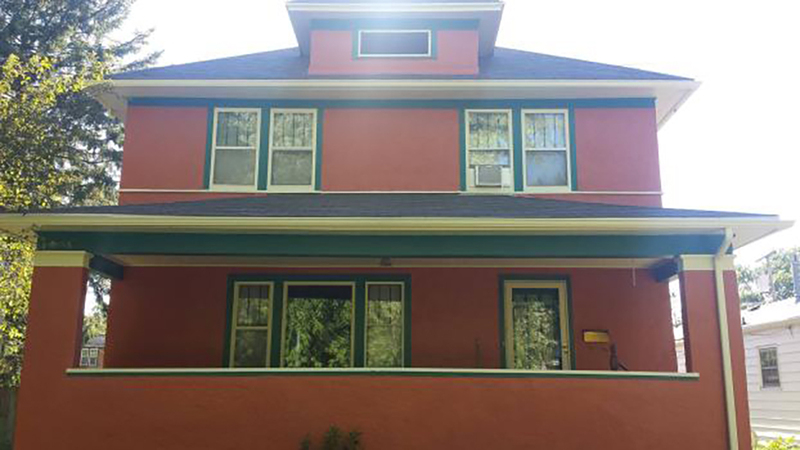 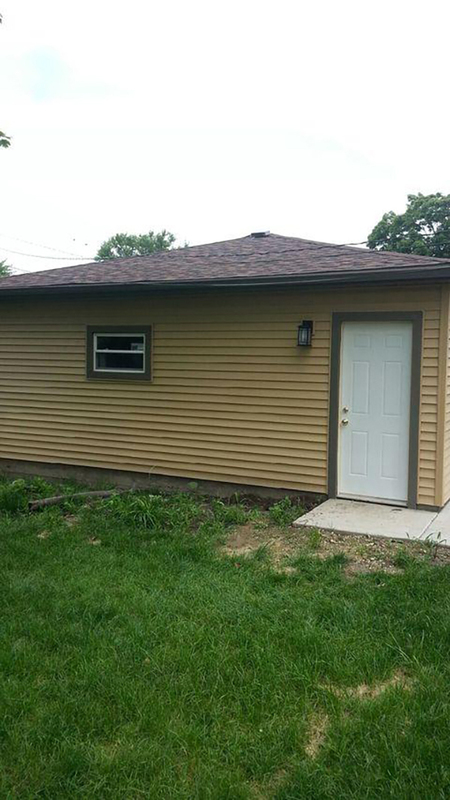 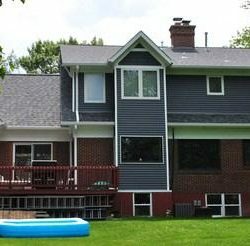 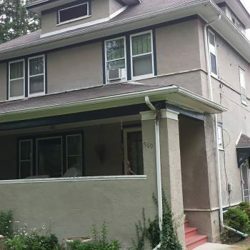 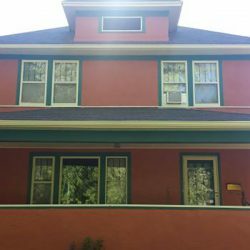 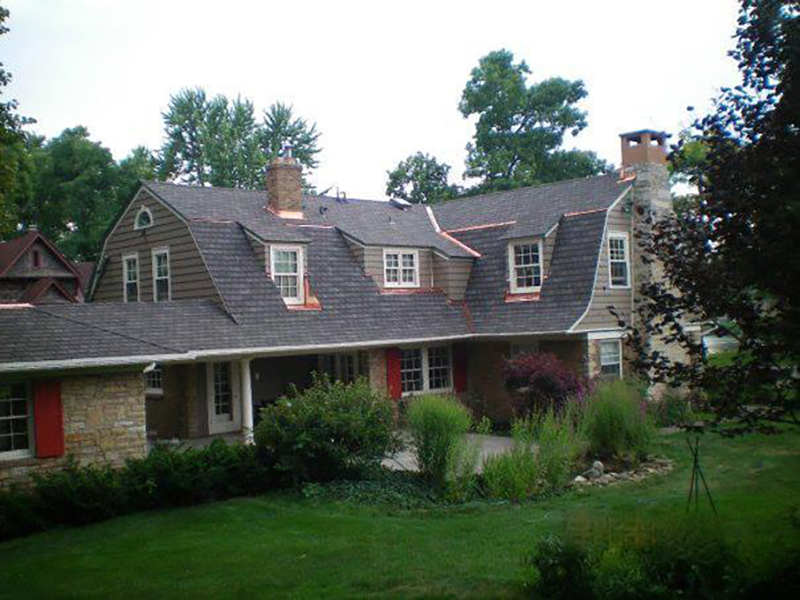 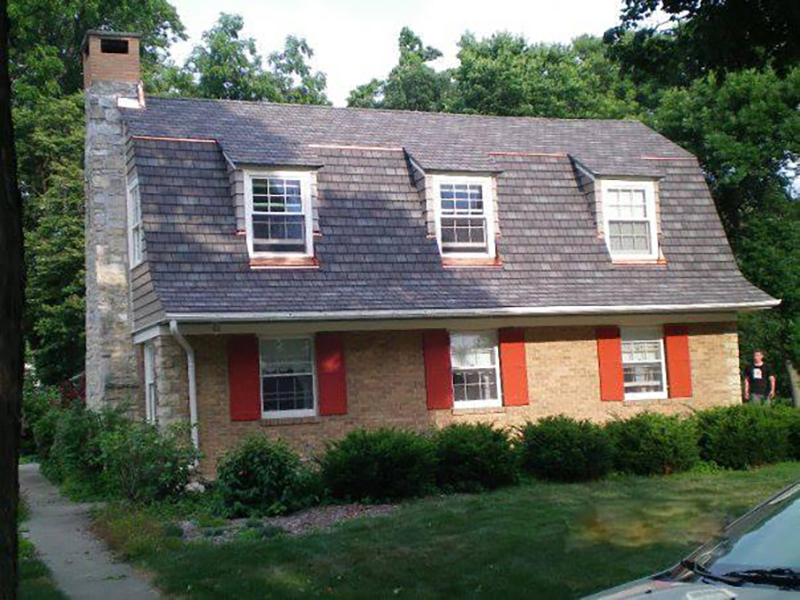 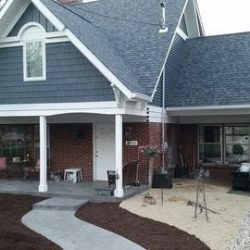 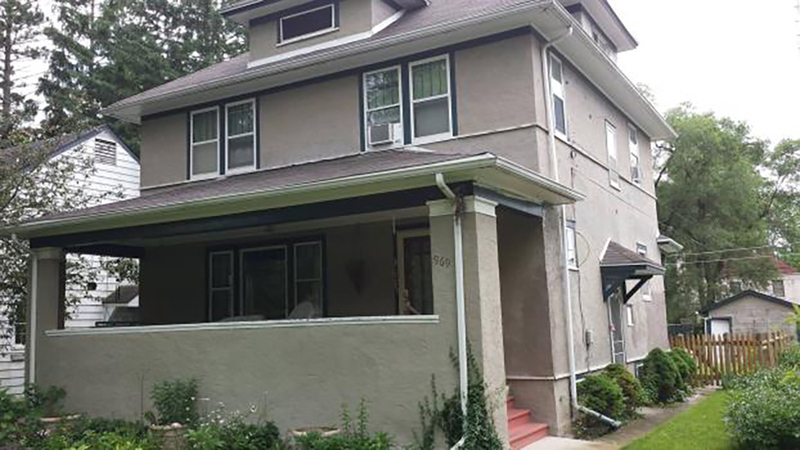 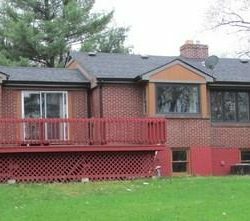 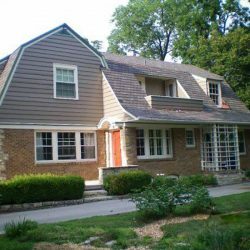 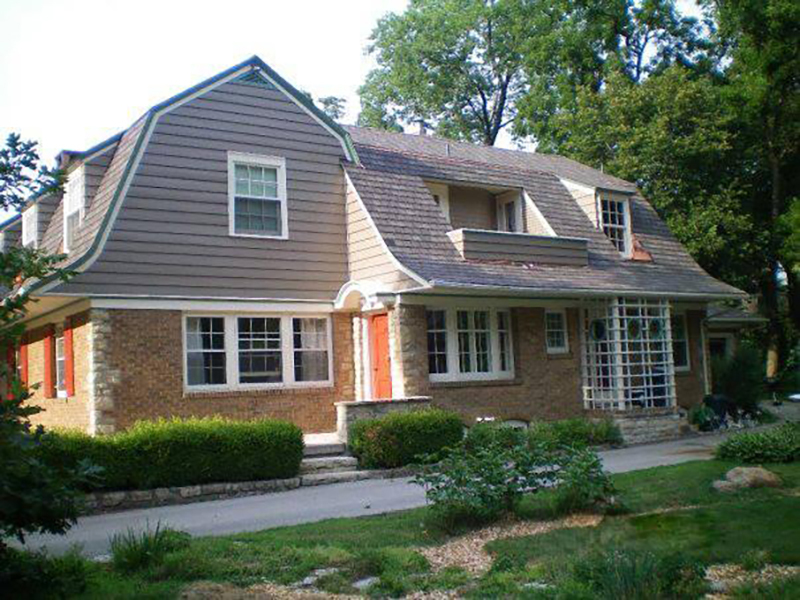 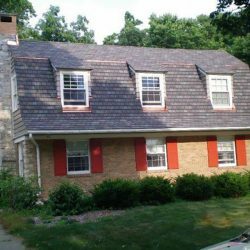 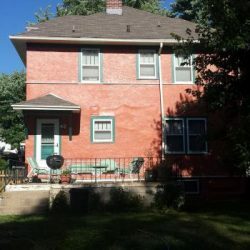 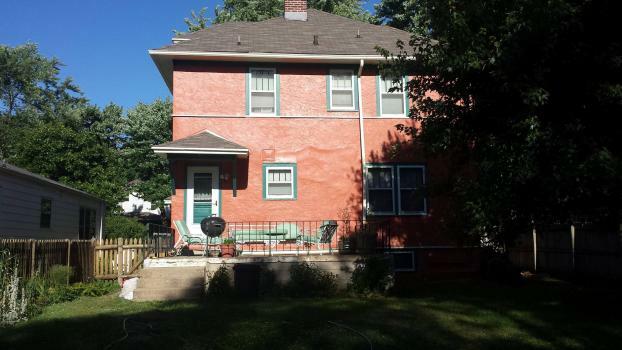 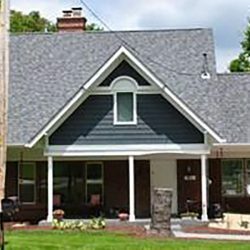 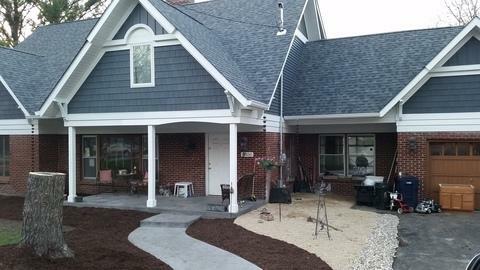 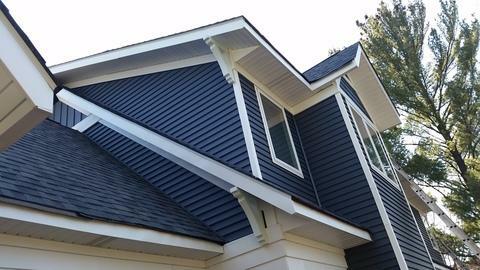 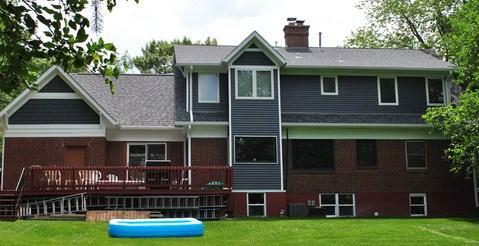 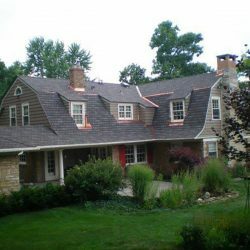 Kankakee Exterior Paint: After - A total of four paints were used on the home. 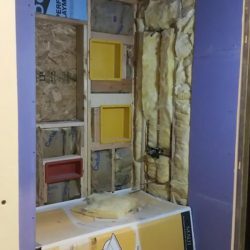 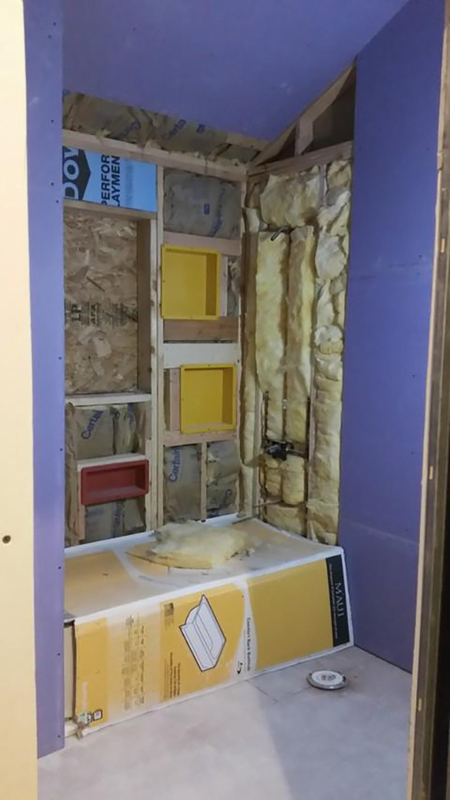 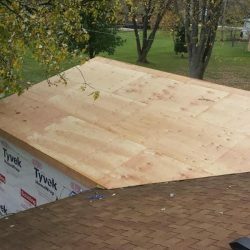 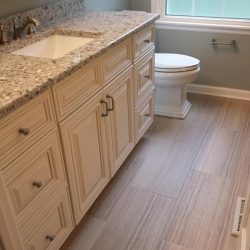 Lemont Master Suite: Repaired the subfloor, added new framing and insulation, a new walk-in closet, and water closet in the master bathroom. 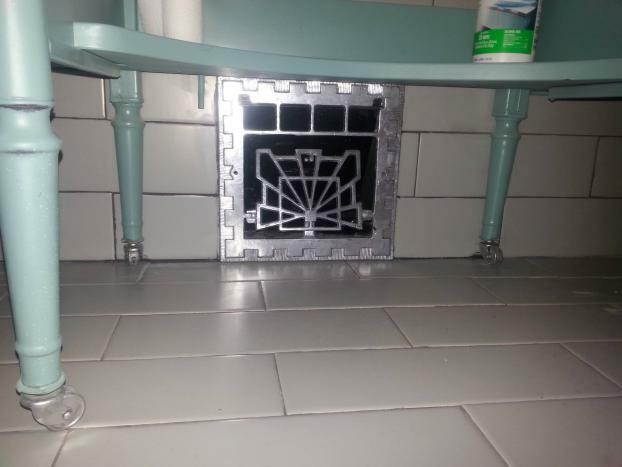 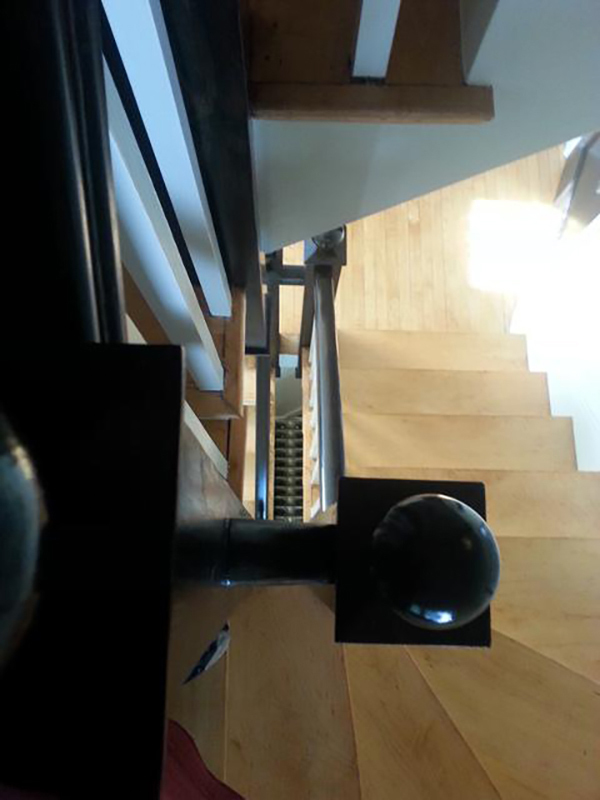 Ran the plumbing, electrical and HVAC vents to the correct new locations. 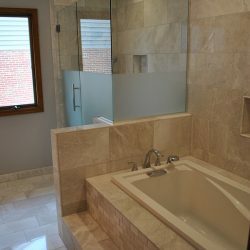 Lemont Master Suite: Turned two bedrooms, two bathrooms and a laundry room into a large master suite with a minibar, fireplace, walk-in closet, and large master bathroom. 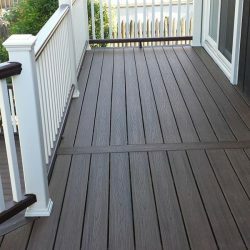 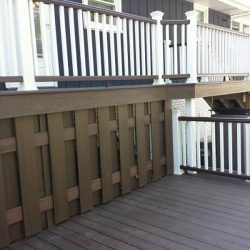 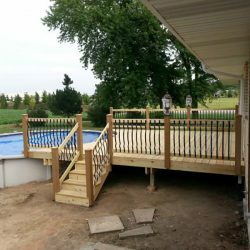 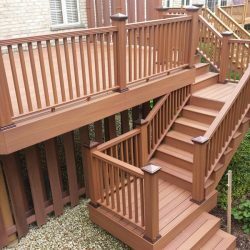 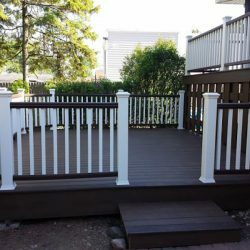 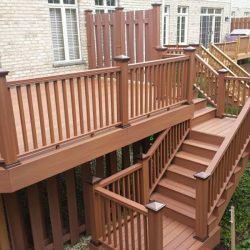 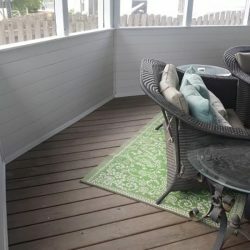 Lemont Trex Deck: Trex Transcend decking, privacy wall and stairs in Tiki Torch and Trex Transcend top rails in Tiki Torch. 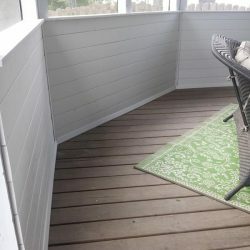 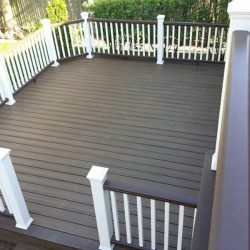 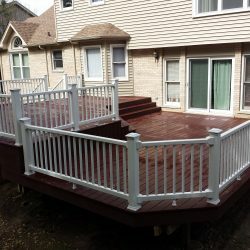 Palos Hills Trex Deck: Trex Transcend decking in Spiced Rum with a Trex Transcend Vintage Lantern border, Trex Transcend top and bottom rails in Vintage Lantern, and posts, caps and ballusters in Classic White. 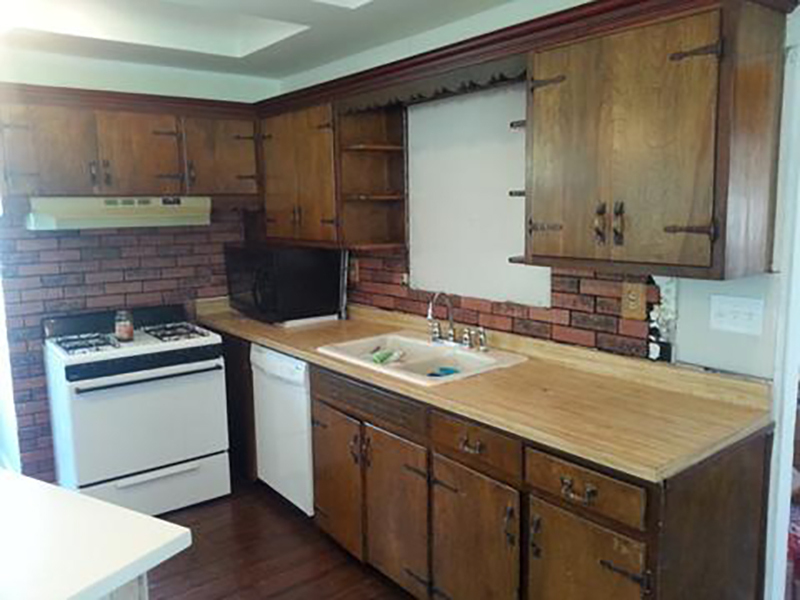 Before: The customer wanted to have a more open floor plan as well as additional space to put an island in. 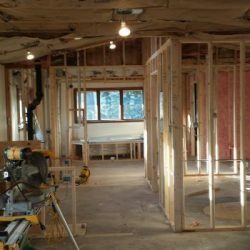 This was a load bearing wall and needed LVL beams installed in order to open up the wall. 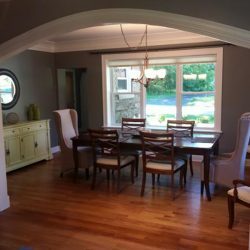 After – View from Dining Room: So much more space and natural light! 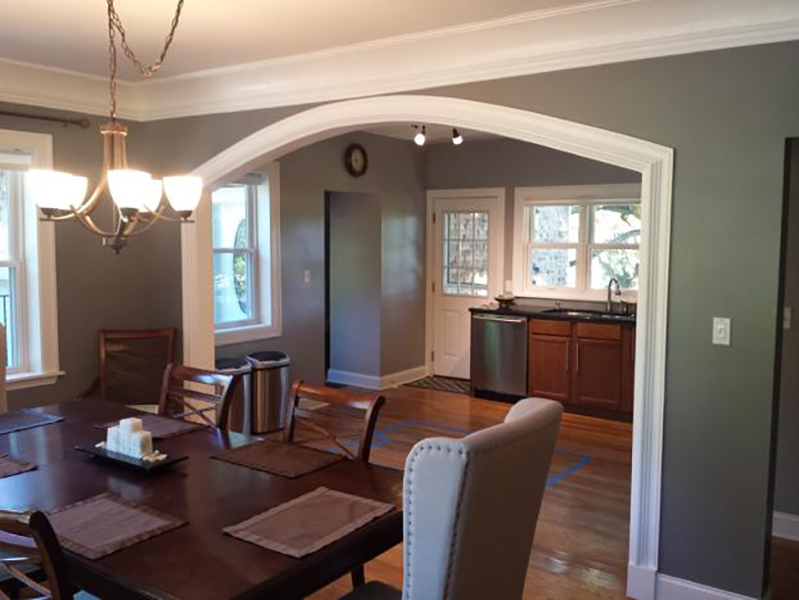 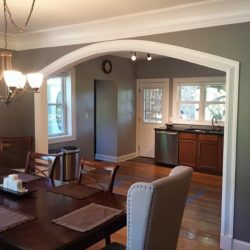 This beautiful home has so much character already and an arched opening just keeps adding to it! 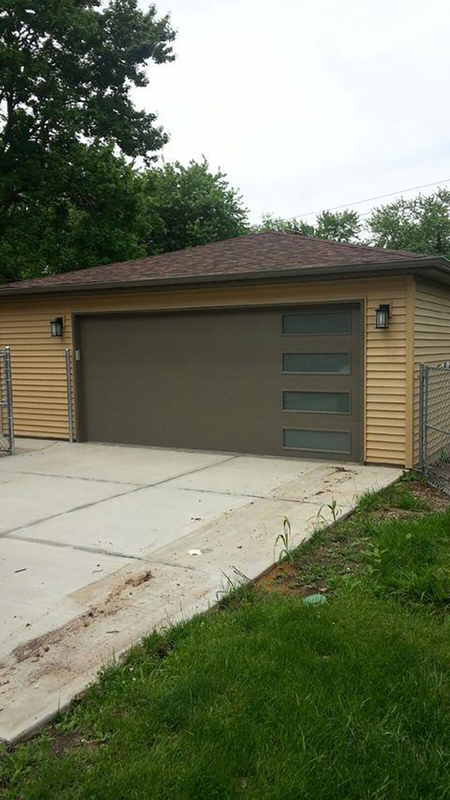 New 2 Car Garage: Brand new 2.5 car detached garage and new concrete driveway. 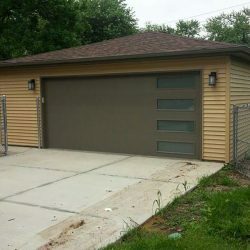 New 2 Car Garage – After: The windows were designed to match the front door and the aluminum window and door trim match the home. 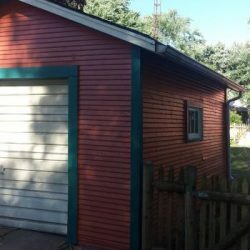 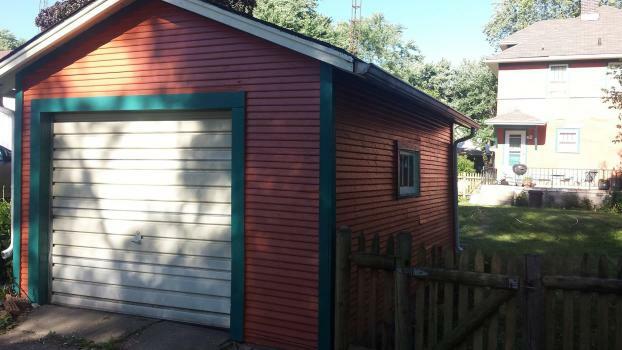 New 2 Car Garage – After: The siding color compliments the brick on the home. 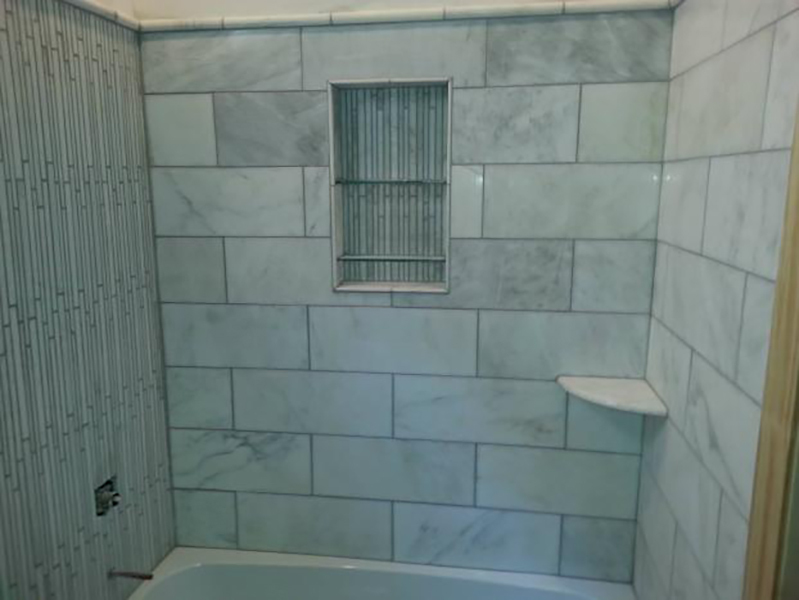 Condo Bathroom: Marble tile with niche and marble shelf. 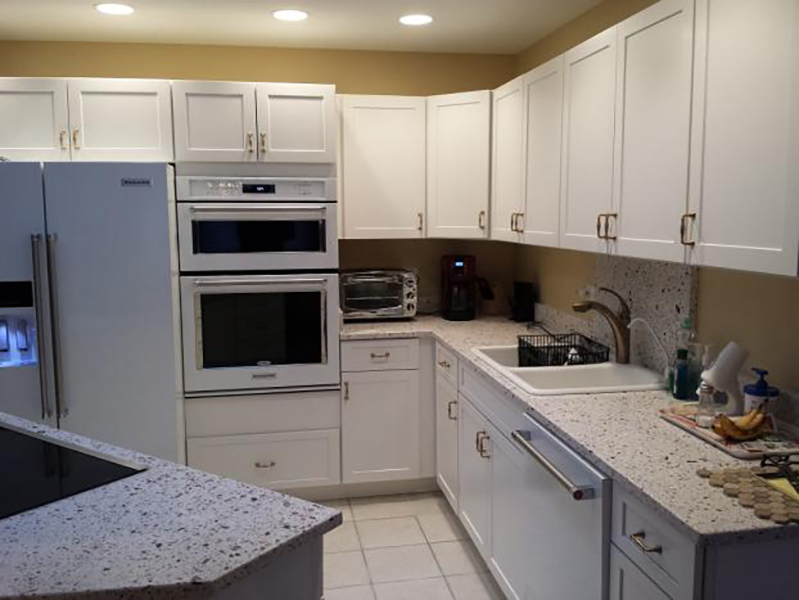 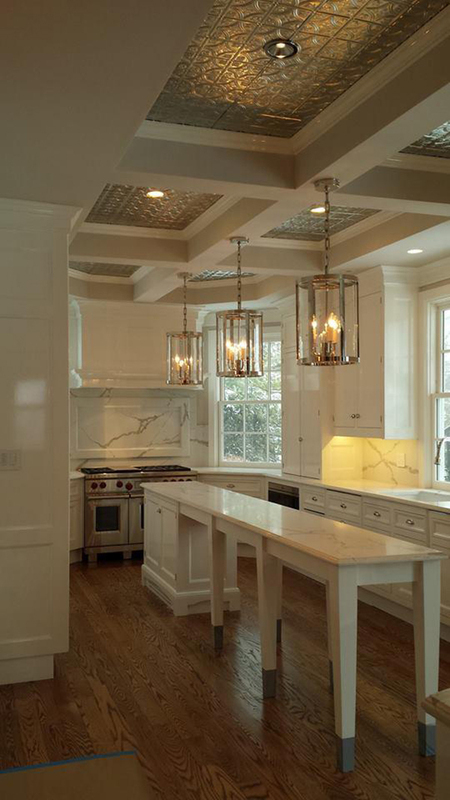 LaGrange Kitchen 1: This kitchen was gutted due to a fire, redesigned and completely rebuilt. 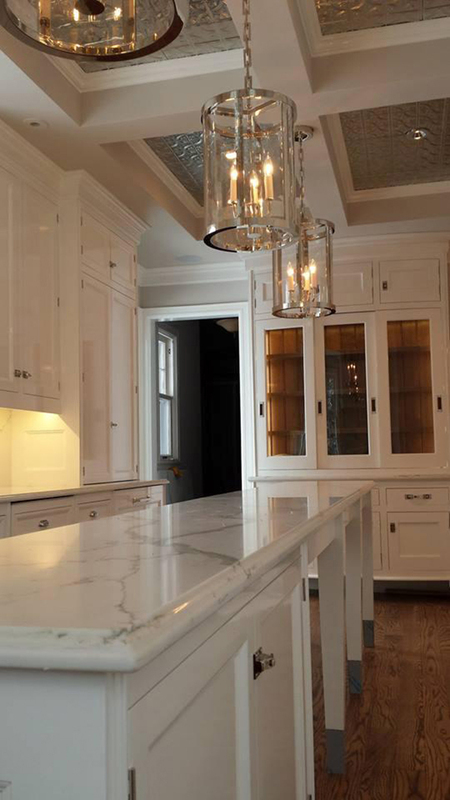 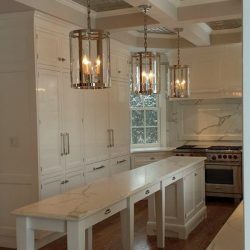 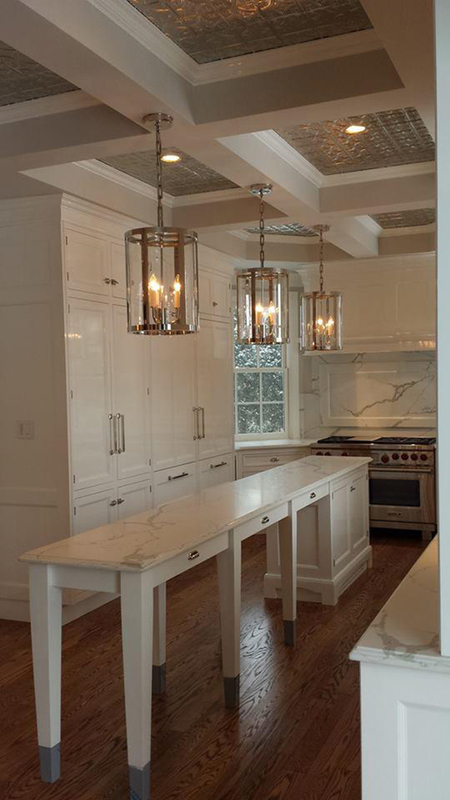 LaGrange Kitchen 3: New lighting was installed in the curio to highlight special pieces. 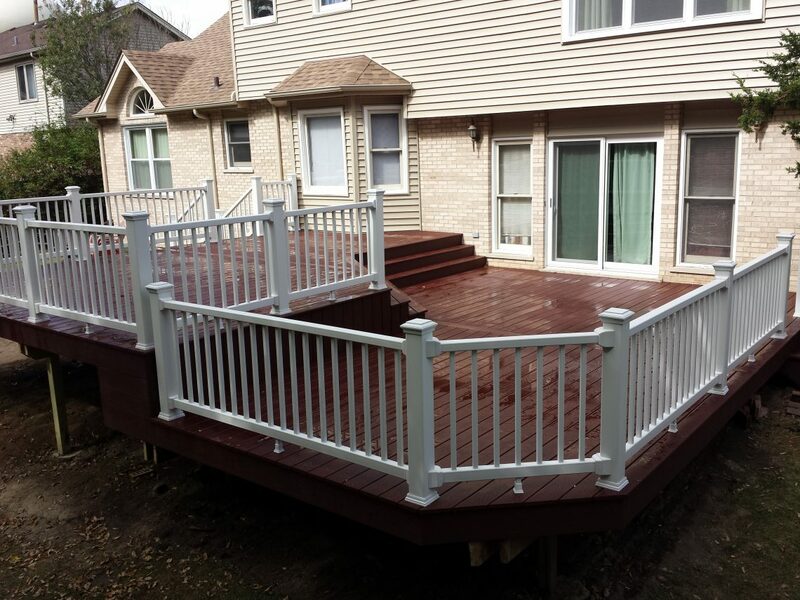 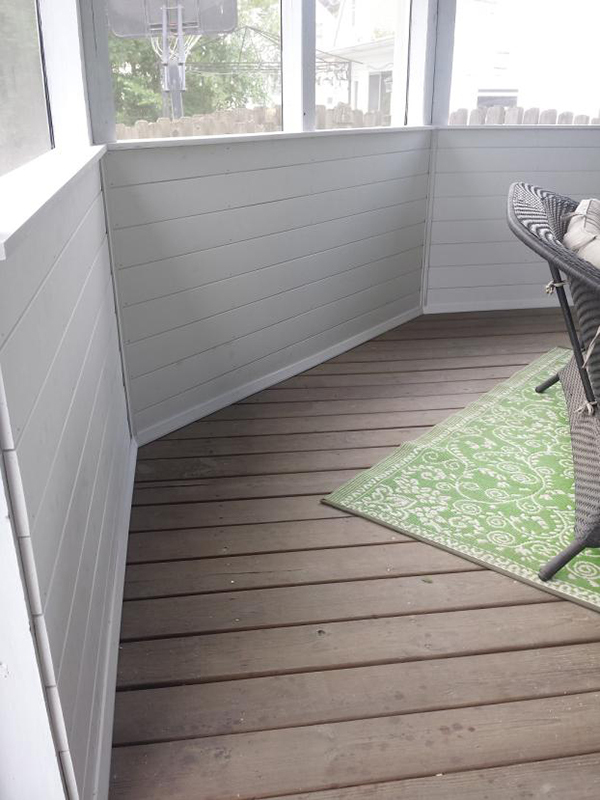 Orland Park Trex Deck: Trex Select deckboards and skirting in Saddle and Trex Select railings, posts, caps and ballusters in Classic White. 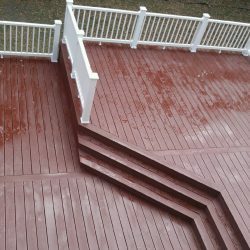 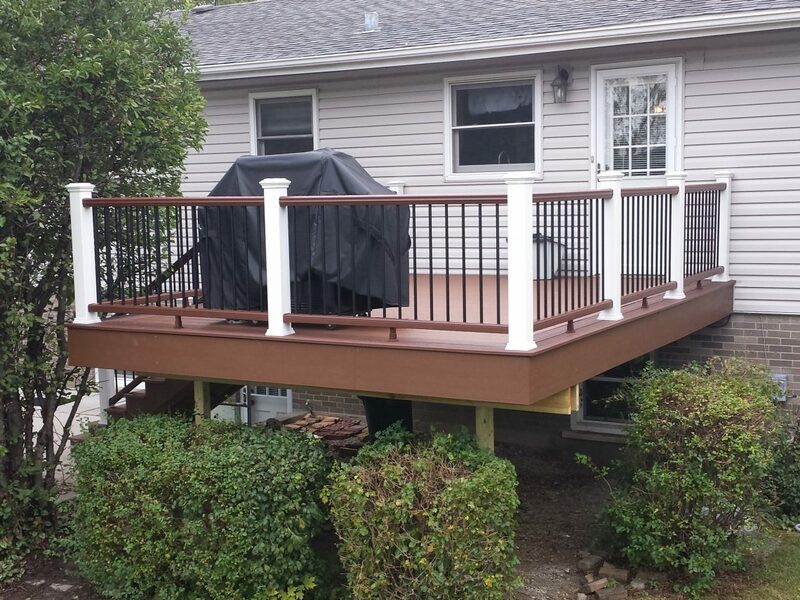 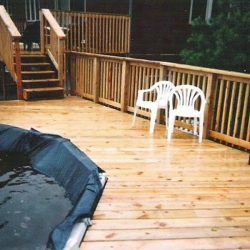 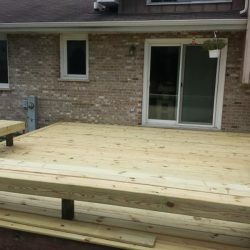 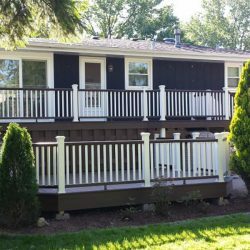 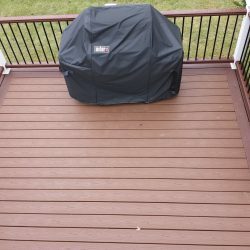 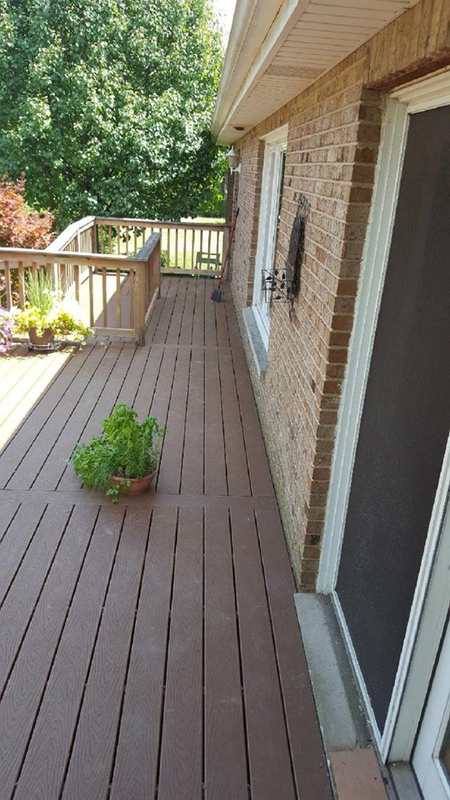 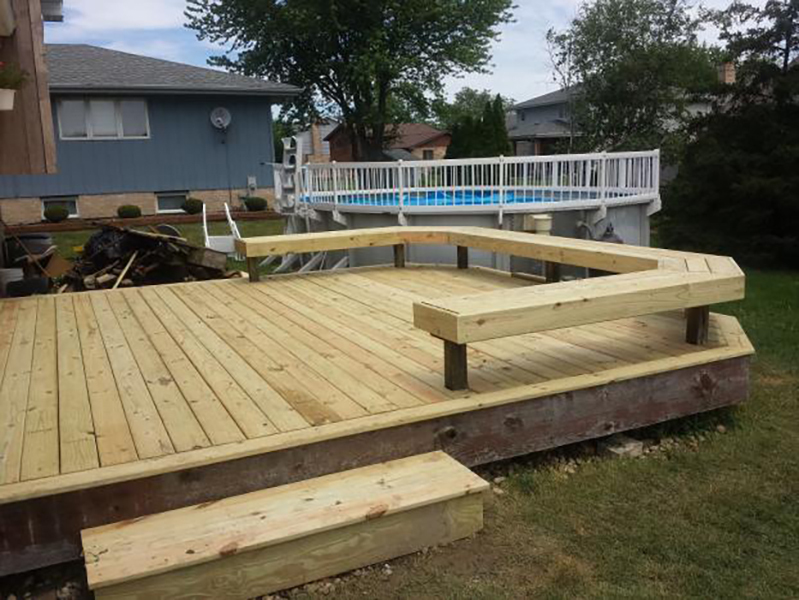 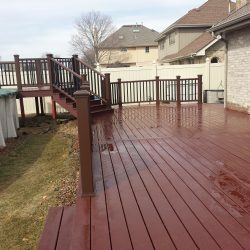 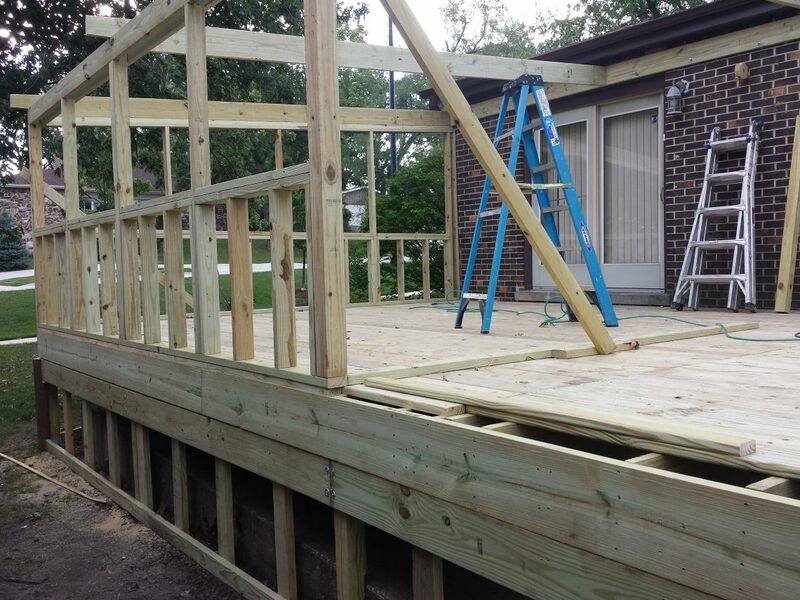 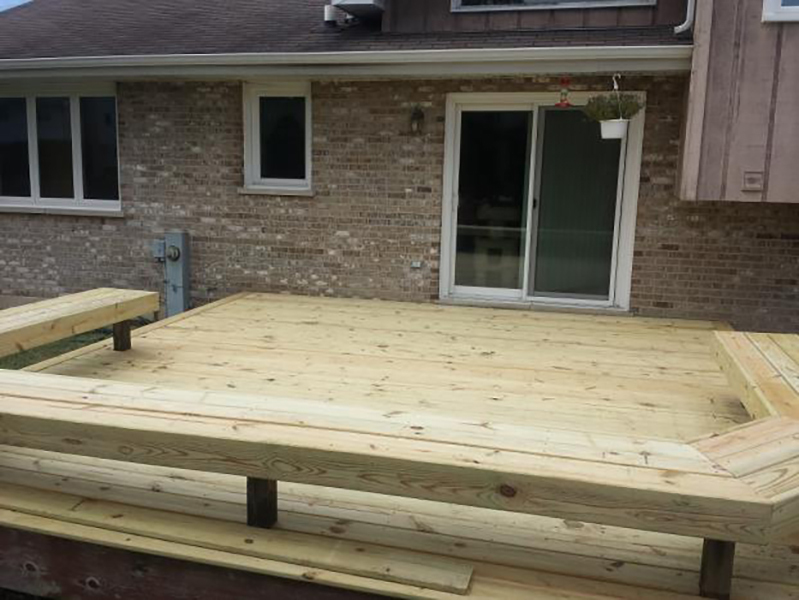 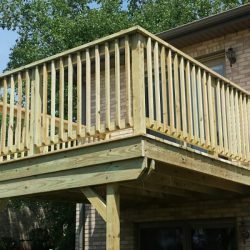 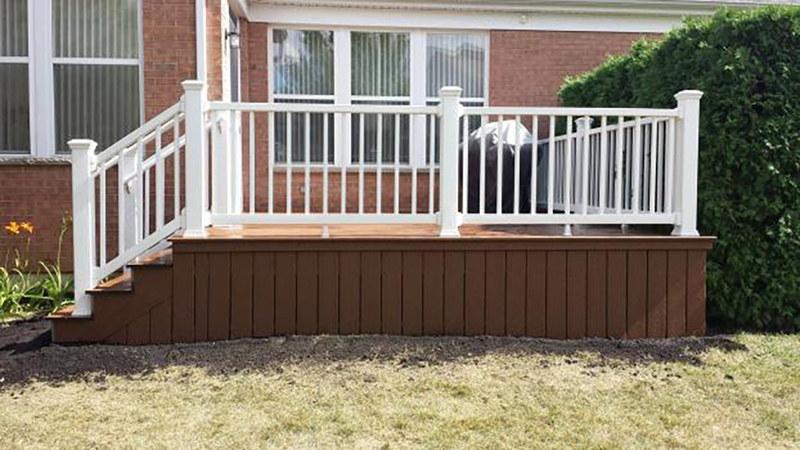 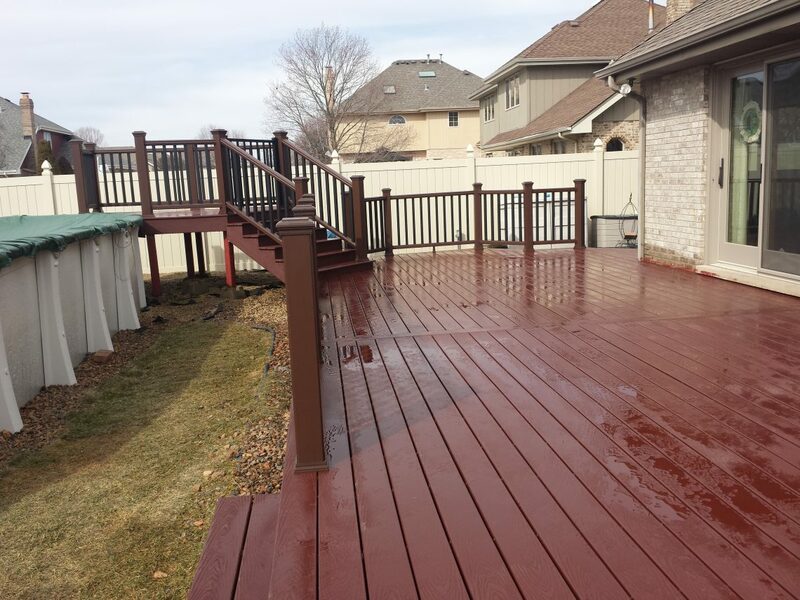 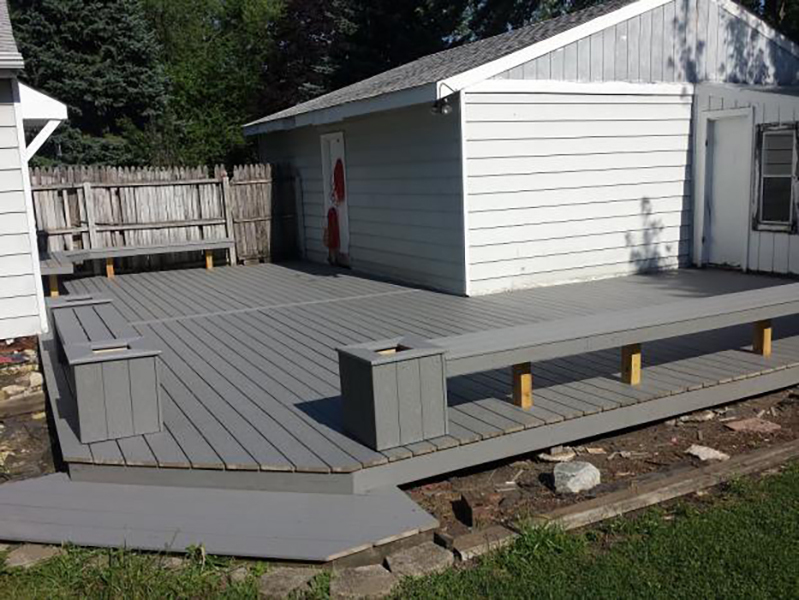 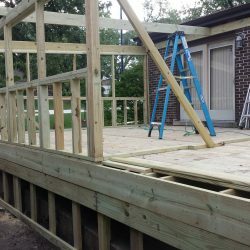 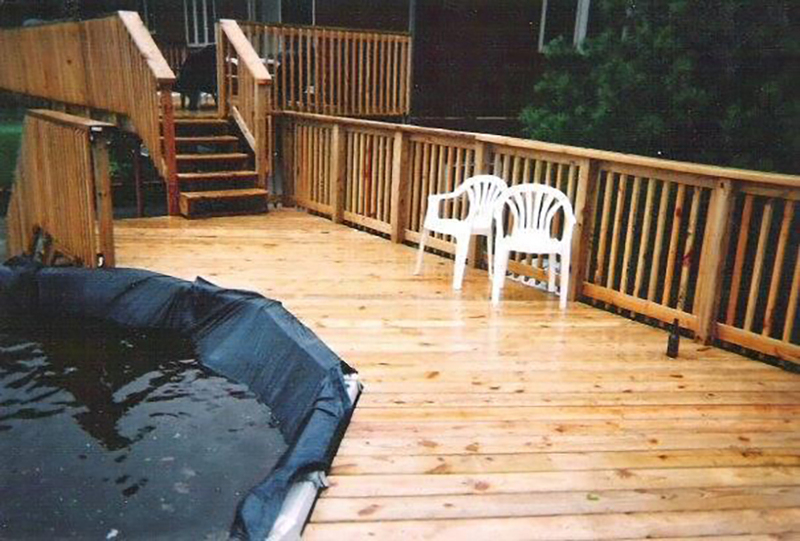 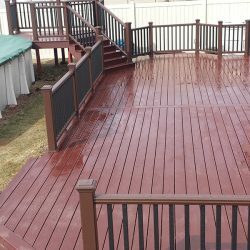 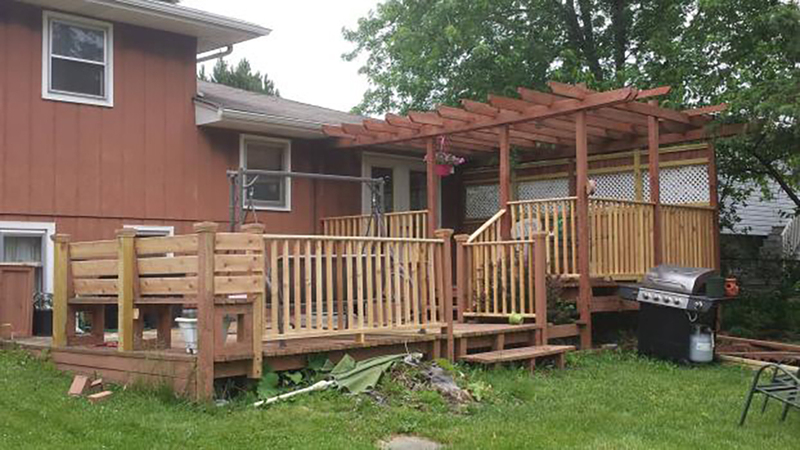 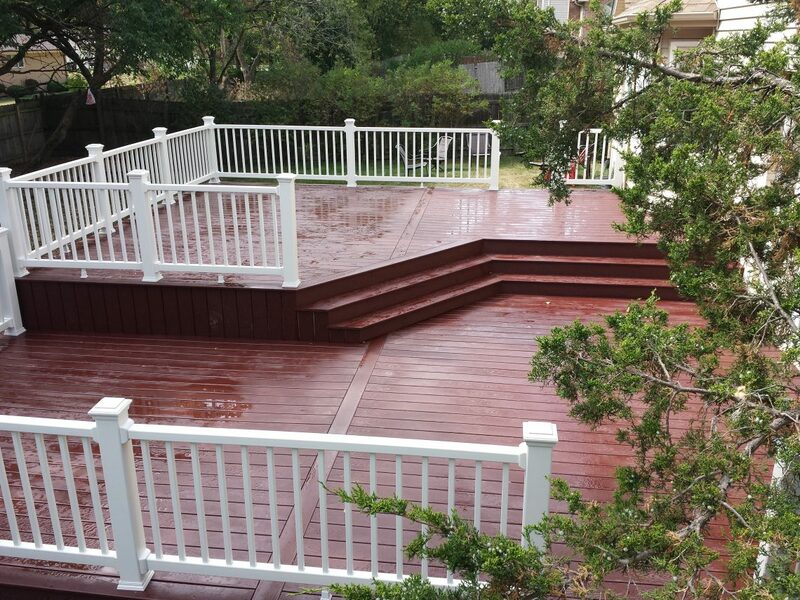 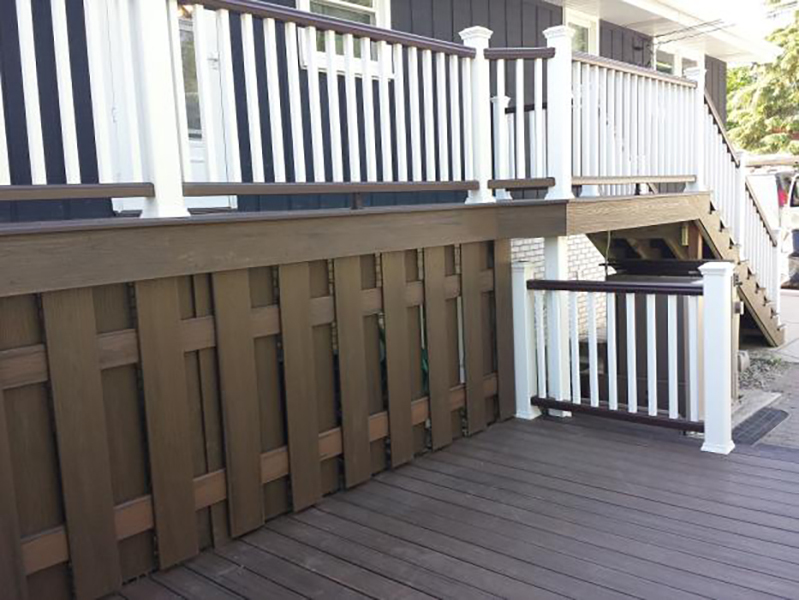 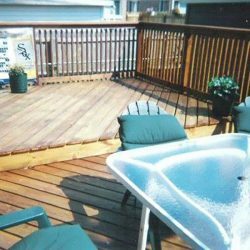 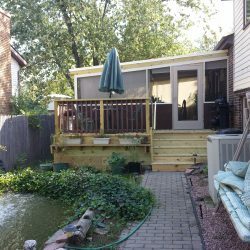 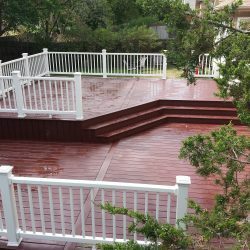 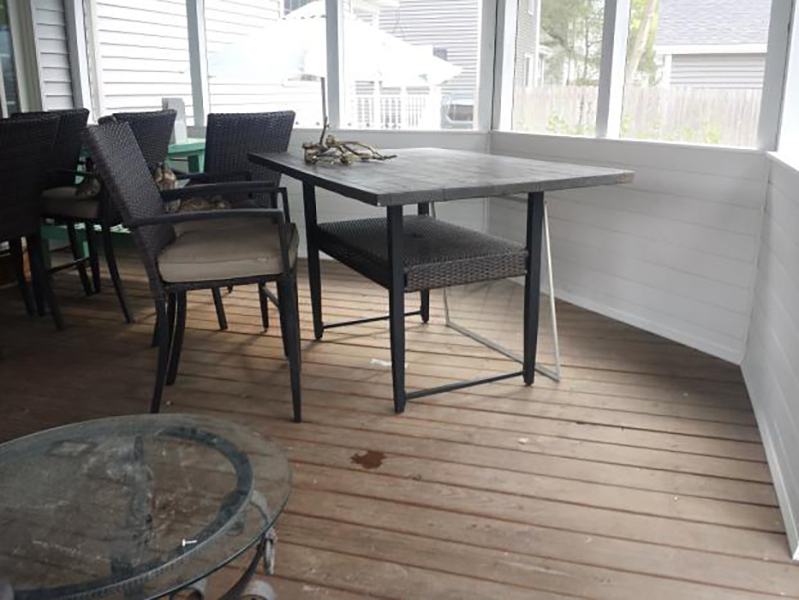 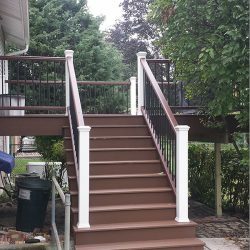 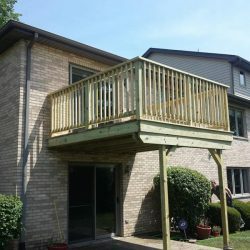 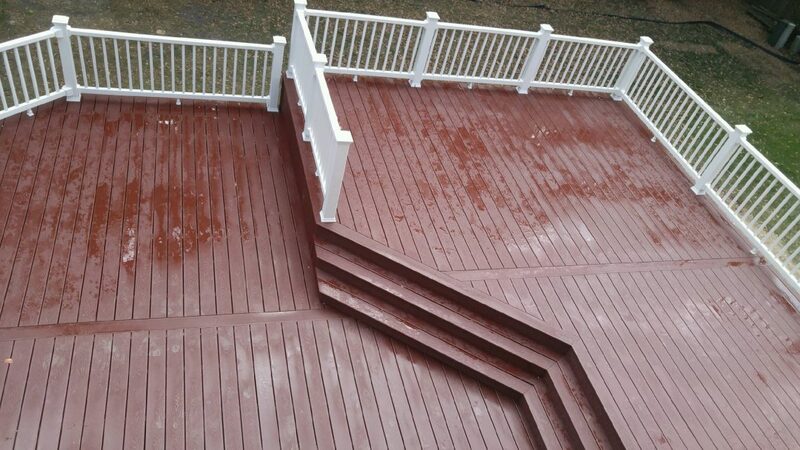 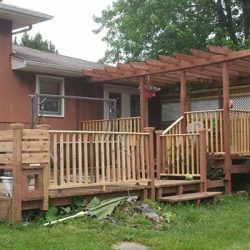 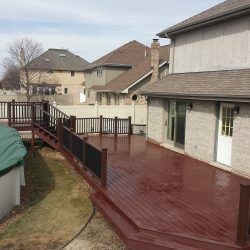 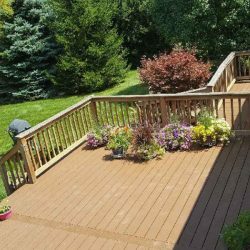 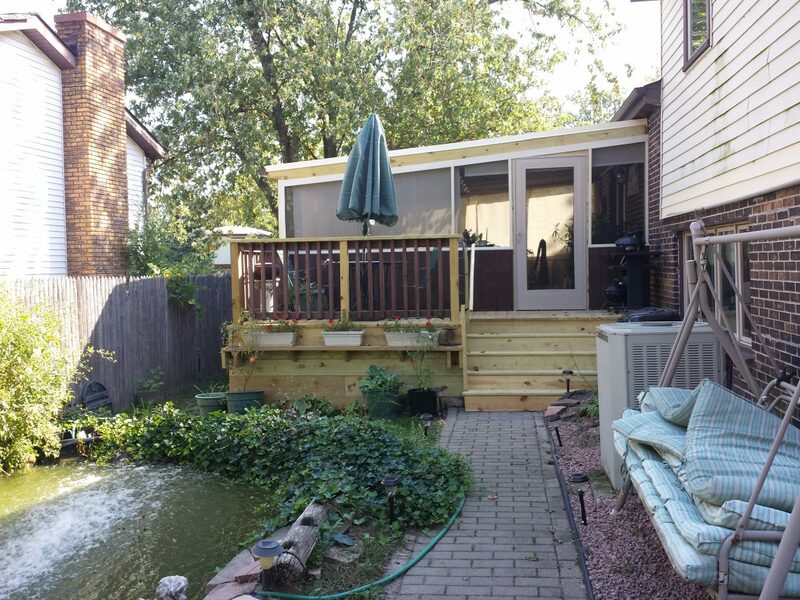 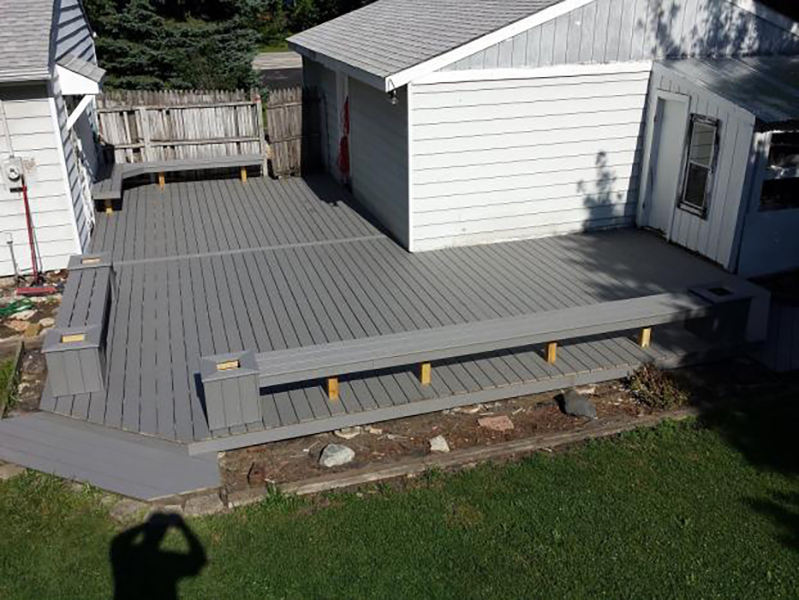 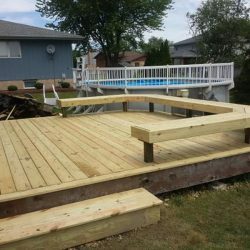 Tinley Park Deck Repair – After: This deck was in need of some love and the customer wanted a little more privacy on the one side. 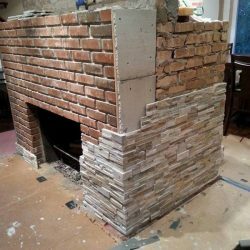 The "bones" were solid and repairs were made where needed. 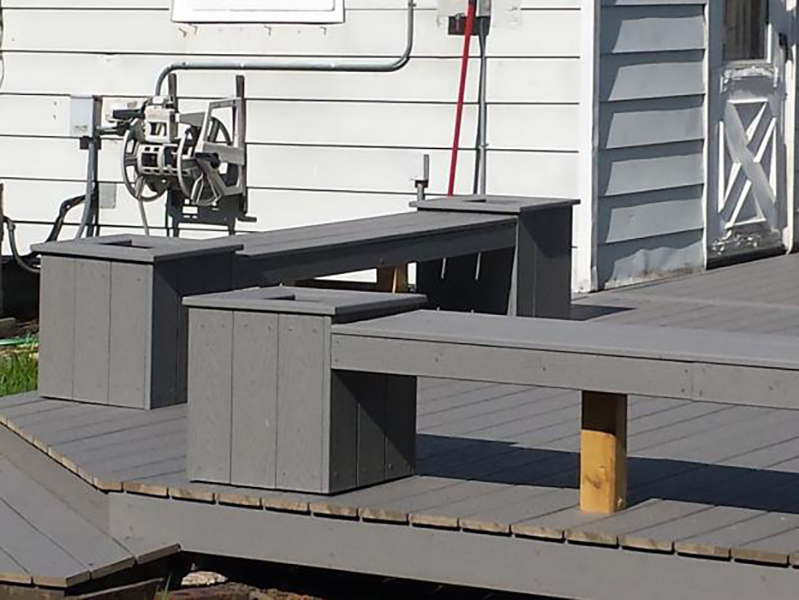 All of the railings were replaced, the bench was completed and two planter boxes were added. 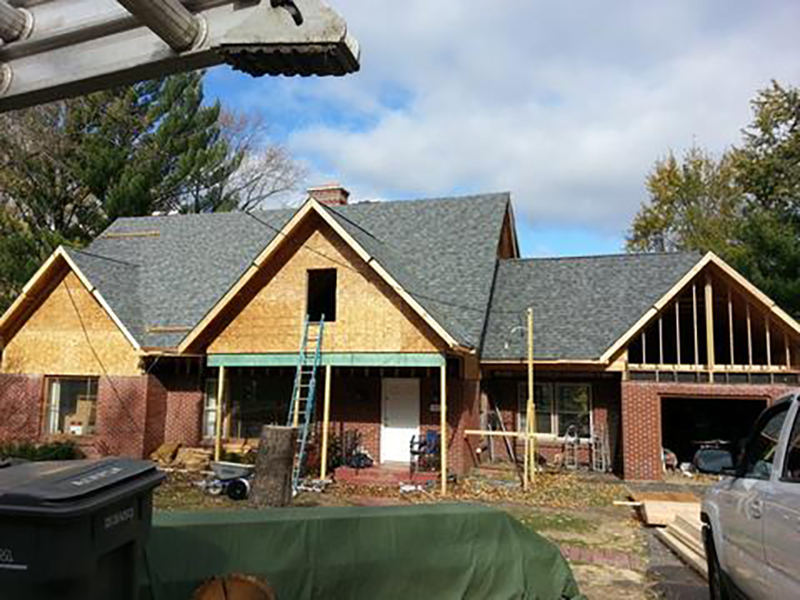 Oak Forest Addition: Added an extra room onto the rear of the house. 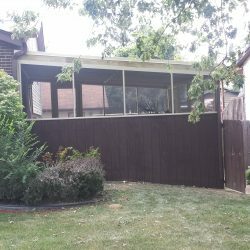 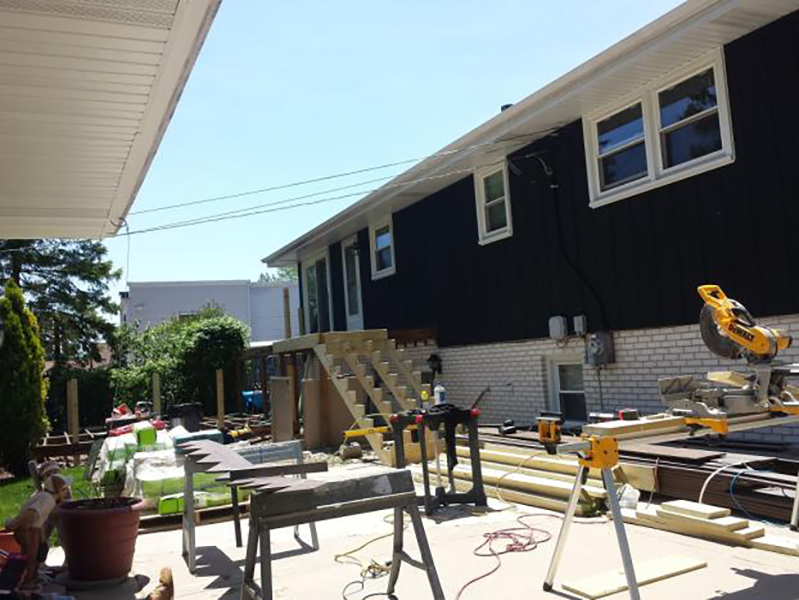 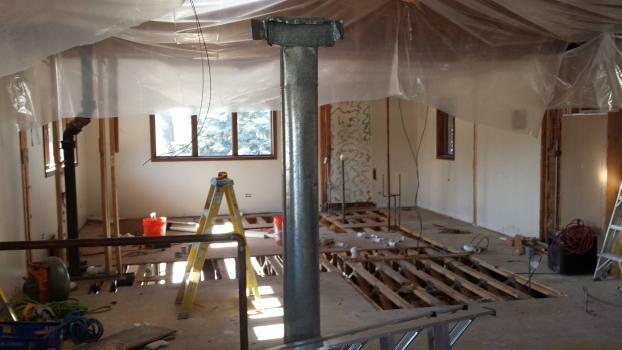 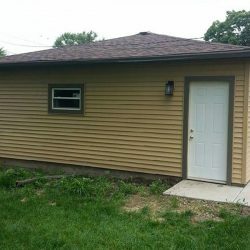 Orland Park 2nd Floor Addition: Built in the early 1950s, the home was severely outdated and a couple basement walls were buckling and leaking. 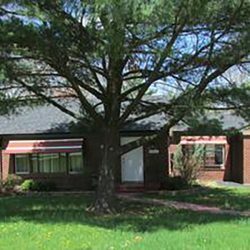 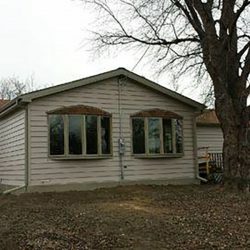 The home was originally a ranch style (2 bed/1 bath) home with a full basement. 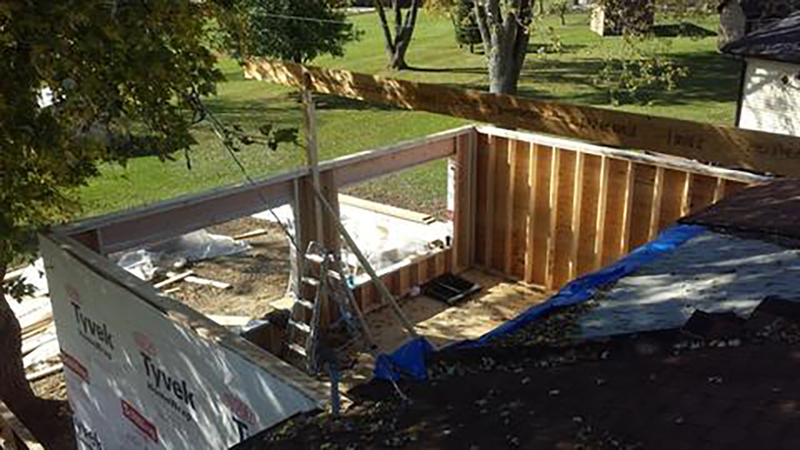 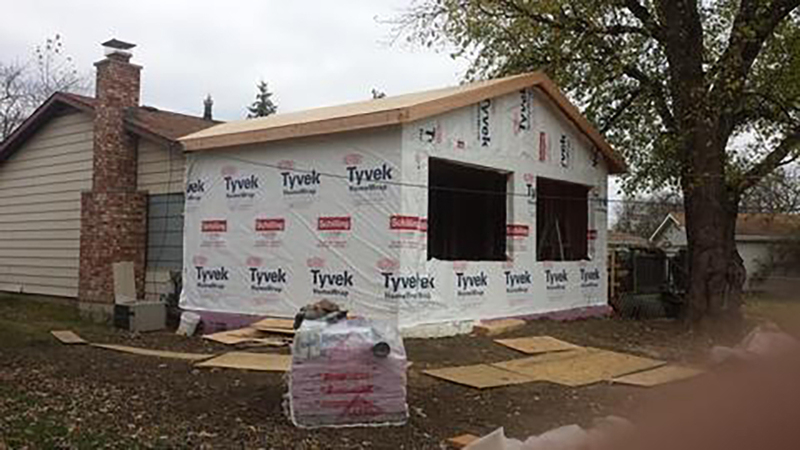 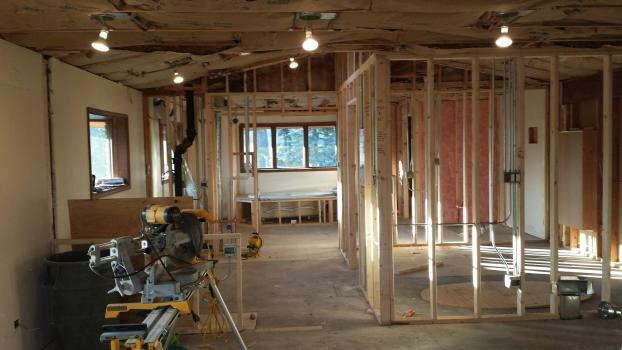 The second floor was added on, creating space for 4 spacious bedrooms, a full bathroom, laundry room and storage. 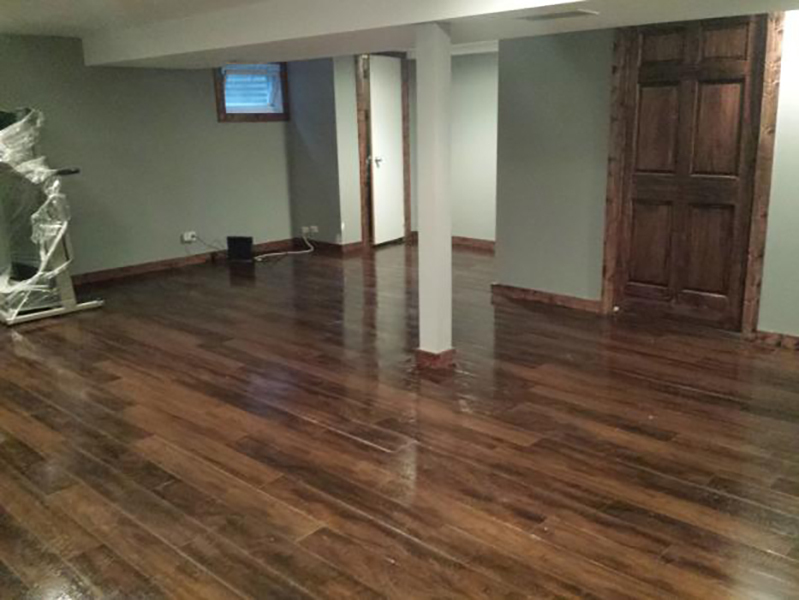 The 2 bedrooms on the main level were turned into a family room and an office/spare bedroom. 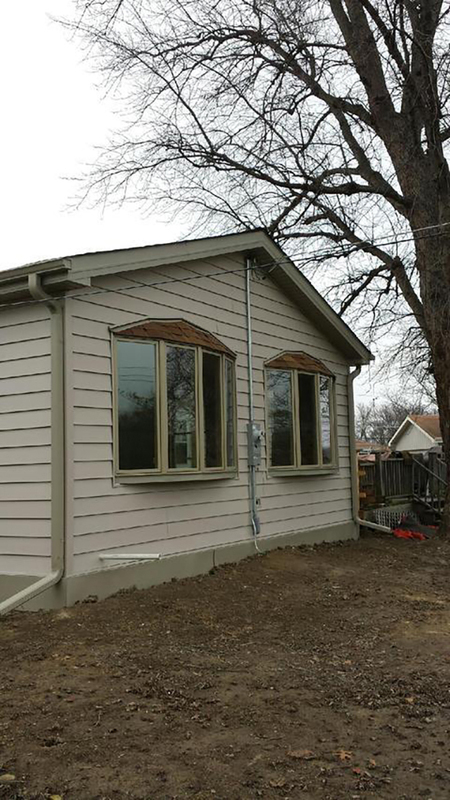 Orland Park 2nd Floor Addition: Rear of the original home. 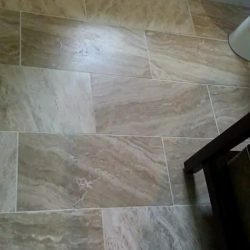 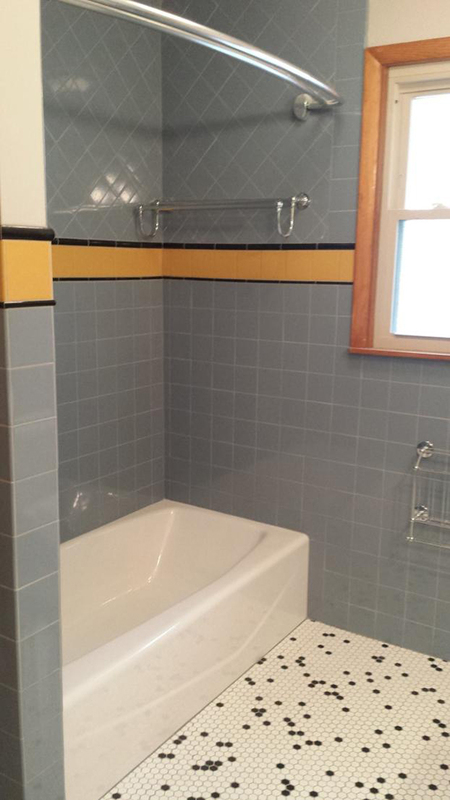 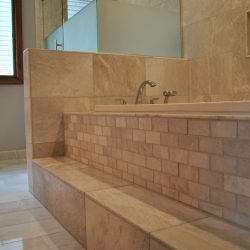 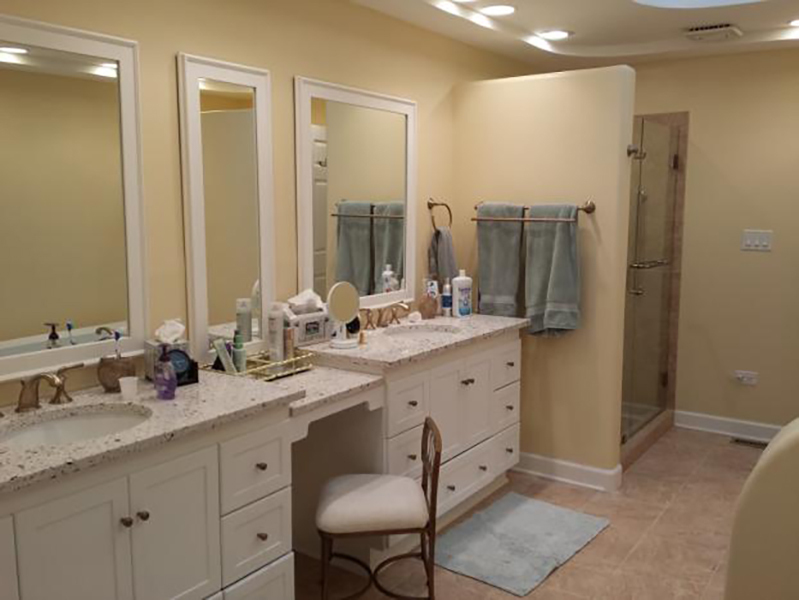 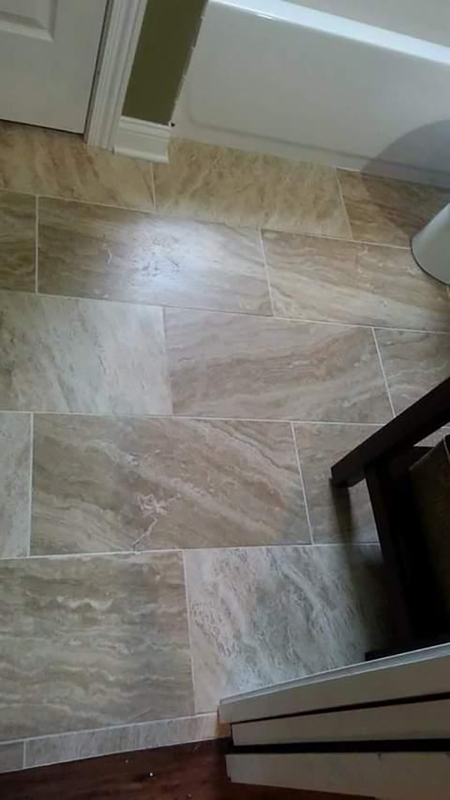 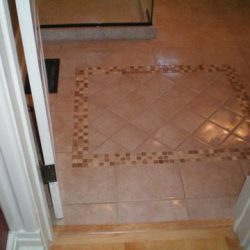 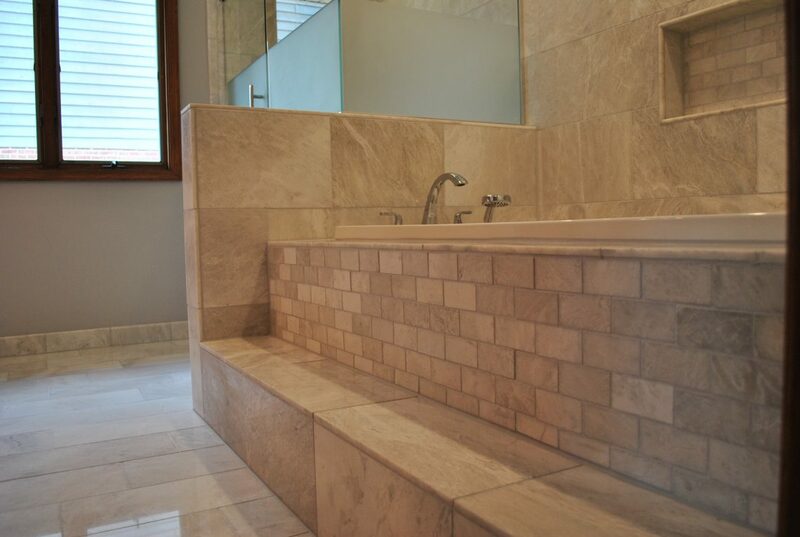 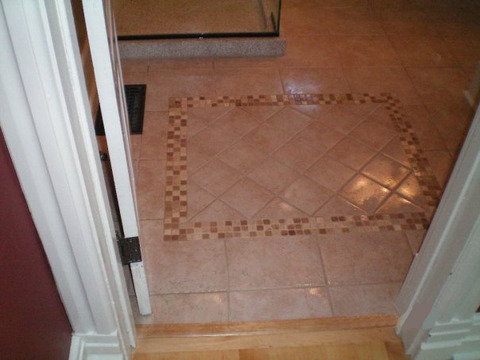 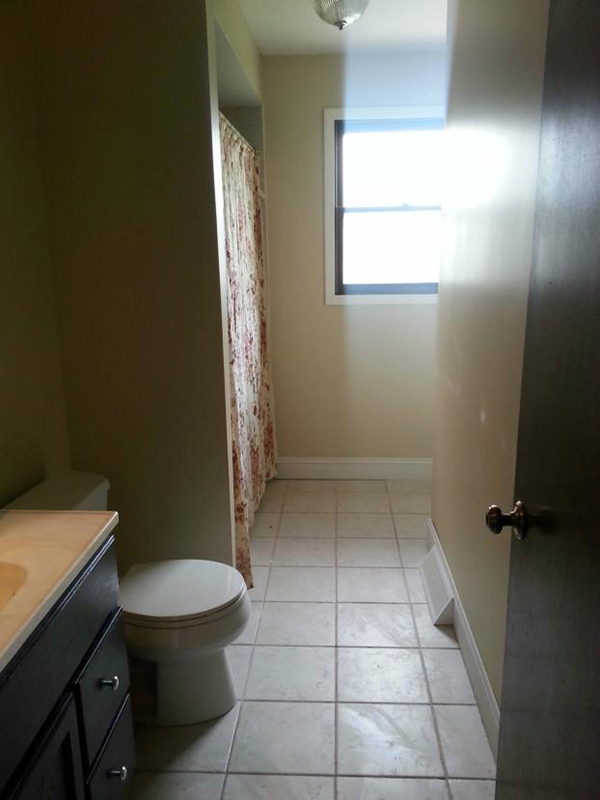 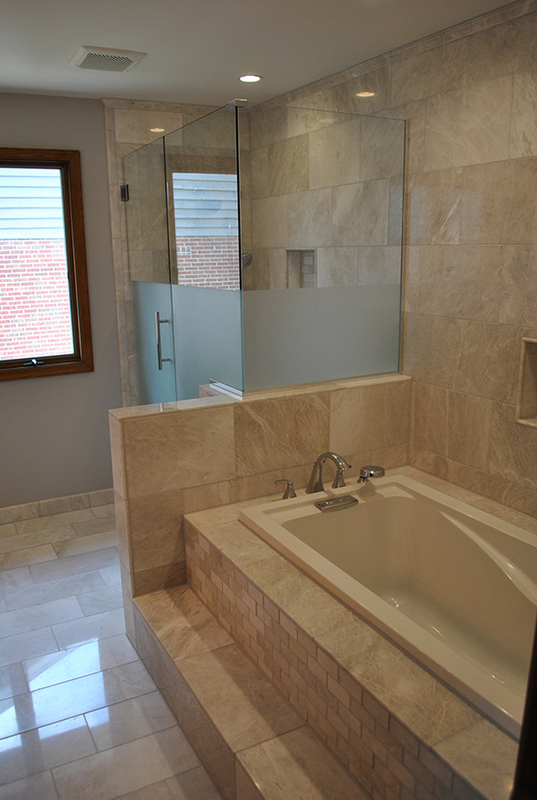 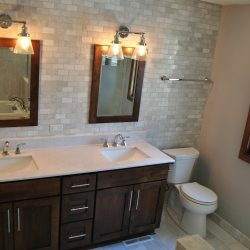 Orland Park Bathroom: Brand new bathroom with travertine tiles in the shower and floor. 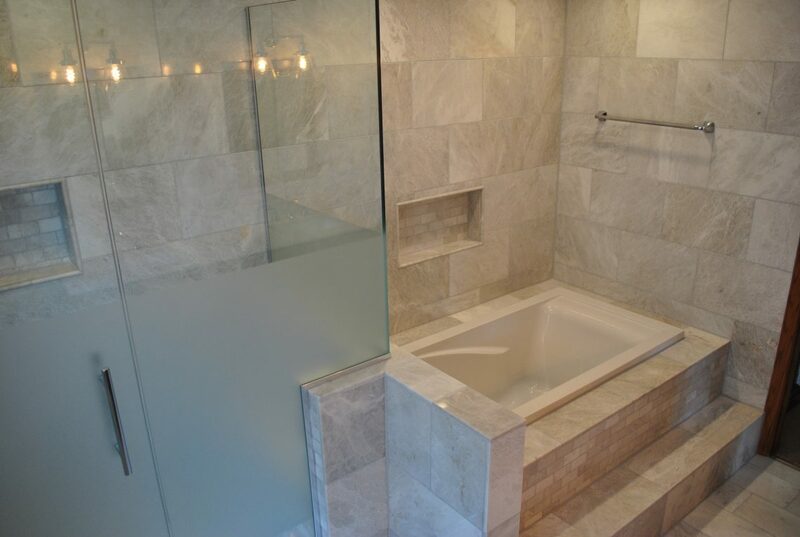 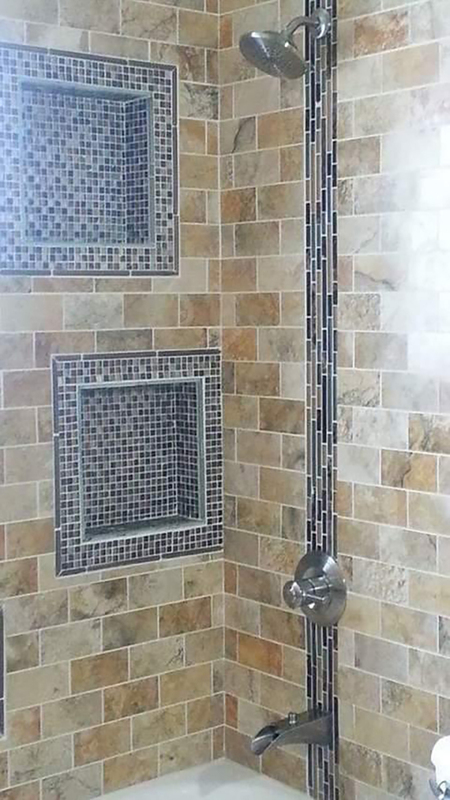 Custom niches in the shower with accent glass tiles. 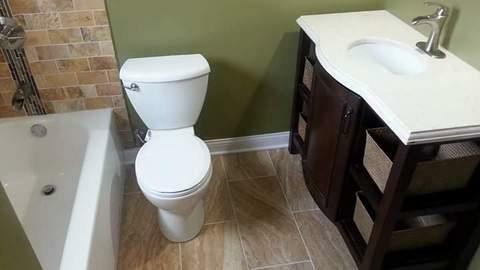 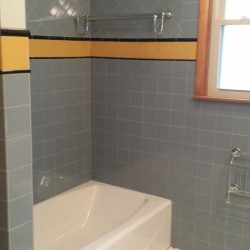 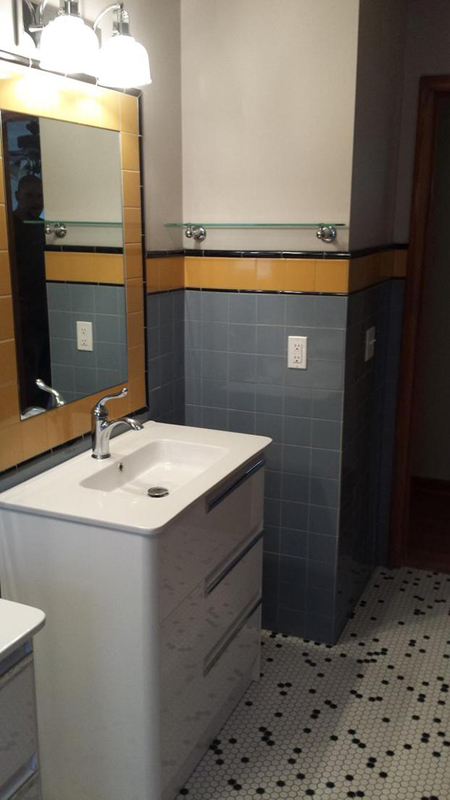 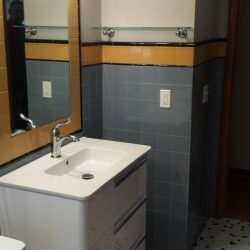 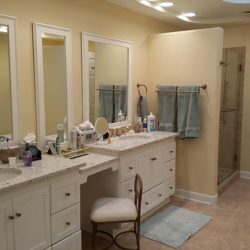 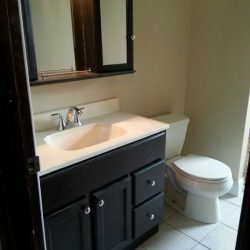 Tinley Park Bathroom Remodel: Partial remodel. 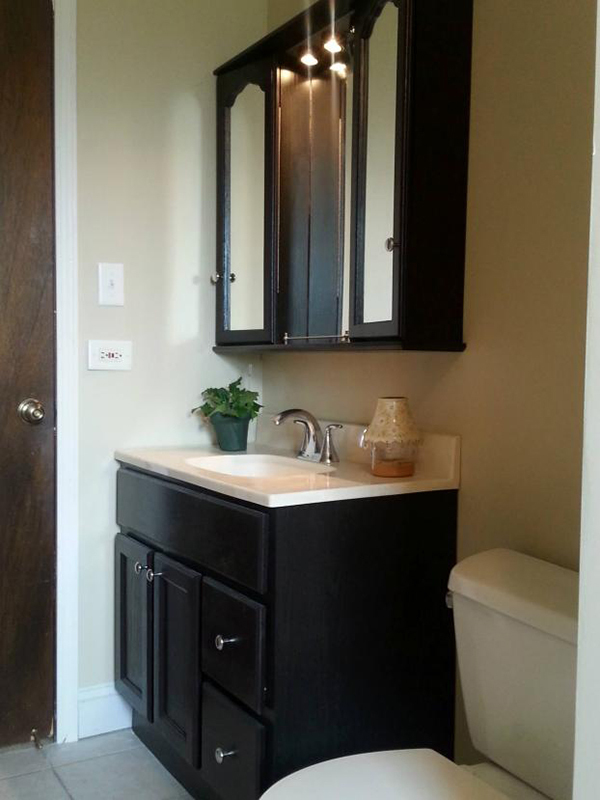 New drywall and trim throughout and redid vanity and medicine cabinet. 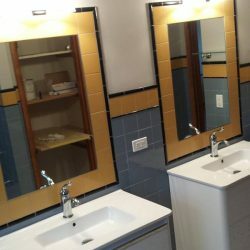 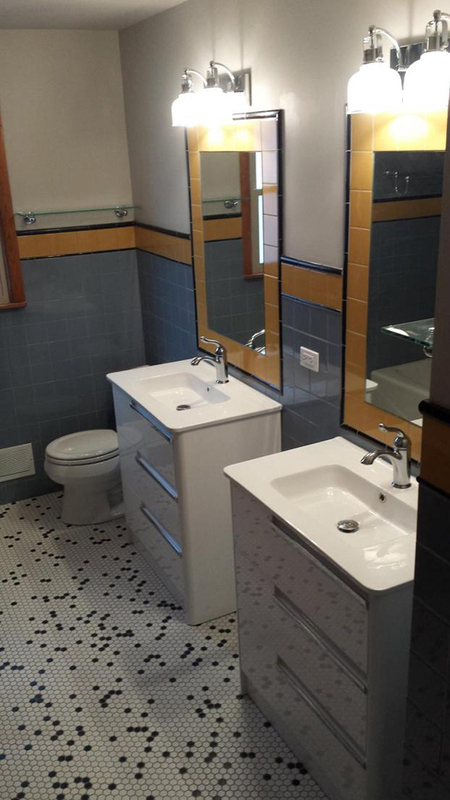 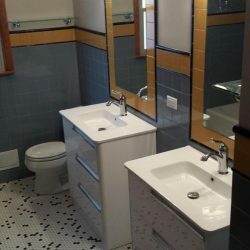 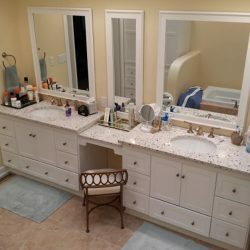 Palos Hills Bathroom Remodel: Full gut and remodel. 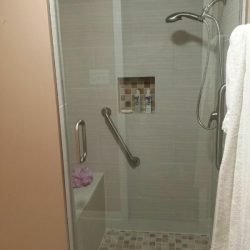 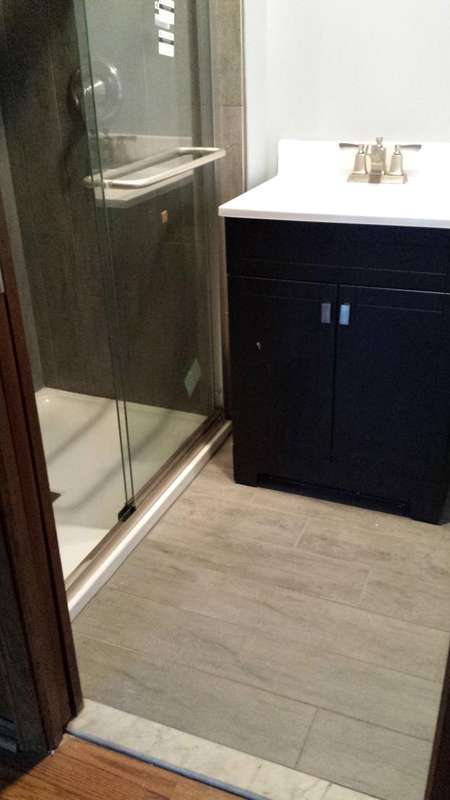 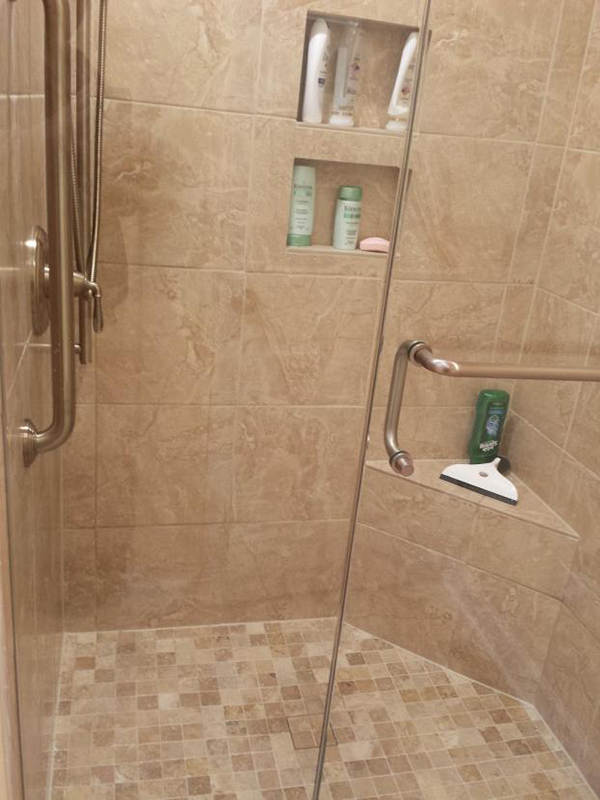 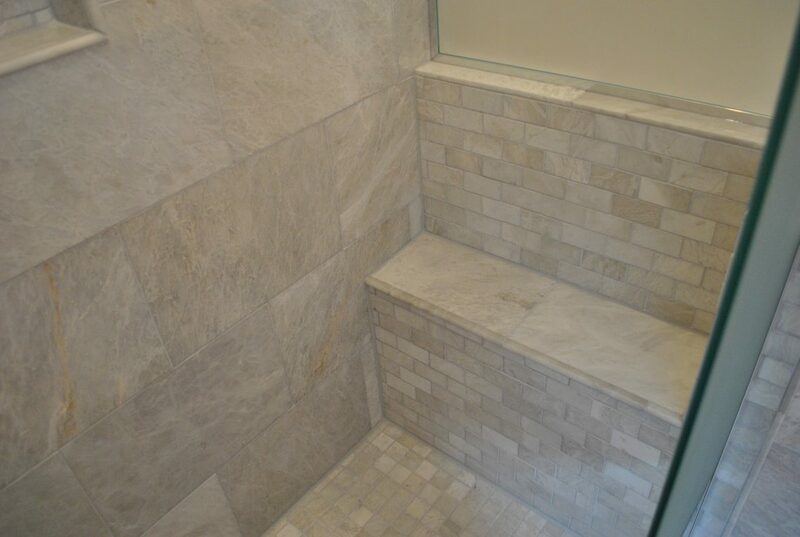 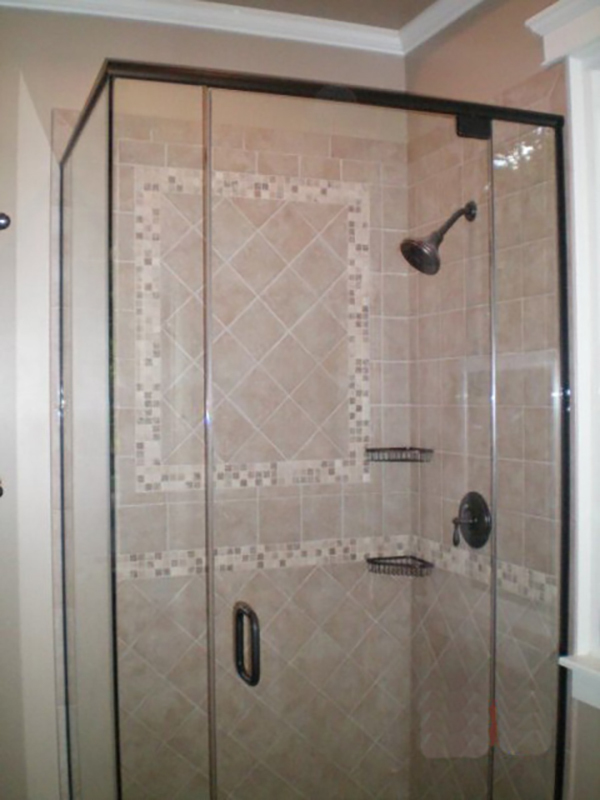 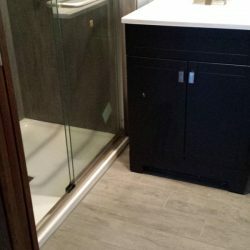 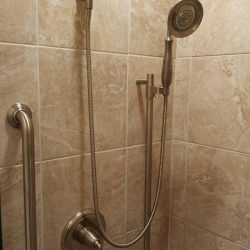 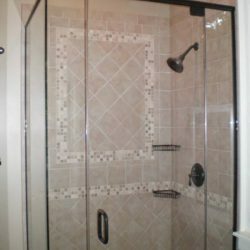 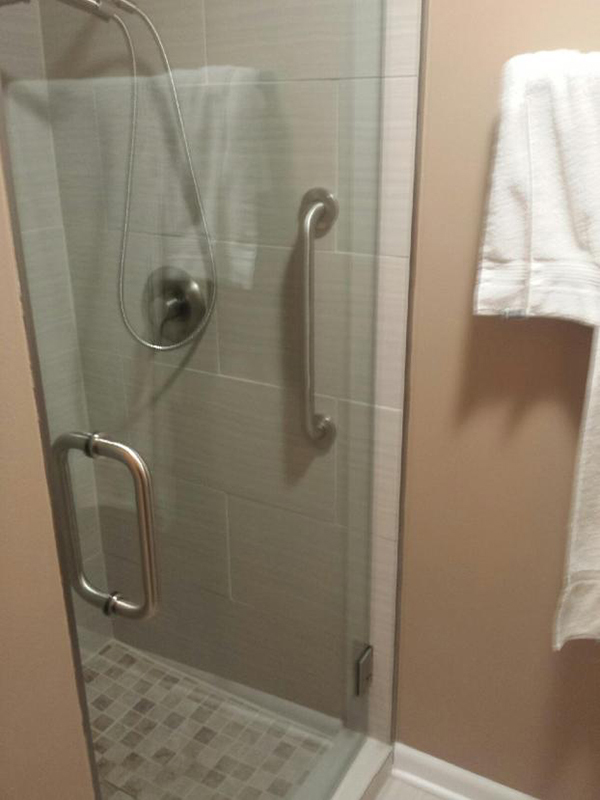 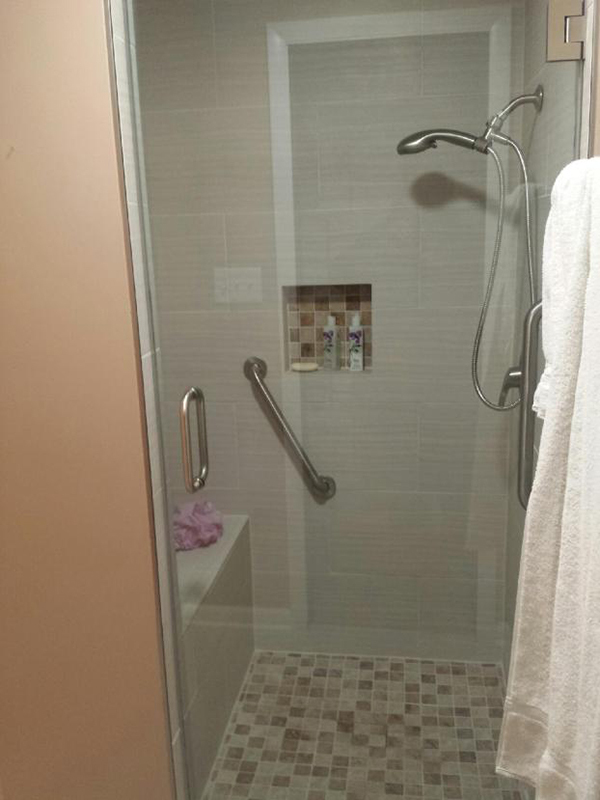 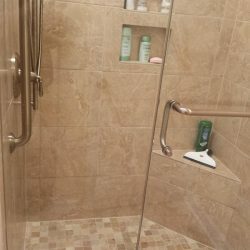 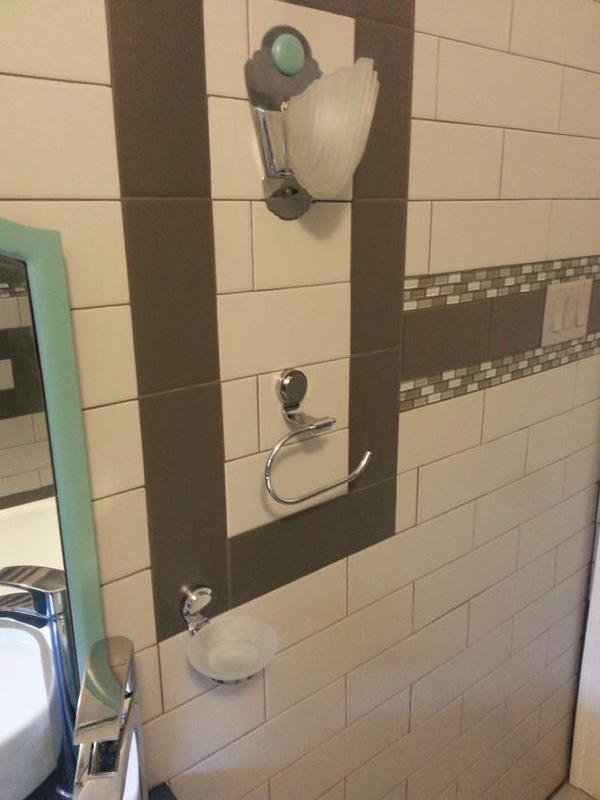 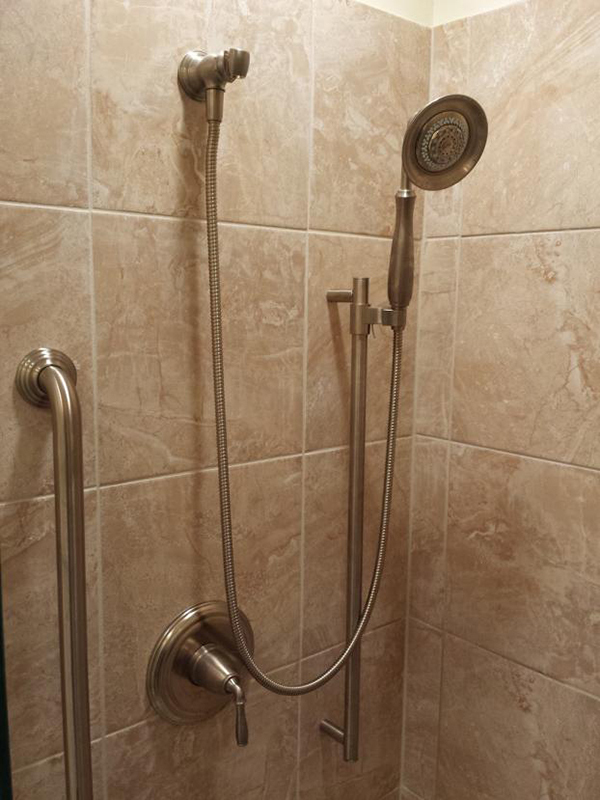 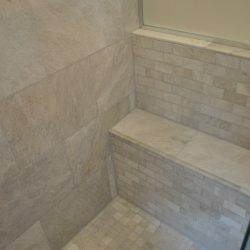 A full shower was added with a custom seat, niche and grab bars. 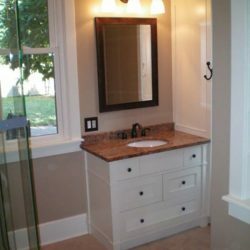 Poplar Bathroom Remodel: Full gut and remodel. 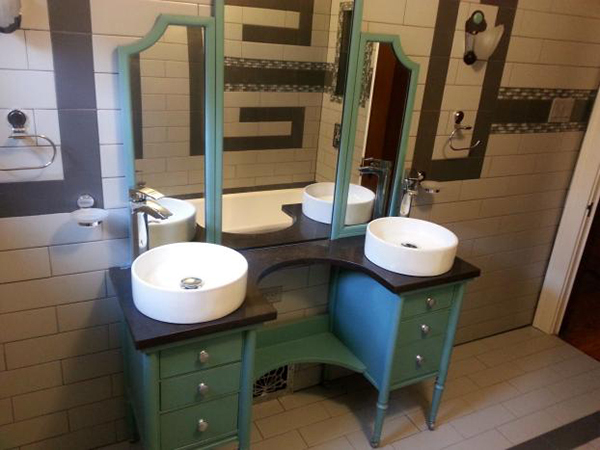 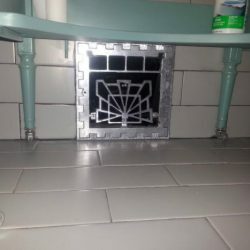 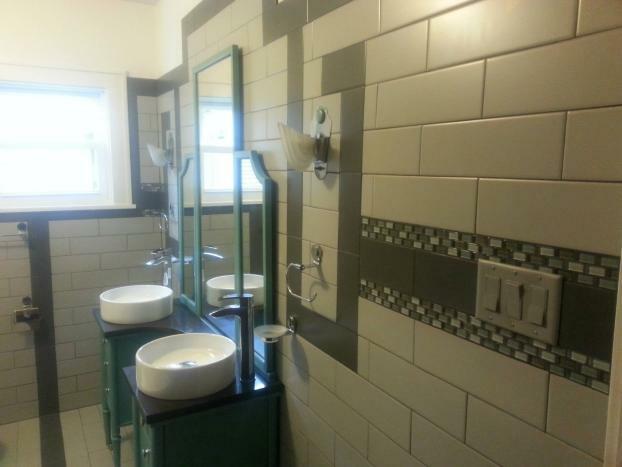 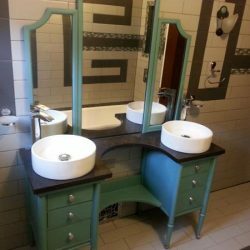 Custom art deco designed ceramic and glass wall tile, repurposed vanity from vintage dresser, and antique wall sconces. 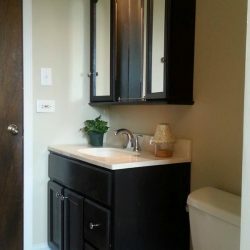 Poplar Bathroom Remodel: This vanity was repurposed from an old dresser found on Craigslist. 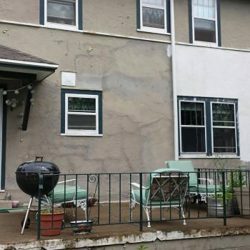 There were nearly a dozen coats of paint on it. 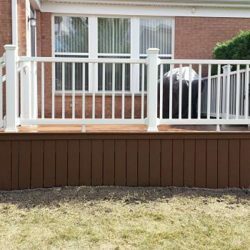 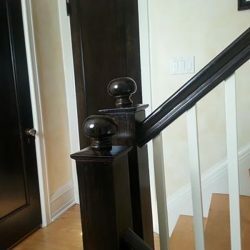 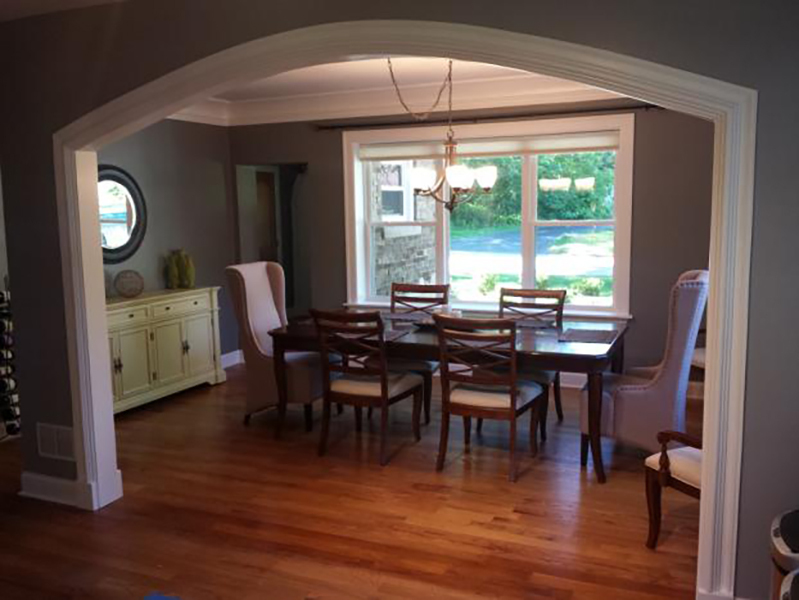 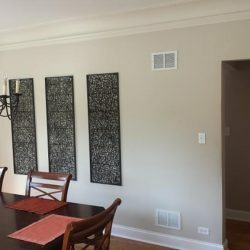 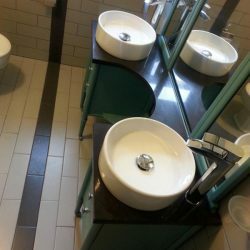 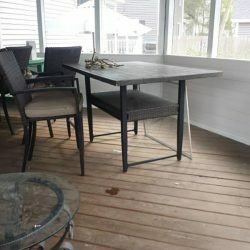 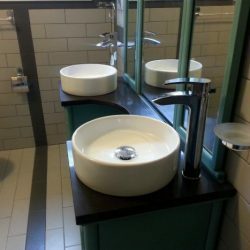 Palos Park – After: Review by Kate S. in Palos Park, IL I am very pleased with the finished product and a few changes were made along the way and cost was always discussed before anything was done. 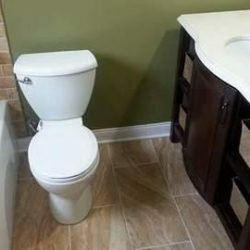 This was a complete tear out and redo. 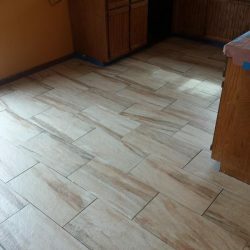 They were very easy to work with. 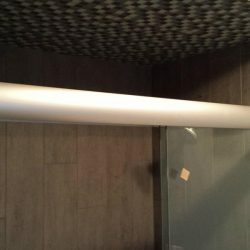 I will definitely use them for other projects. 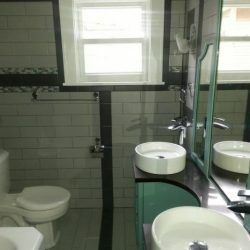 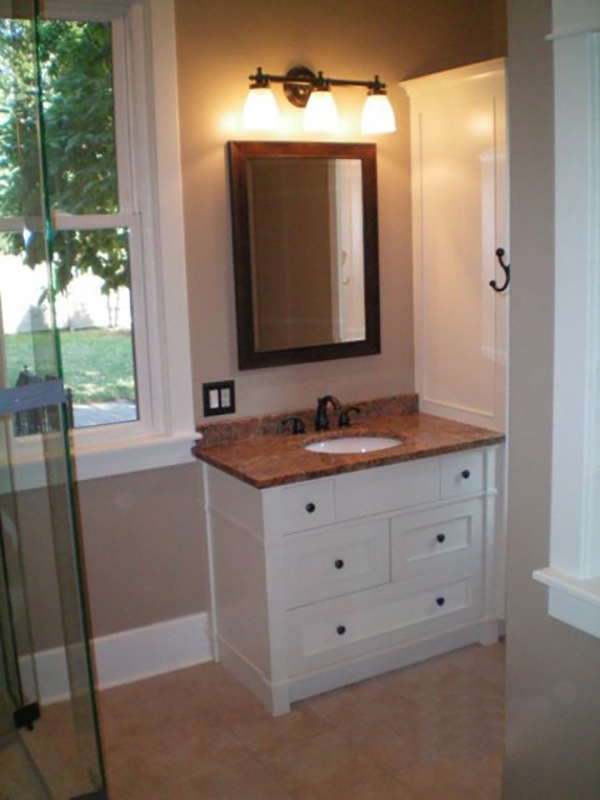 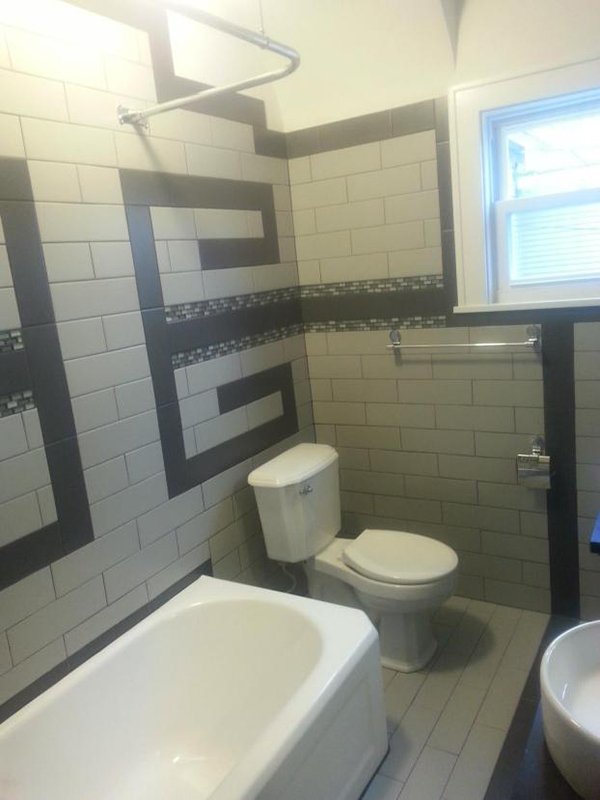 Cobb Bathroom: Complete gut and redesign of this bathroom due to a broken water pipe. 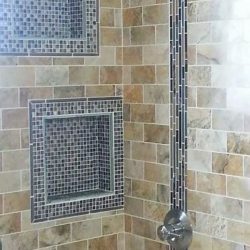 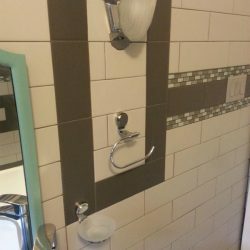 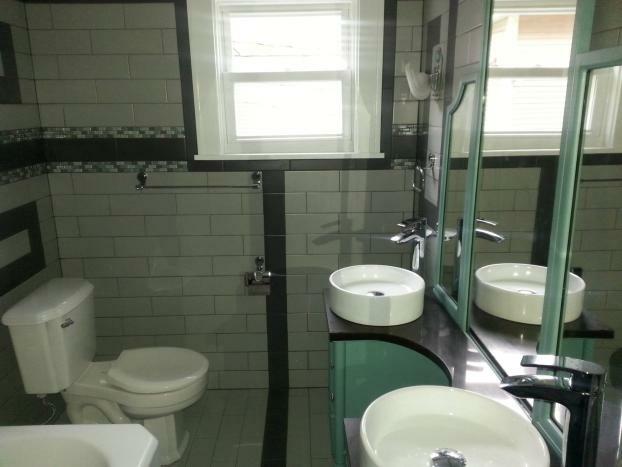 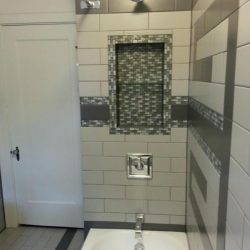 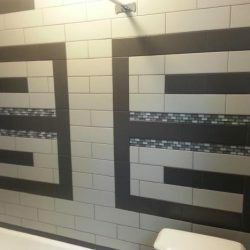 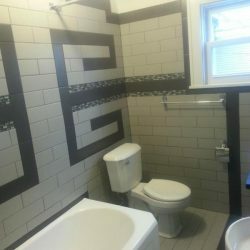 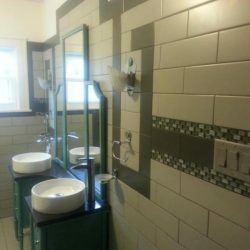 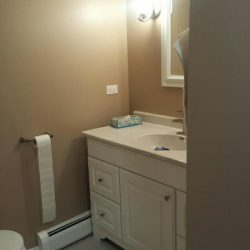 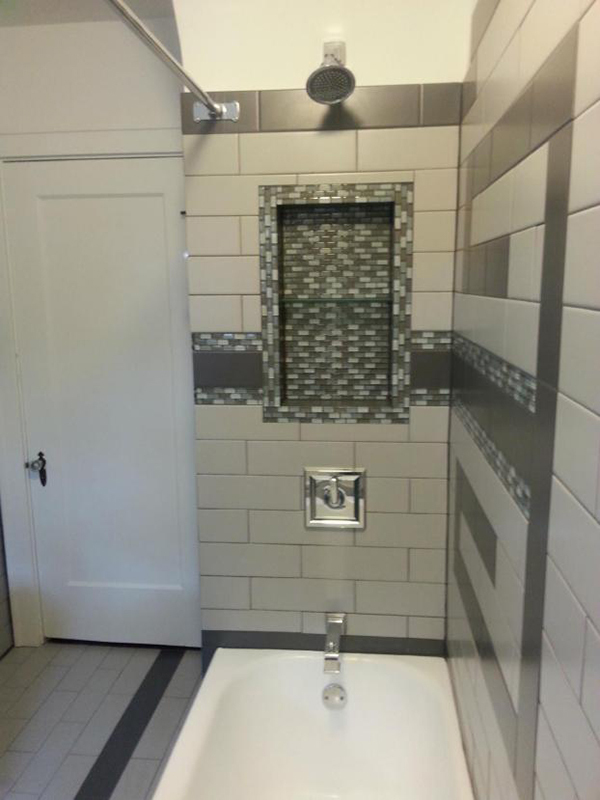 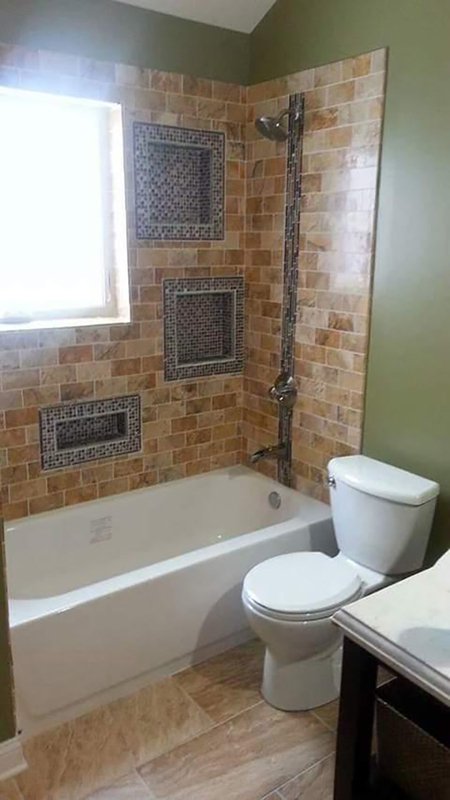 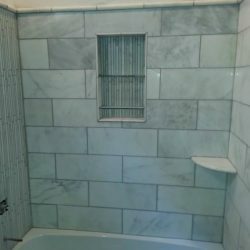 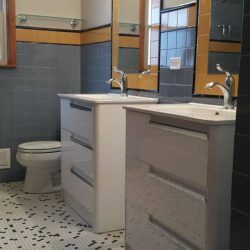 Turned out to be a beautiful bathroom with tiled shower and floor with mosaic designs, walk in shower with oil rubbed bronze shower doors, trim kit and accessories, crown molding on each level of the tiered ceiling, and custom made Amish shaker style cabinets. 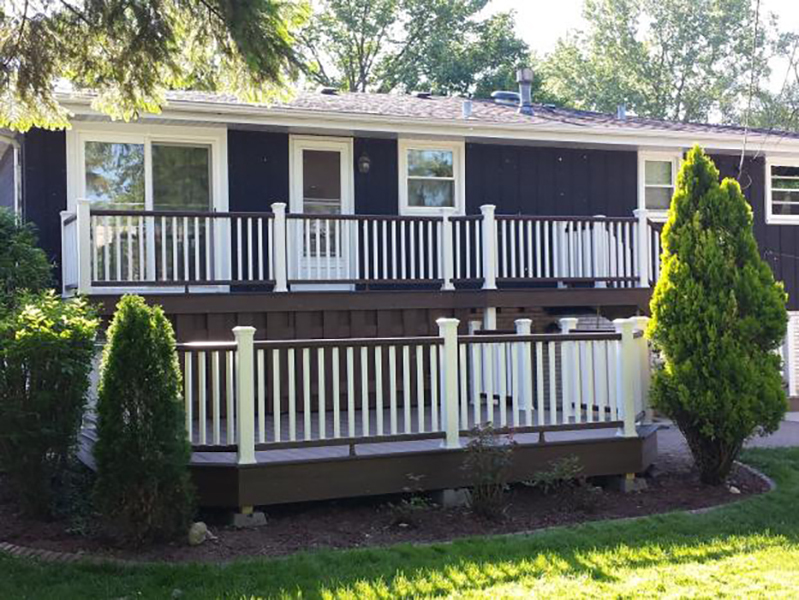 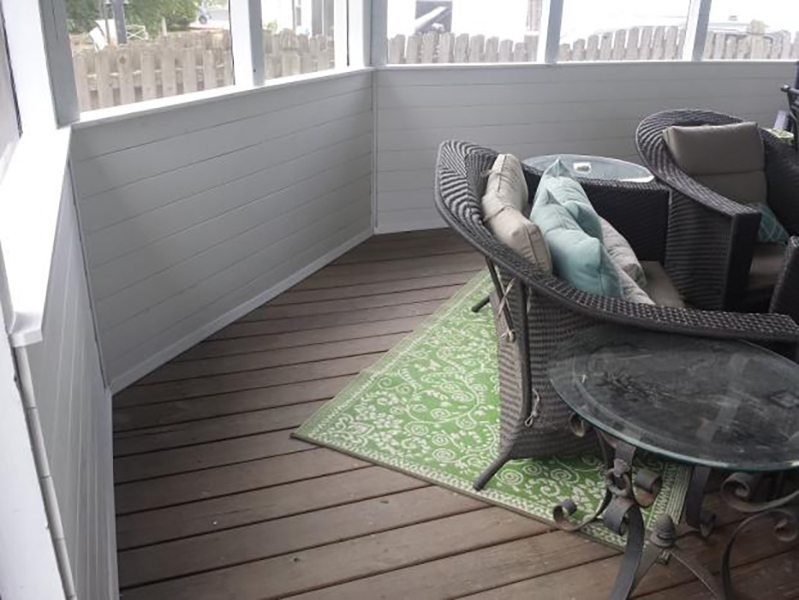 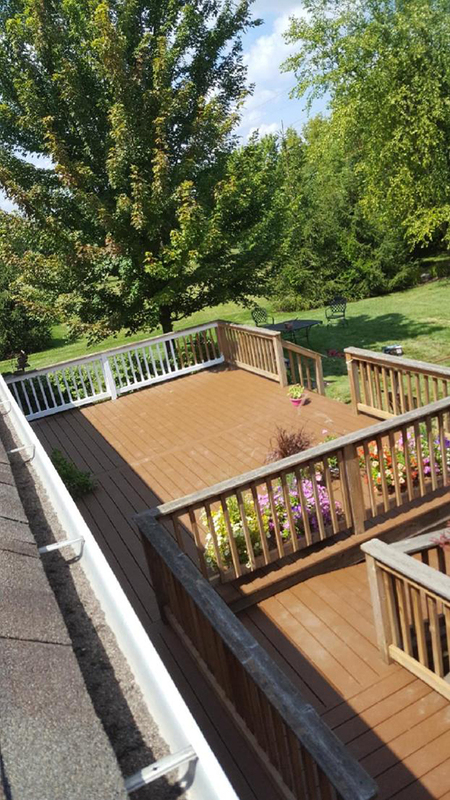 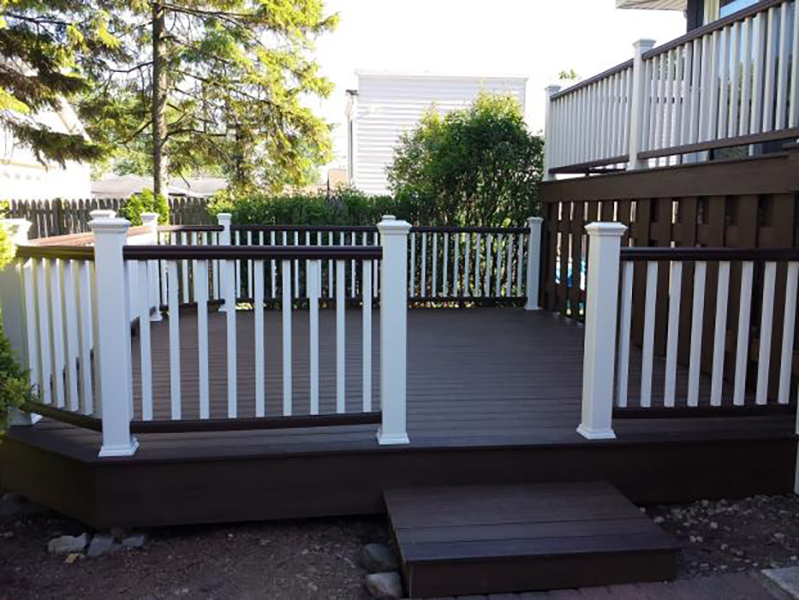 Hazel Crest Trex Deck: 900+ square foot Trex Select deck in Madeira with Classic White railing system. 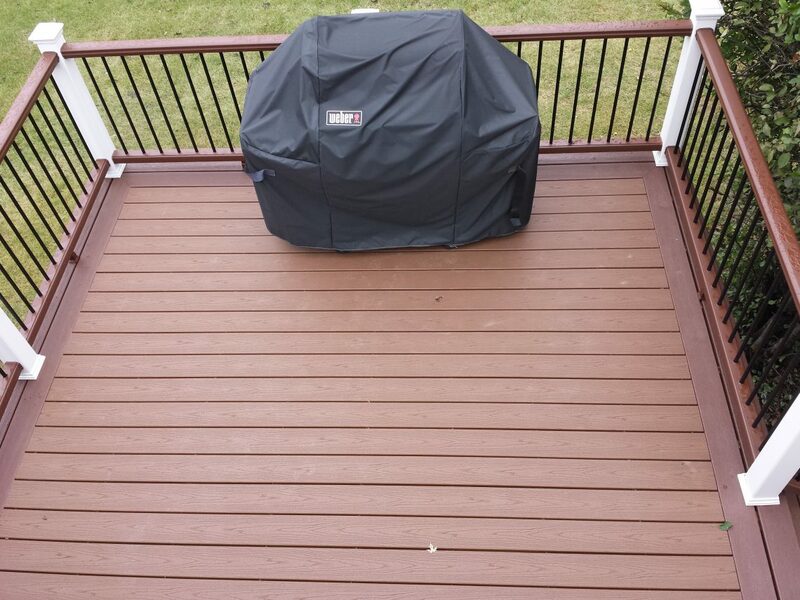 Palos Heights Trex Deck: Trex Enhance decking in Saddle with a Fire Pit border. 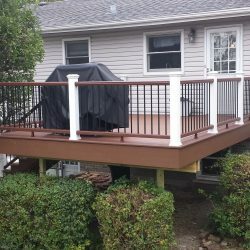 Railings have Fire Pit top and bottom rails with Classic White posts and caps and black round aluminum balusters. 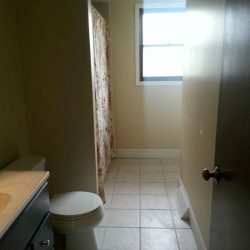 Cobb Bathroom – Before: Complete gut and redesign of this bathroom due to a broken water pipe. 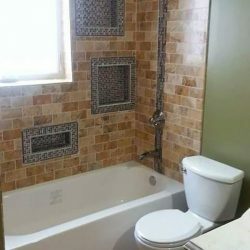 Turned out to be a beautiful bathroom with tiled shower and floor with mosaic designs, walk in shower with oil rubbed bronze shower doors, trim kit and accessories, crown molding on each level of the tiered ceiling, and custom made Amish shaker style cabinets. 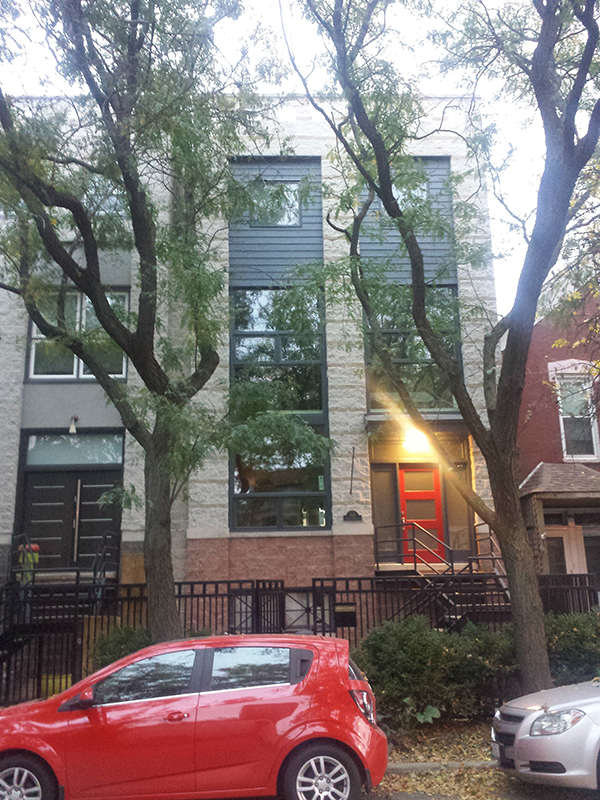 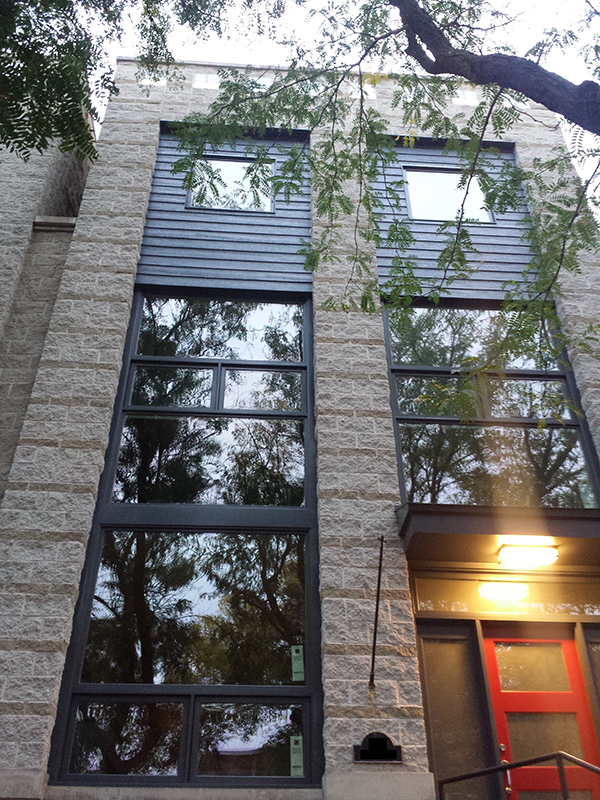 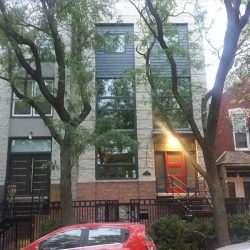 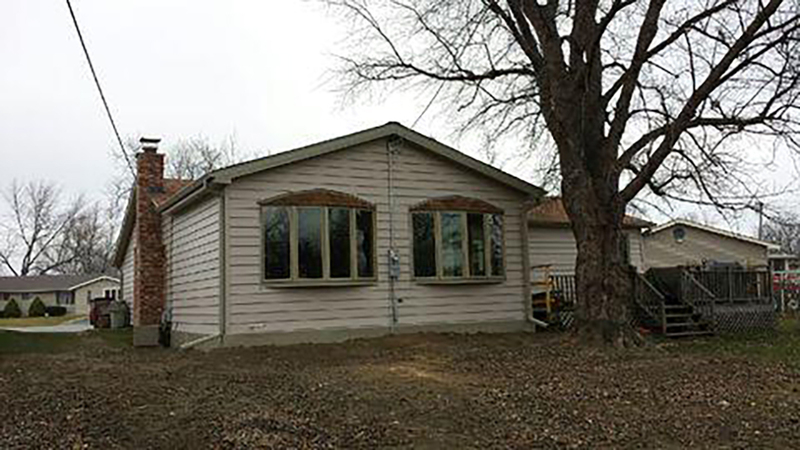 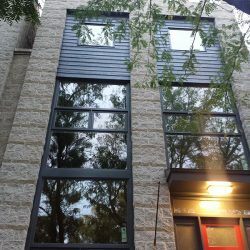 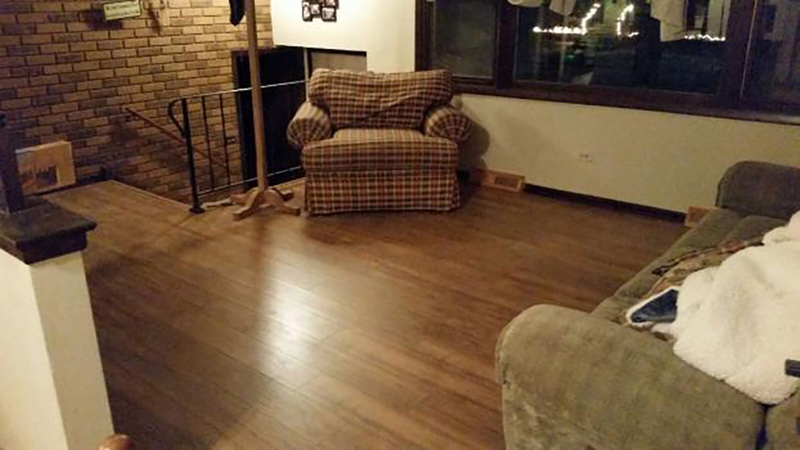 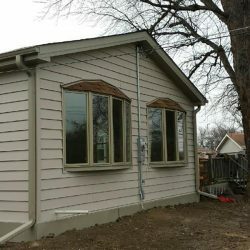 Chicago Windows: Removed severely rotted windows and replaced with new windows. 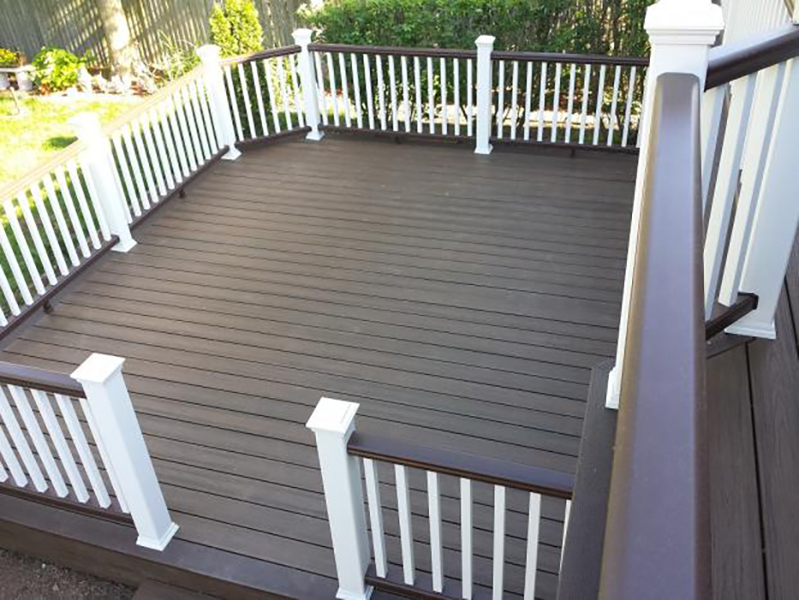 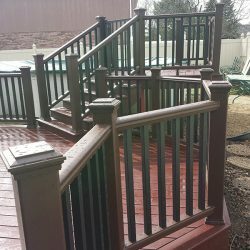 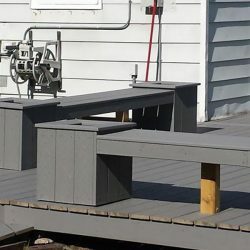 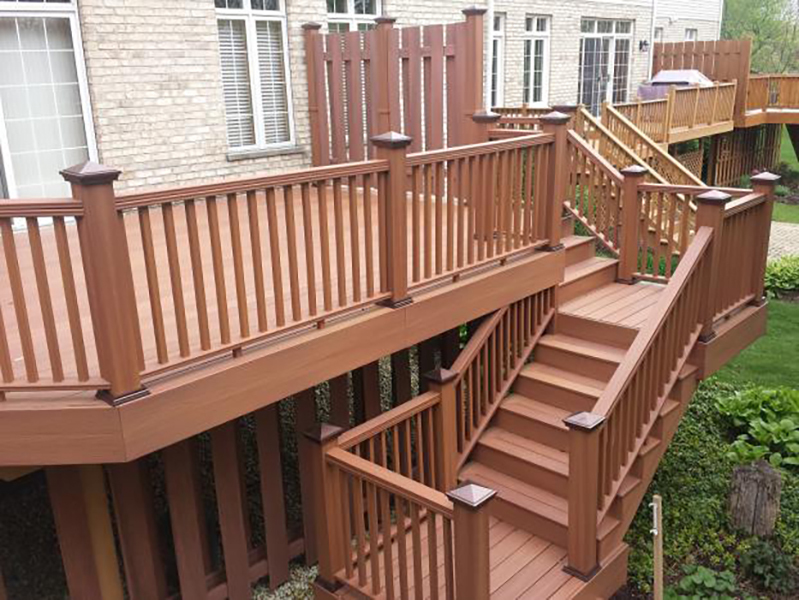 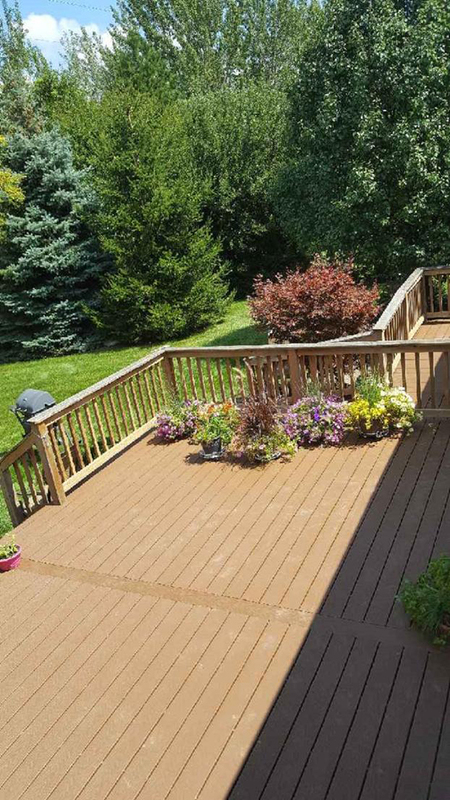 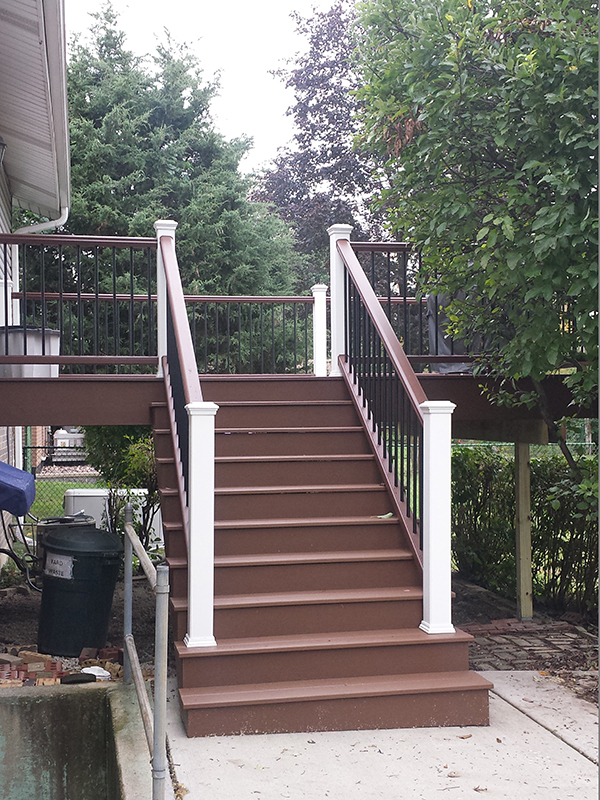 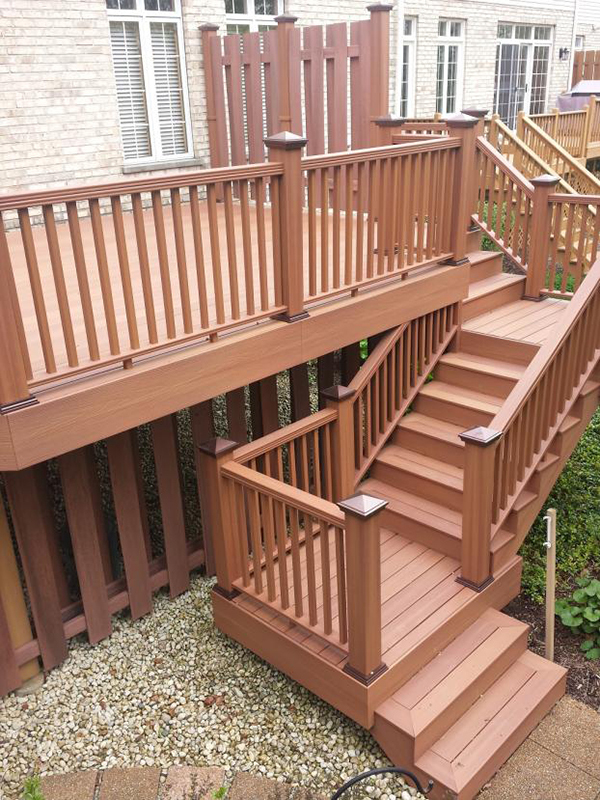 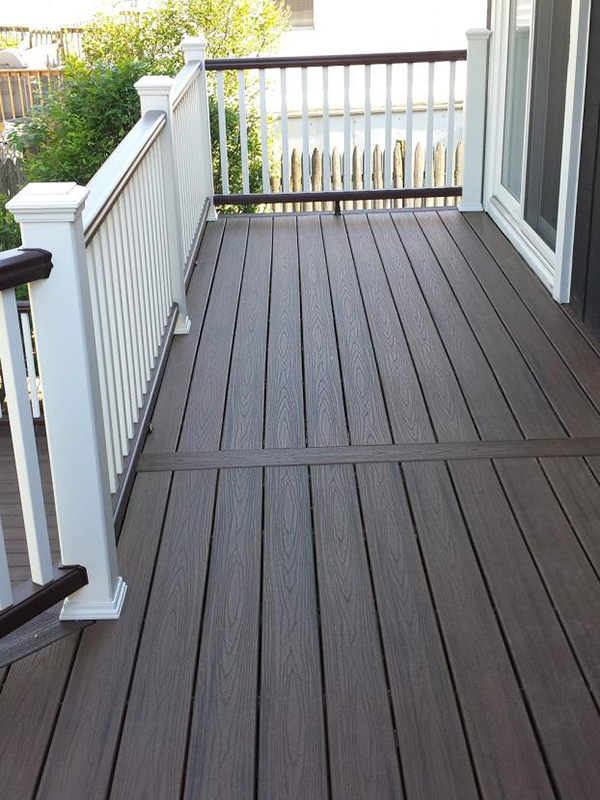 Tinley Park Trex Deck: Trex Select deck in Madeira with Vintage Lantern railings and black aluminum spindles. 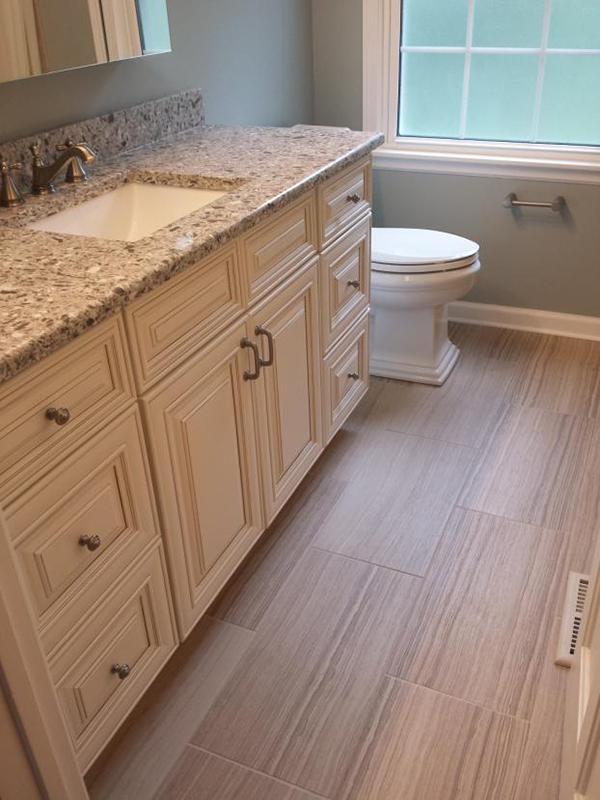 Homer Glen Master Bathroom: Redesigned our customers master bath with a new layout allowing for their custom shower with seat and elevated bathtub. 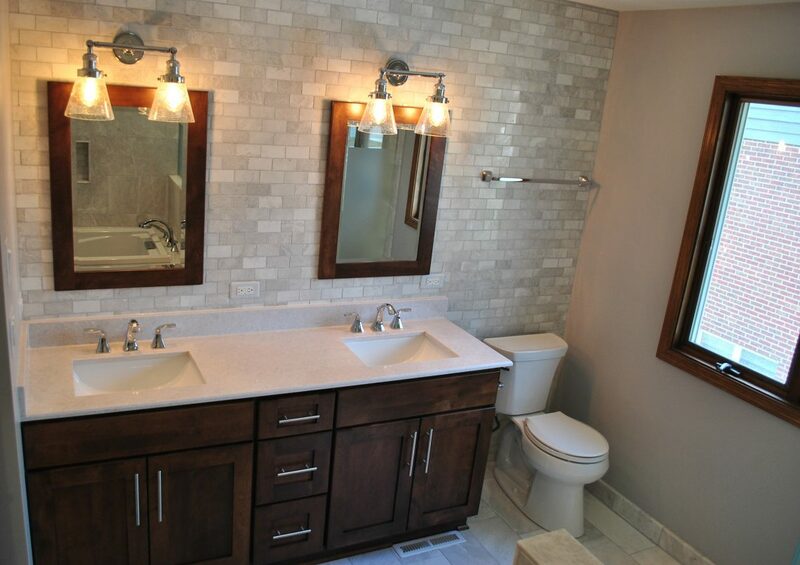 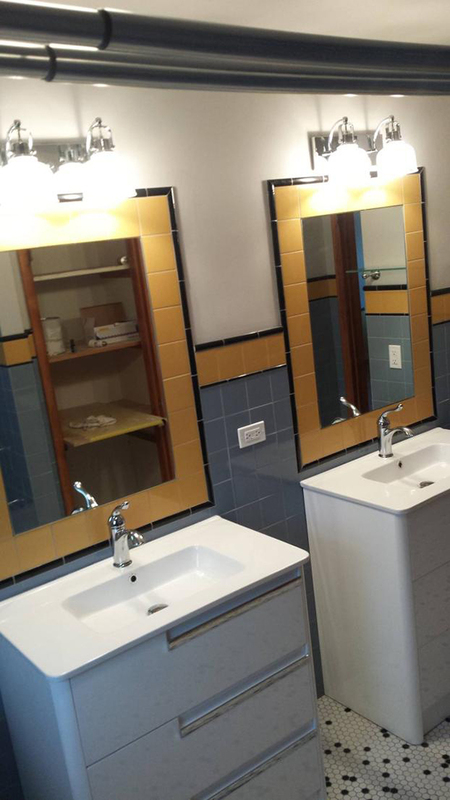 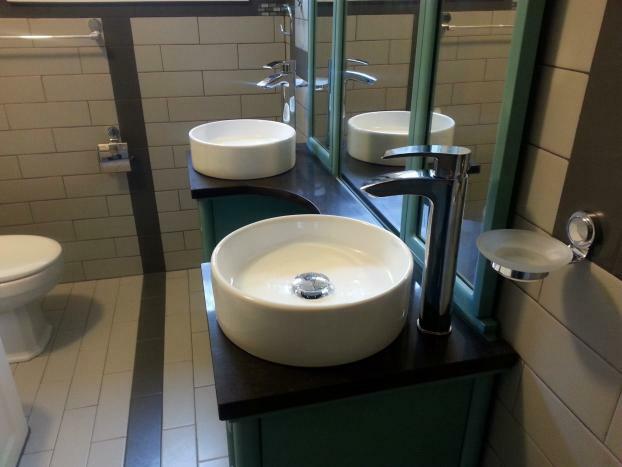 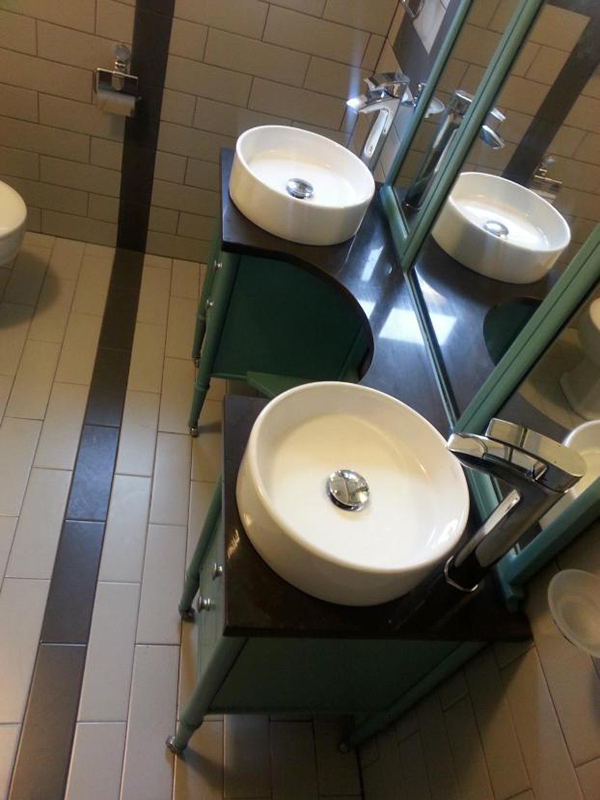 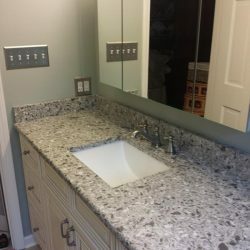 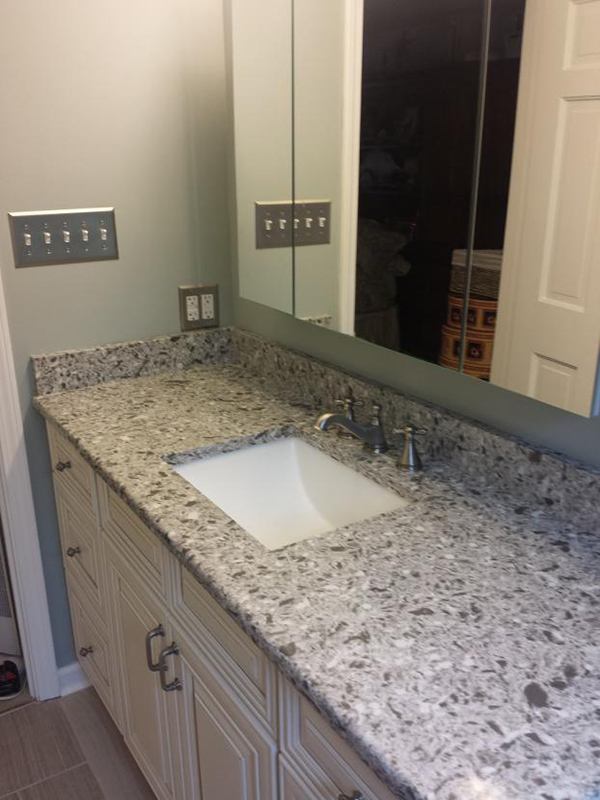 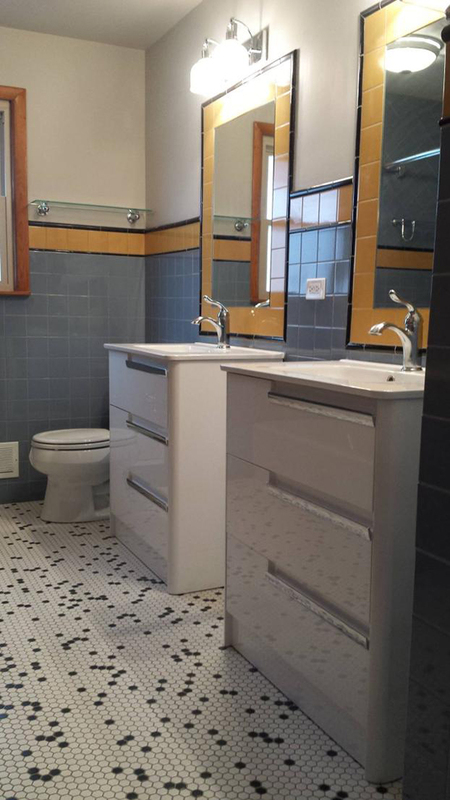 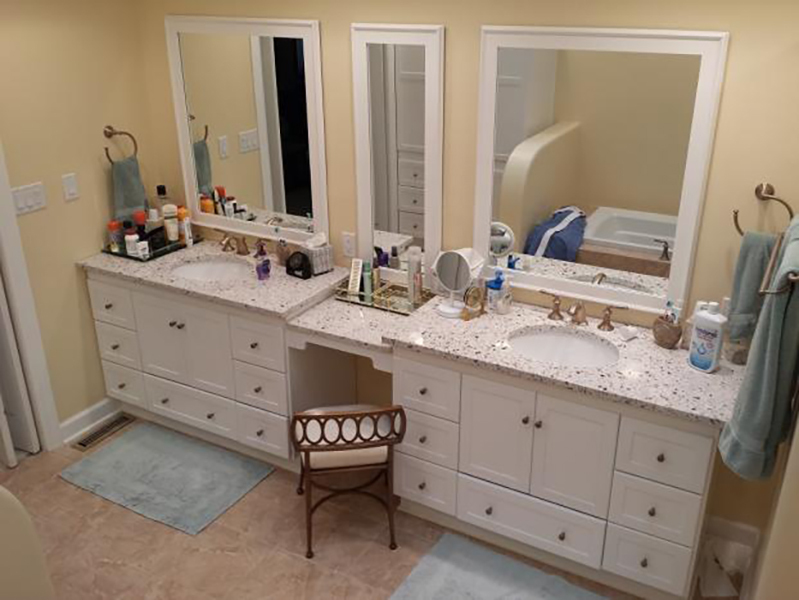 New gorgeous marble tile throughout and new double bowl vanity, lights, mirrors and more!